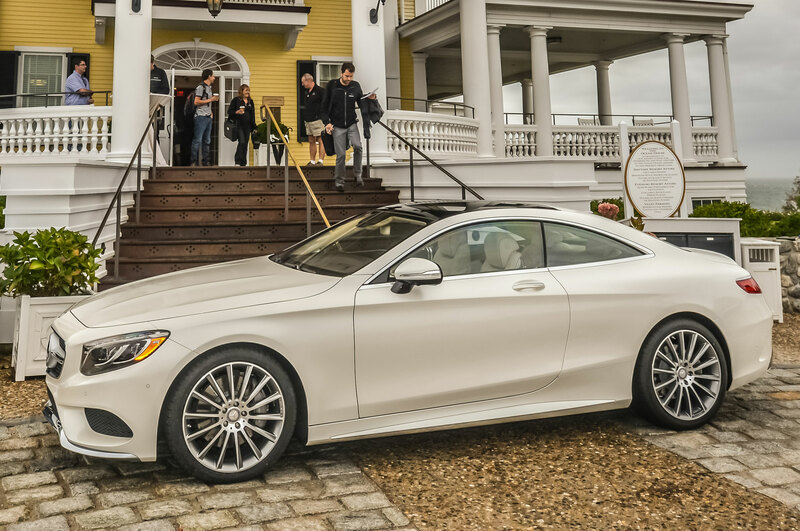 WESTERLY, Rhode Island — In the Watch Hill Historical Society’s tome, “Watch Hill Then and Now,” one learns that the Rhode Island seaside resort town was platted and promoted largely by a Cincinnati syndicate, which controlled the development to create a resort that would maintain the beautiful surroundings. 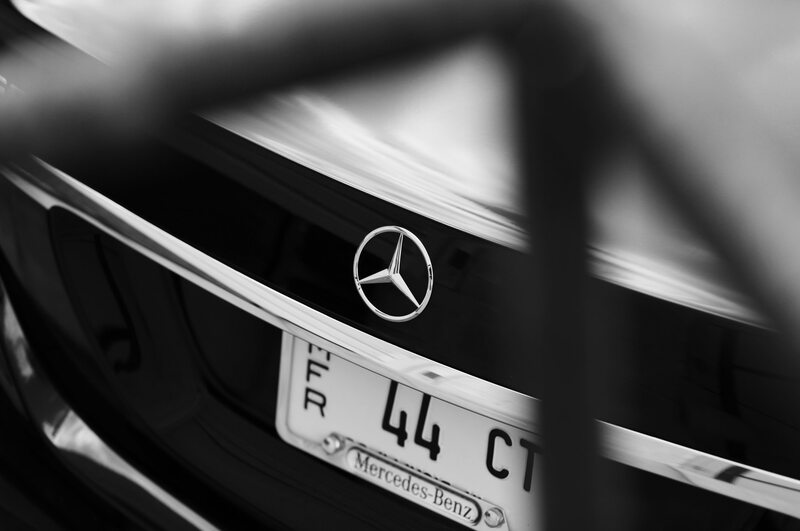 It also carefully selected the clientele, to ensure that Watch Hill would be an escape from the working class. 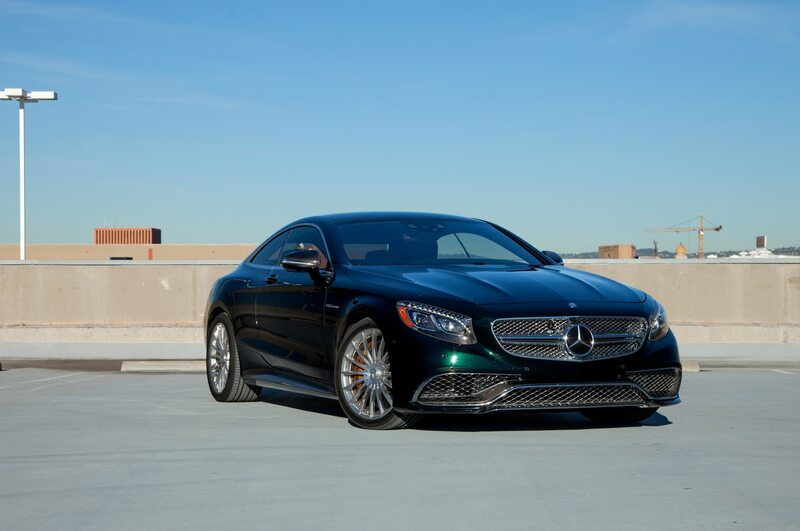 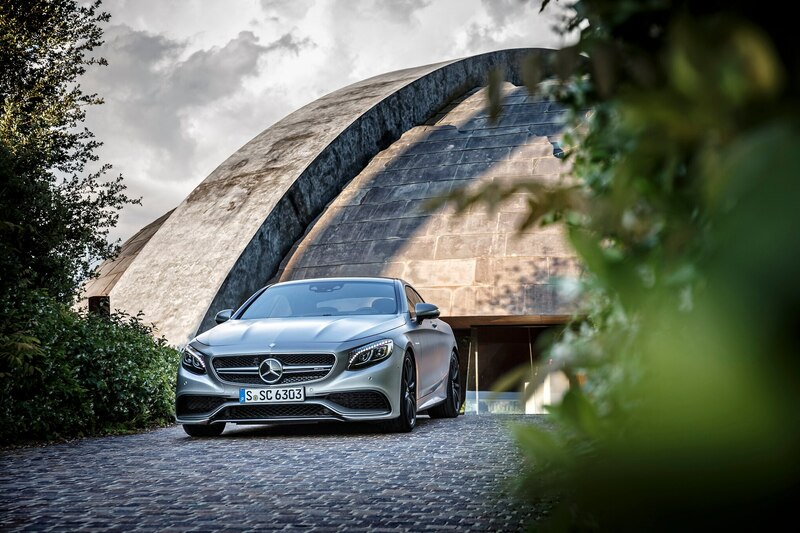 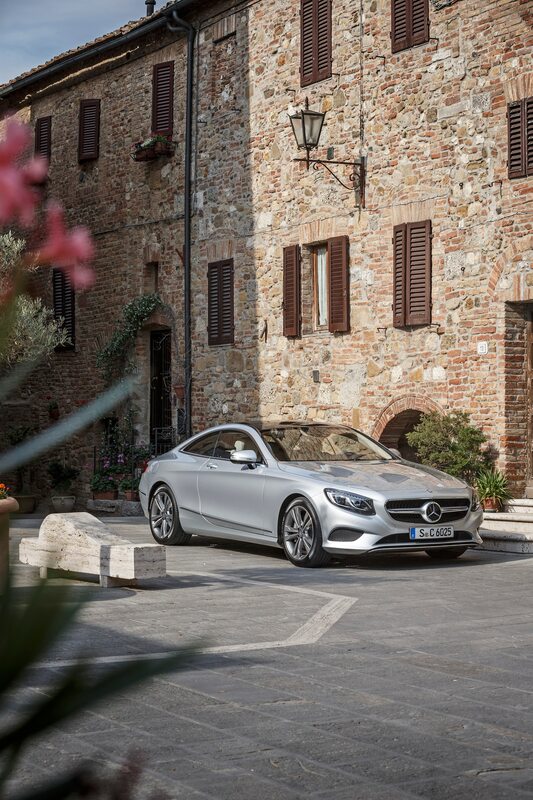 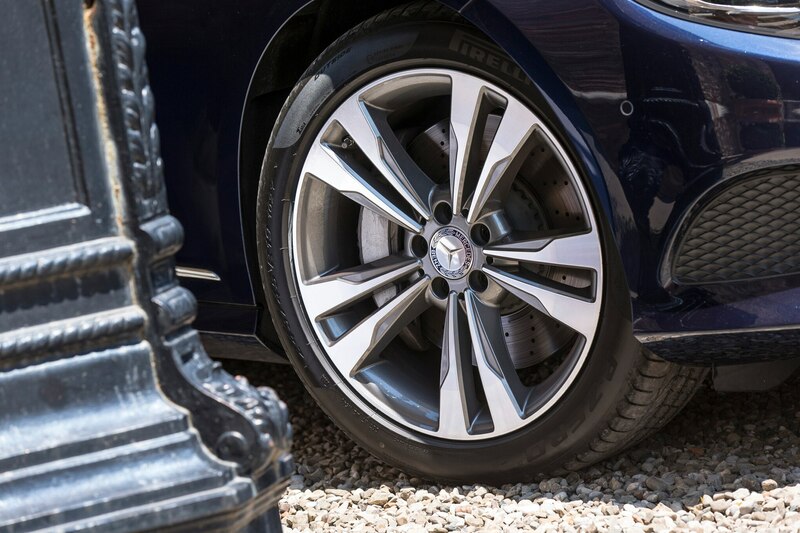 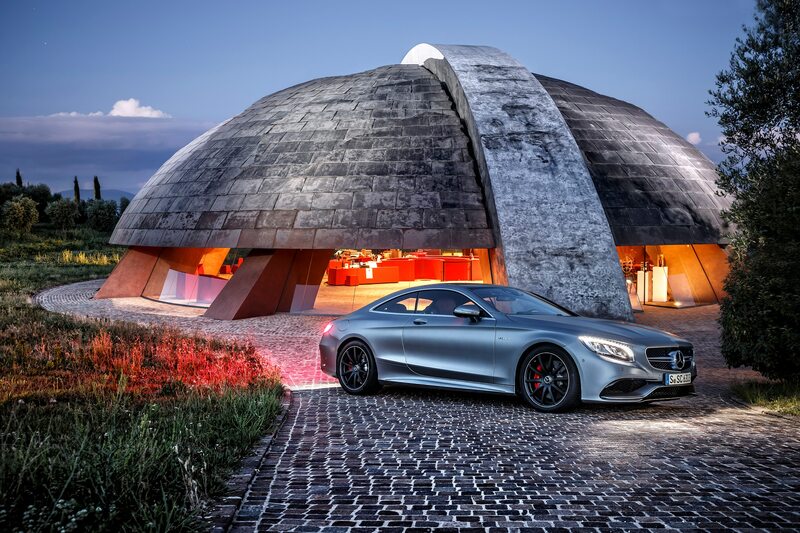 More than a century later, Watch Hill is still beautiful and still caters to the moneyed elite, making it the perfect spot to launch the 2015 Mercedes-Benz S-Class coupe. 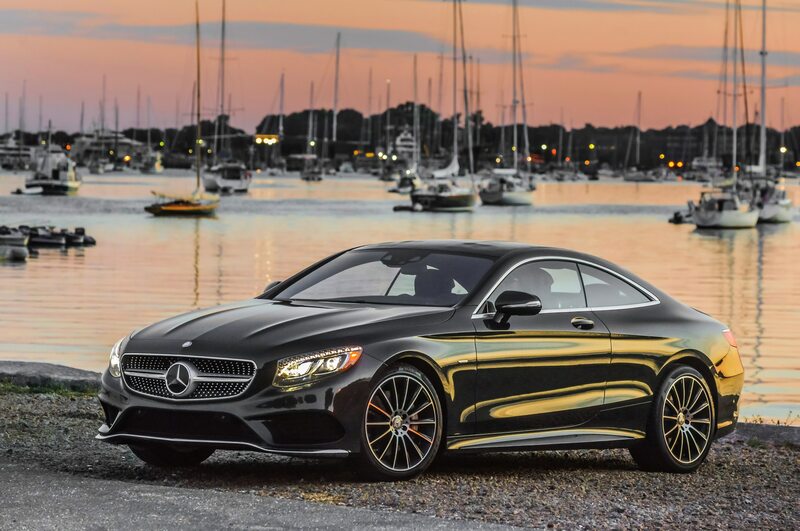 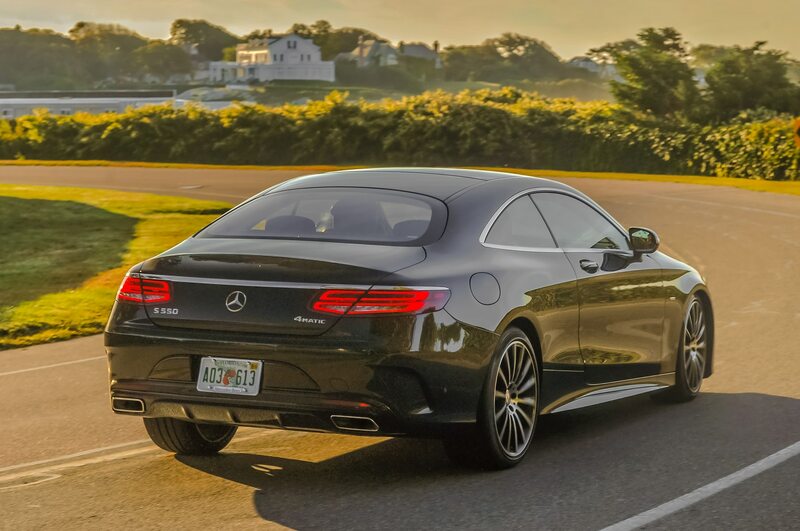 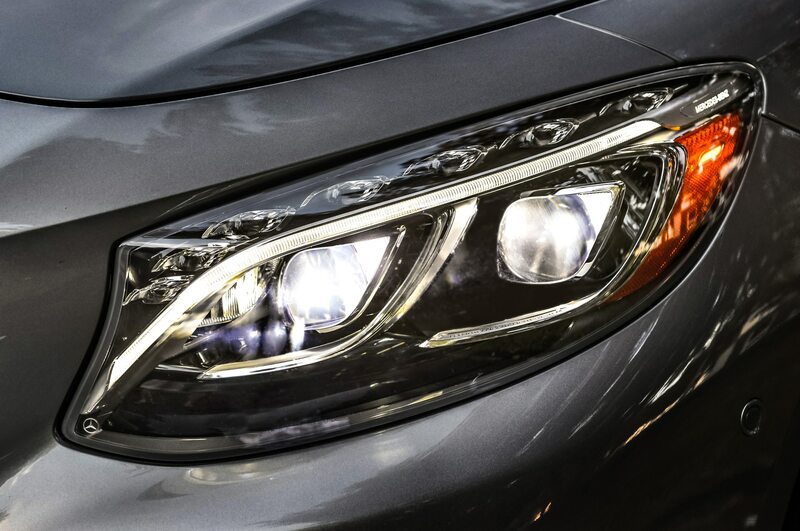 Like the original lots in Watch Hill, the 2015 S-Class coupe is a car that is purchased by the “right kind of people.” (Median household income for this car is the highest of any Mercedes-Benz model at $500,000 to $600,000 a year.) 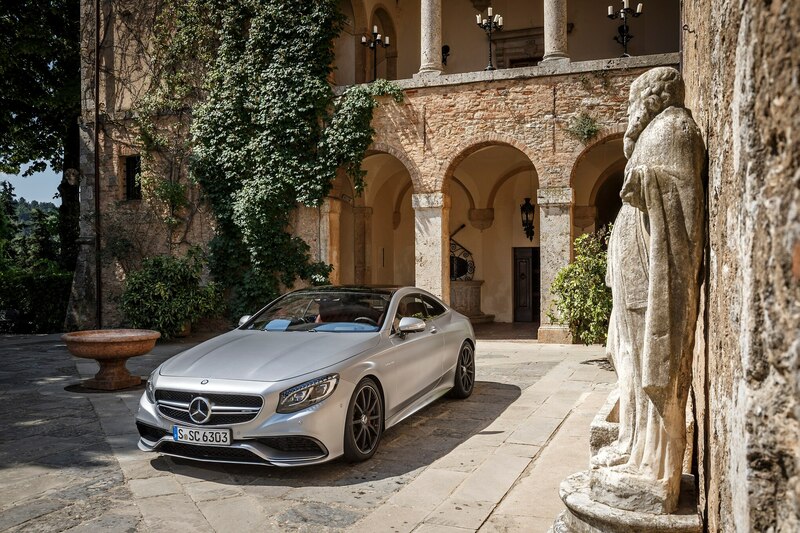 And it ensconces those people in some pretty beautiful surroundings. 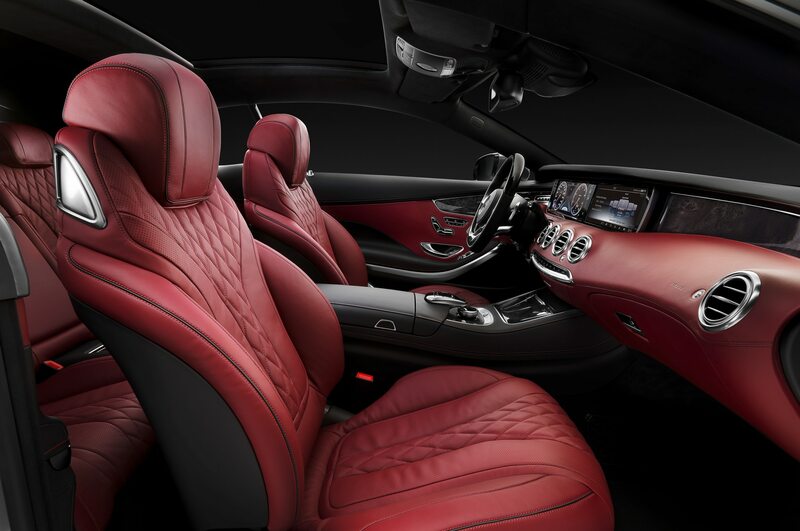 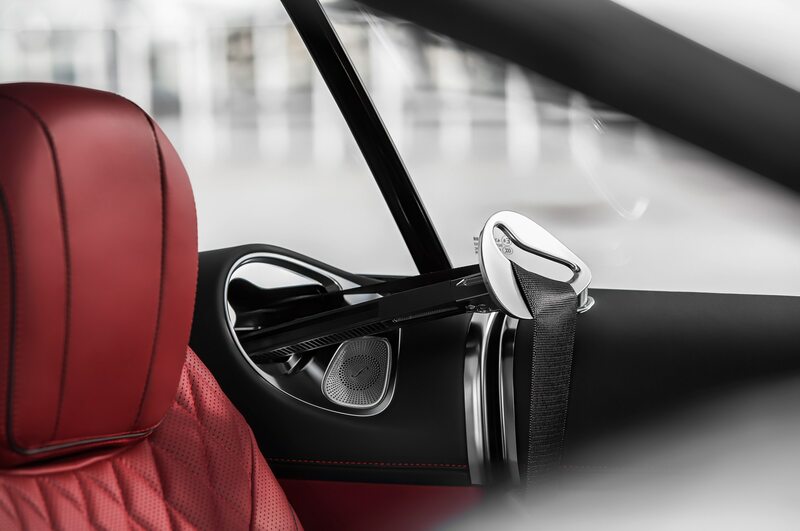 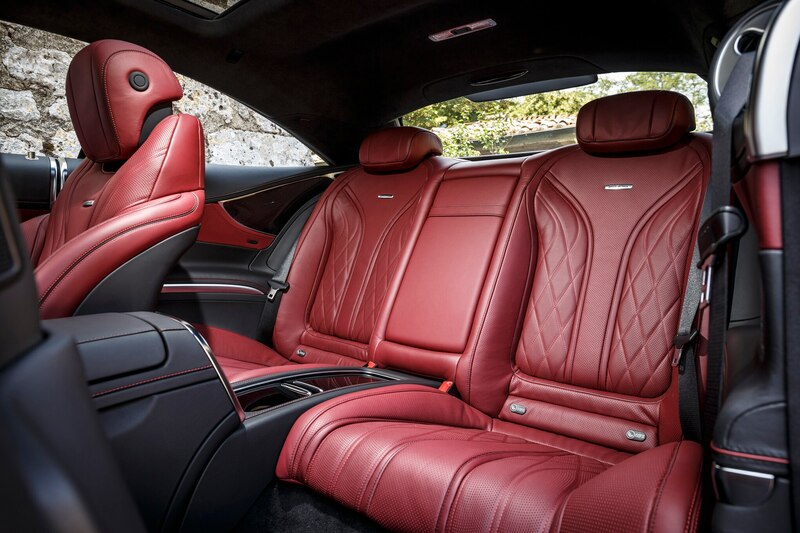 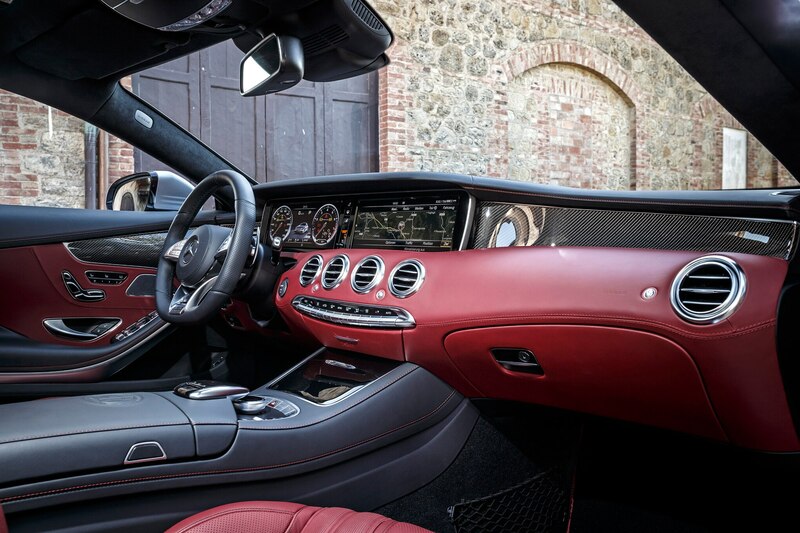 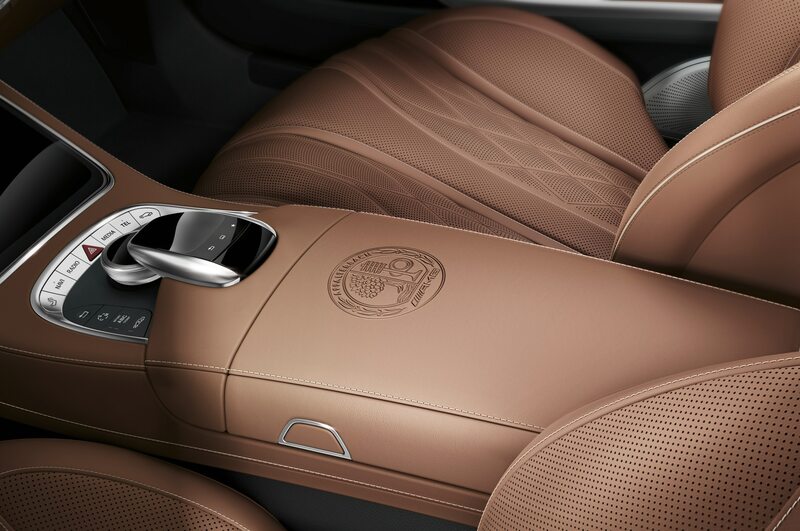 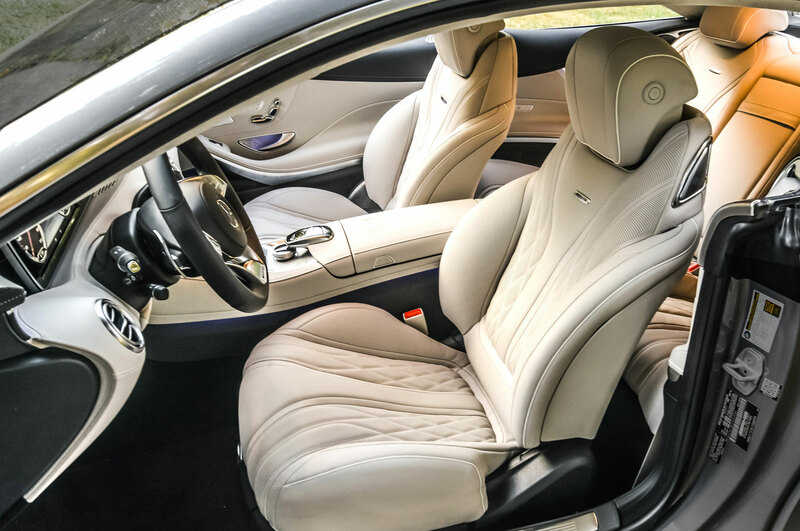 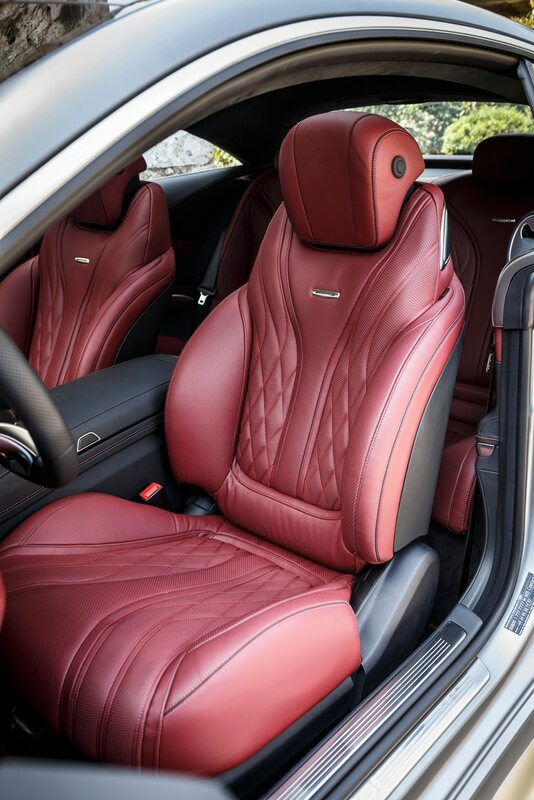 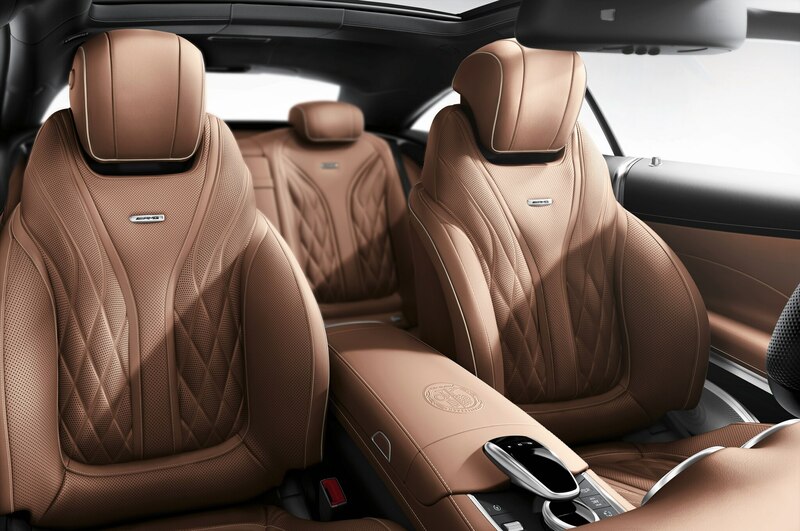 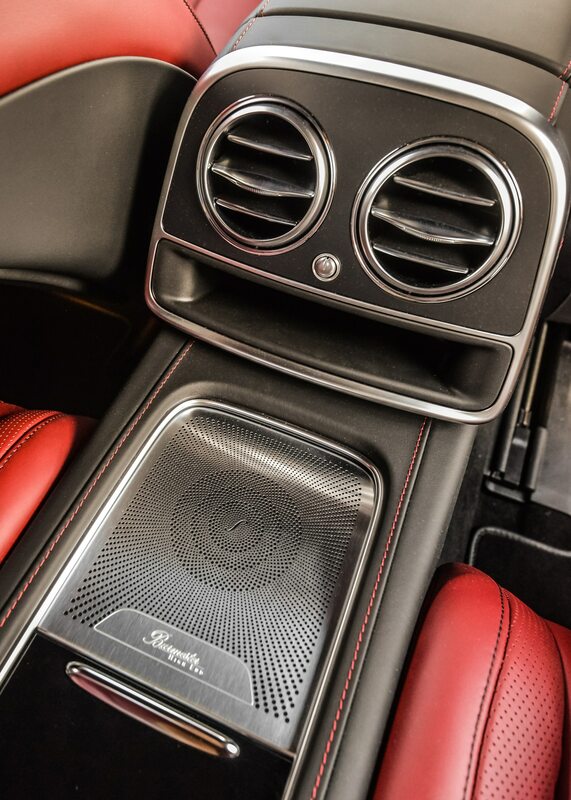 The coupe’s interior is a bespoke design, not lifted from the S-Class sedan, and it puts competitors such as the Bentley Continental GT and BMW M6 in the shade. 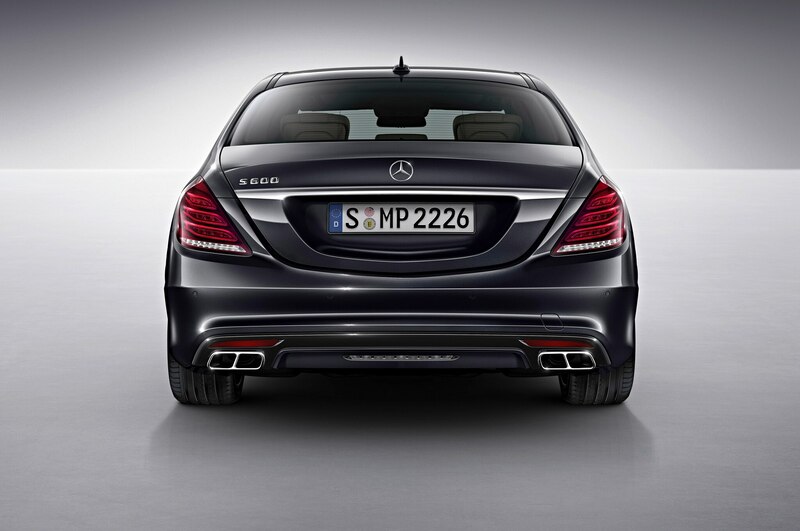 The aesthetic is modern, with sweeping curves and glossy black trim set off with brushed metal. 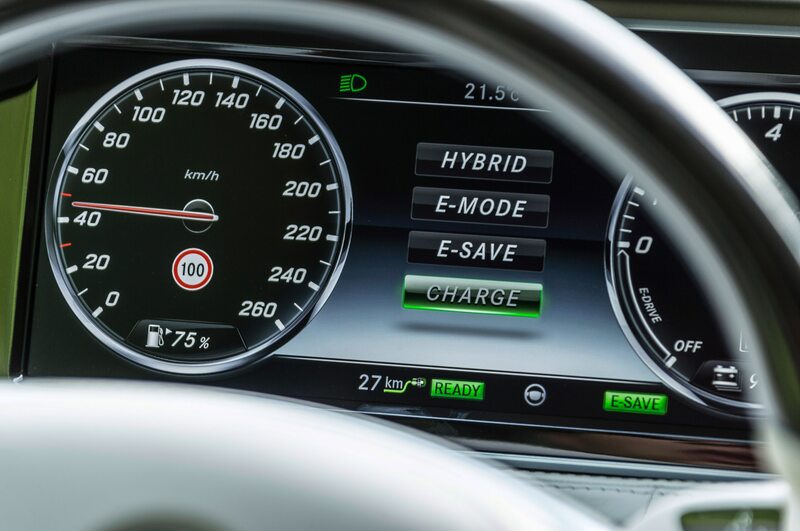 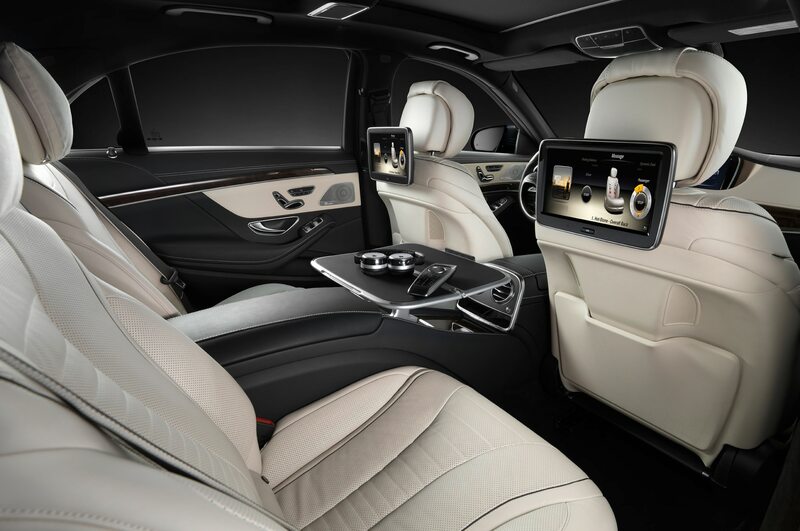 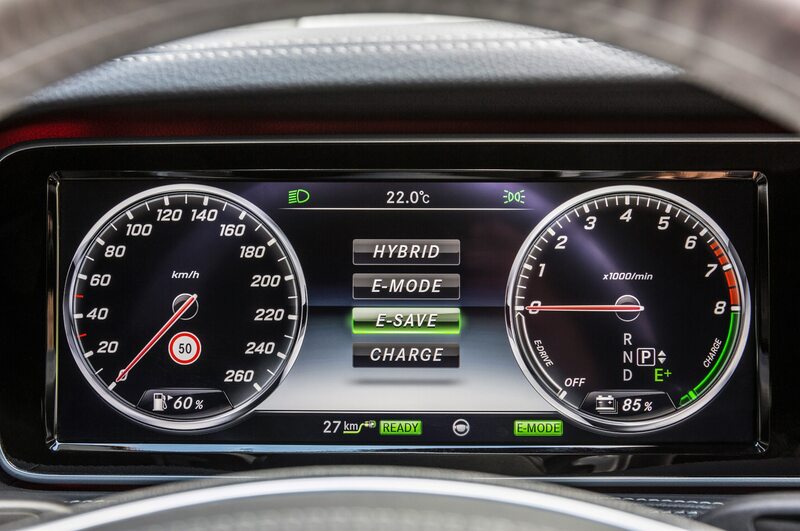 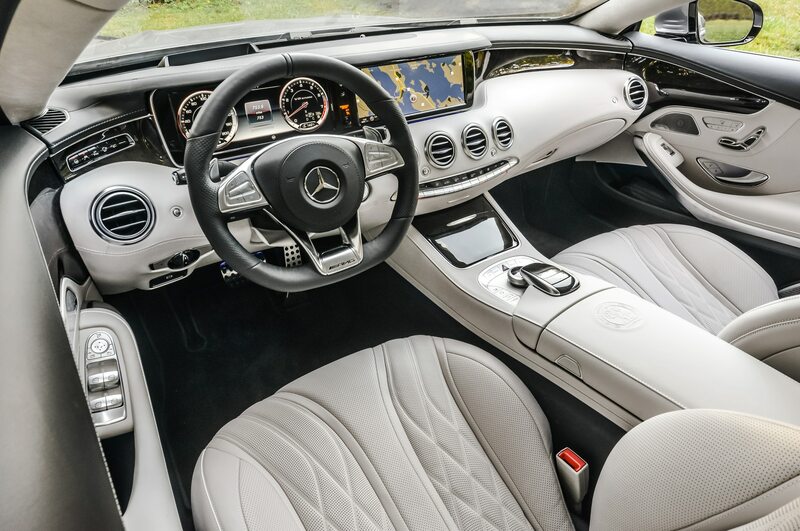 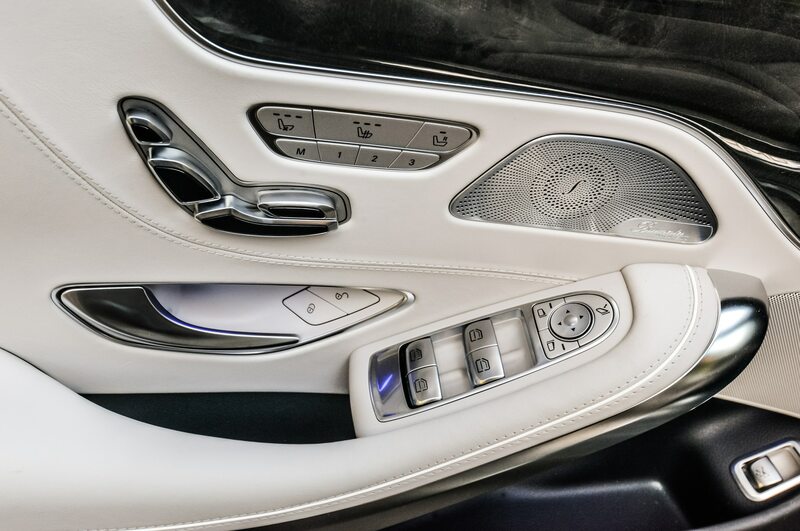 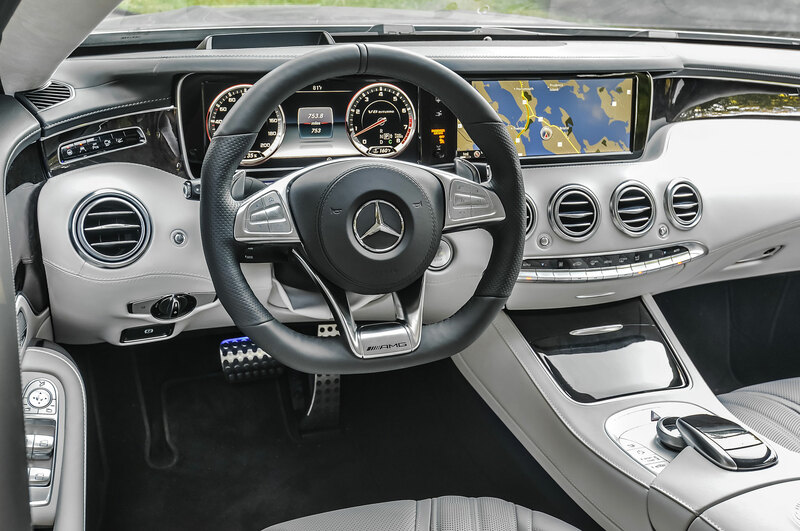 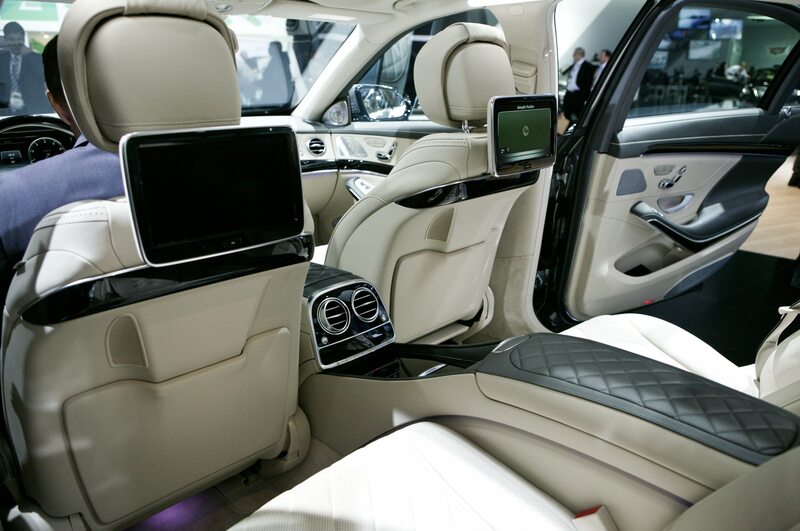 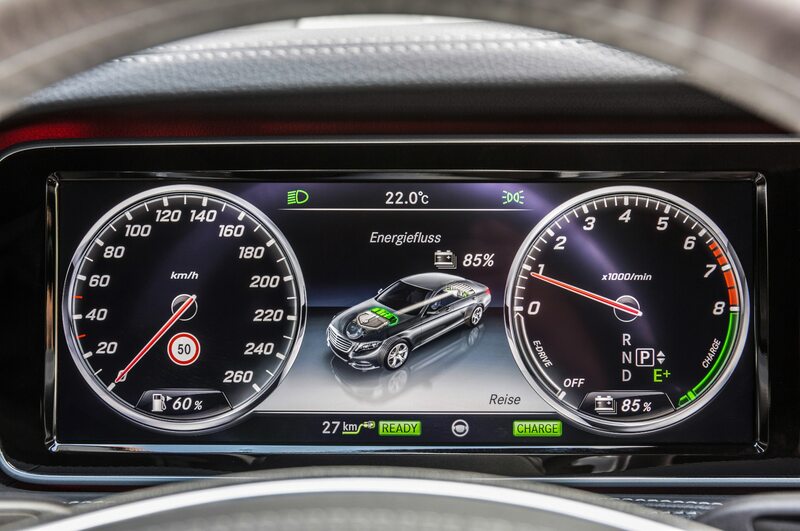 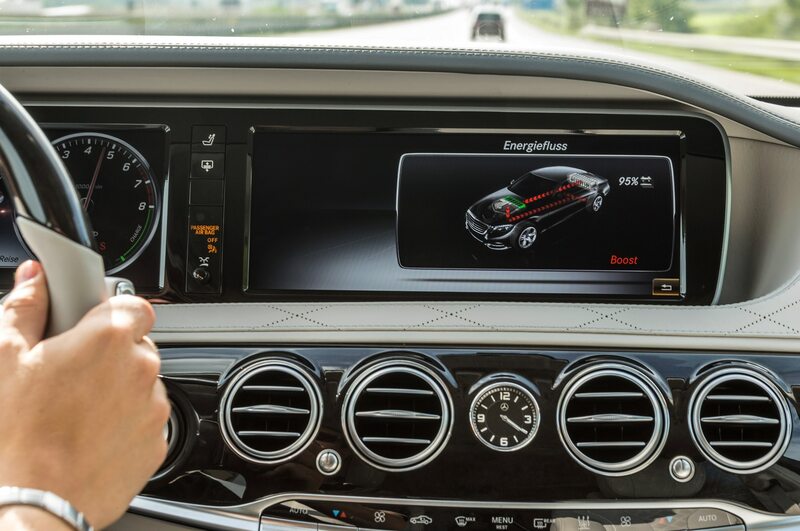 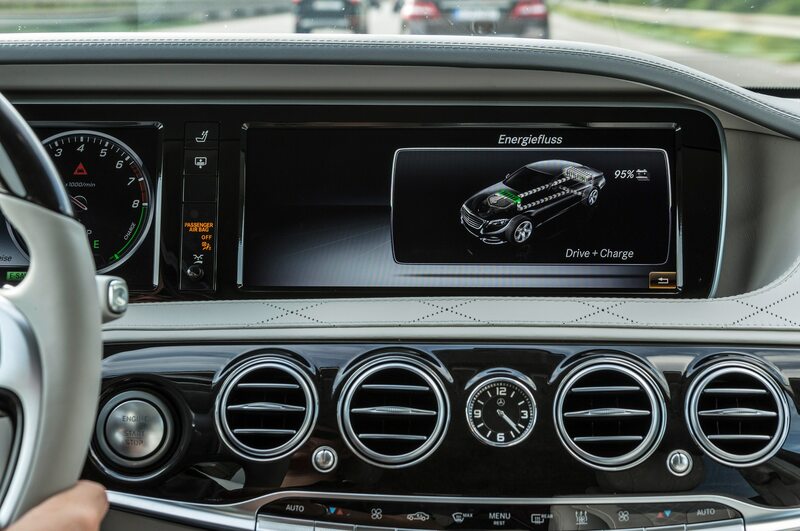 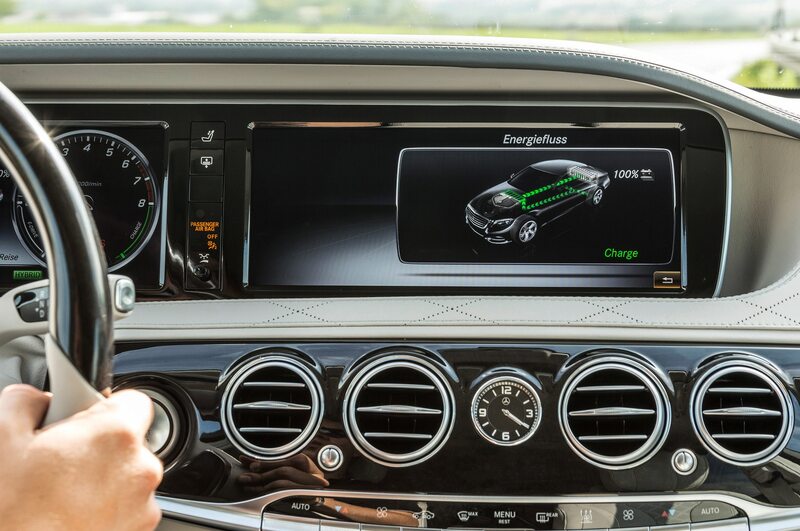 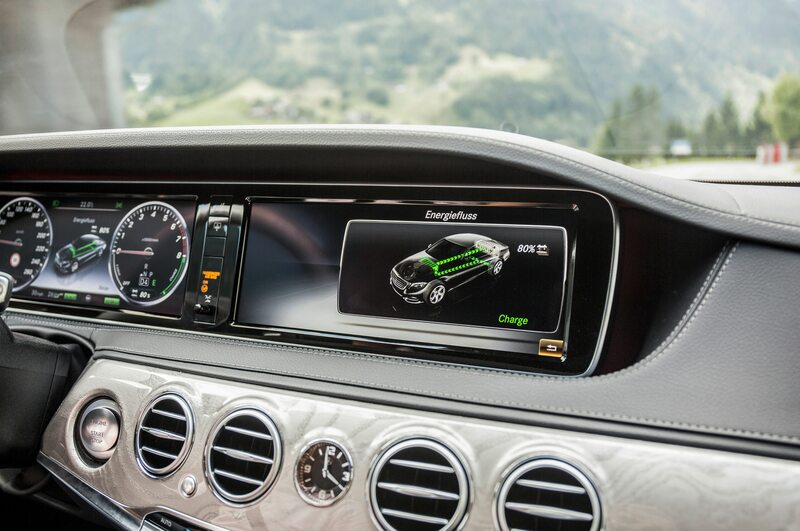 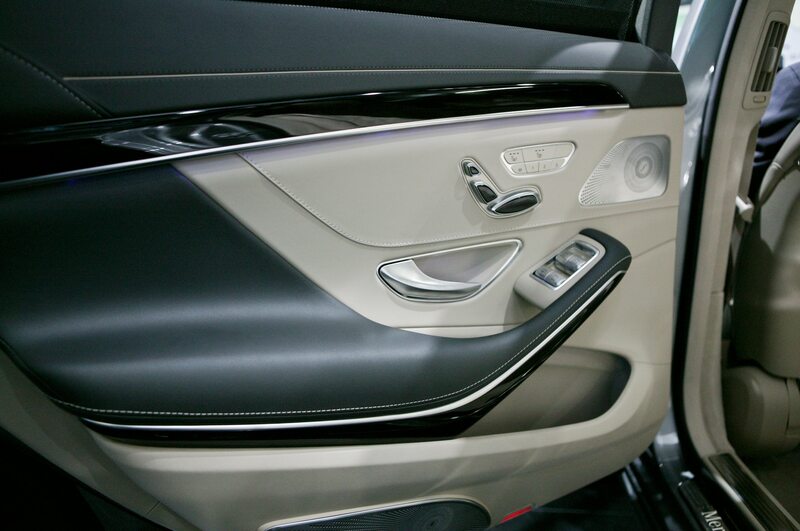 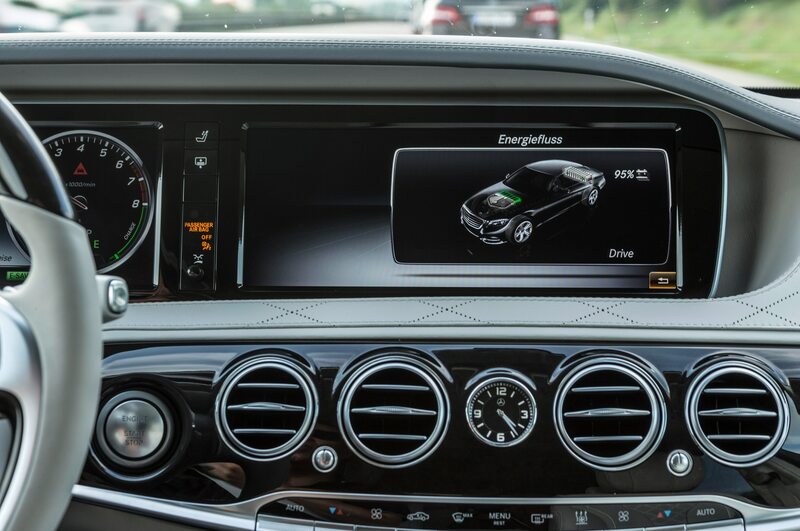 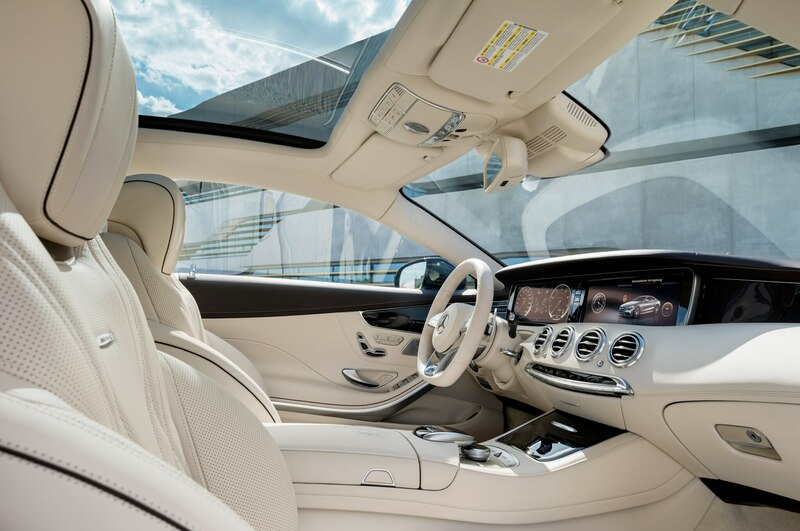 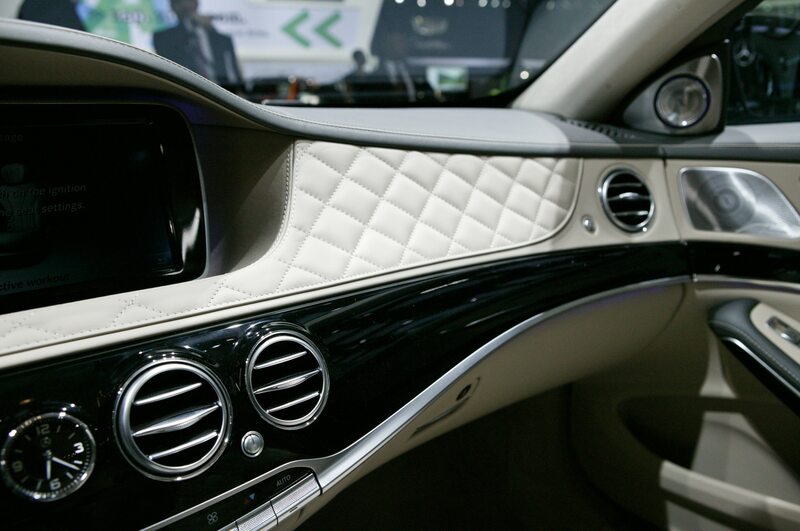 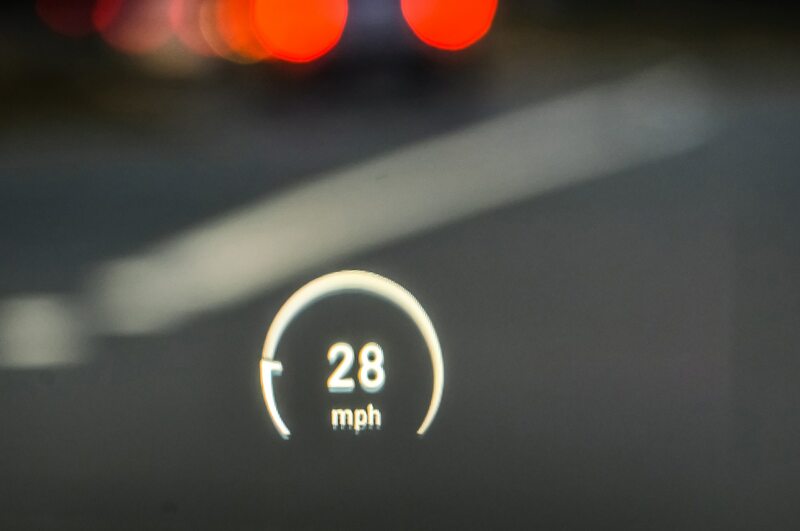 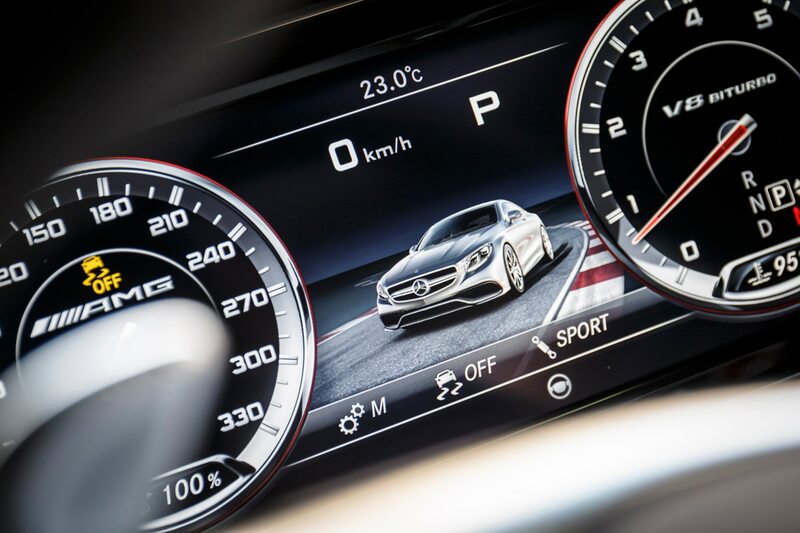 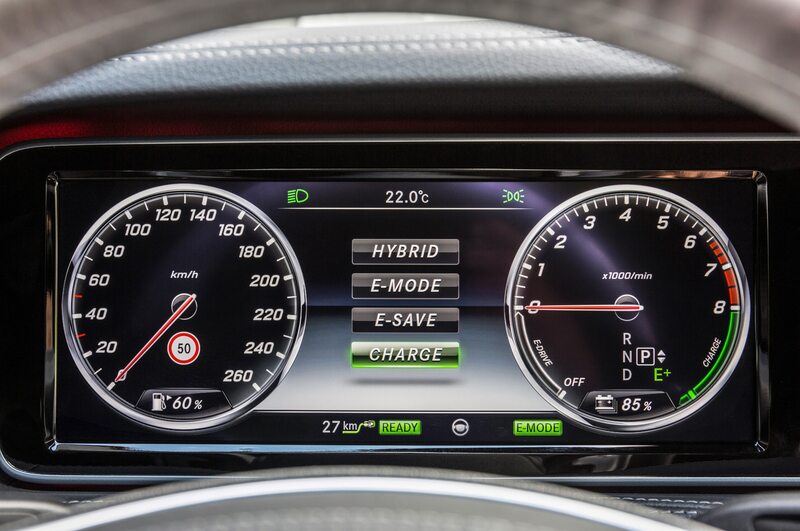 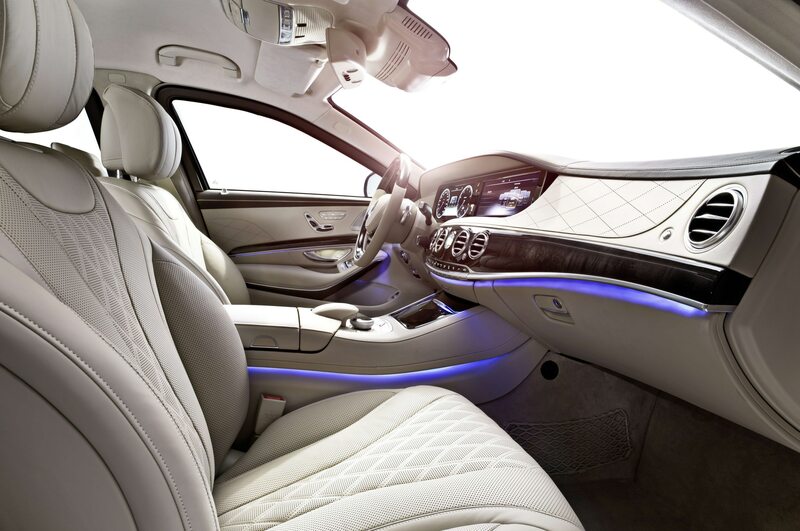 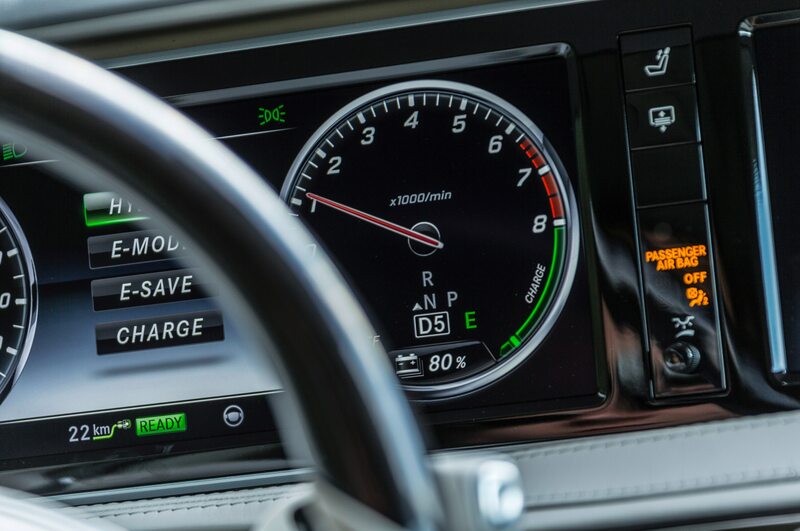 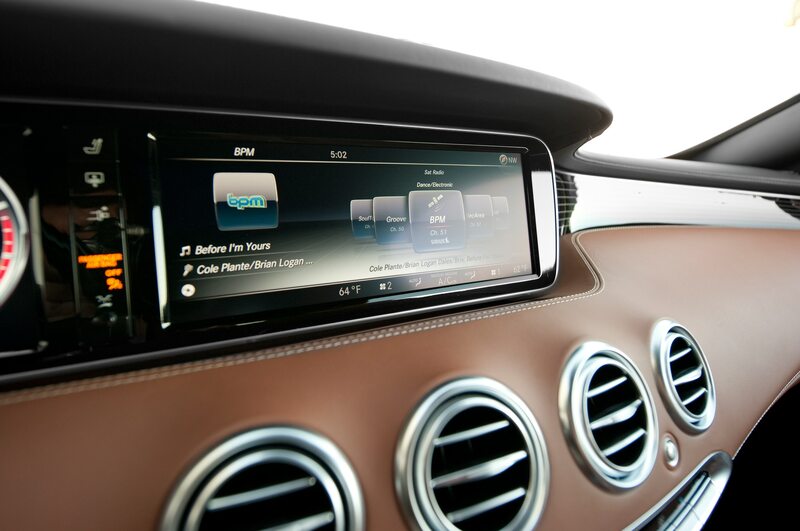 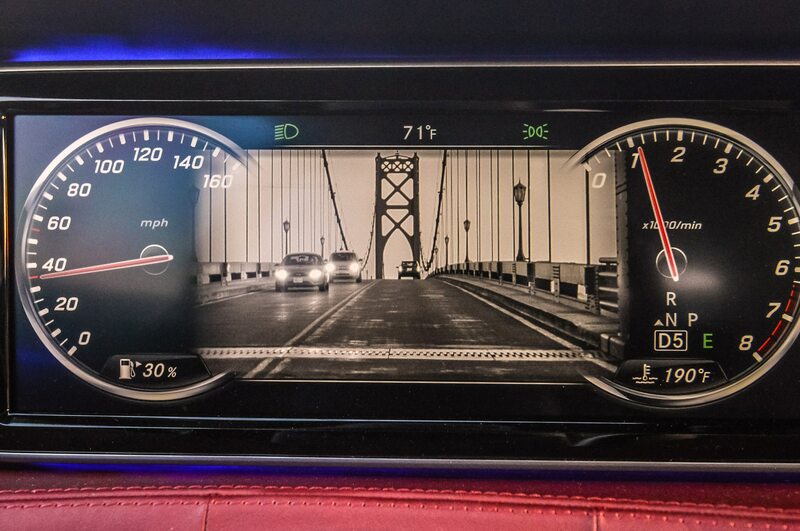 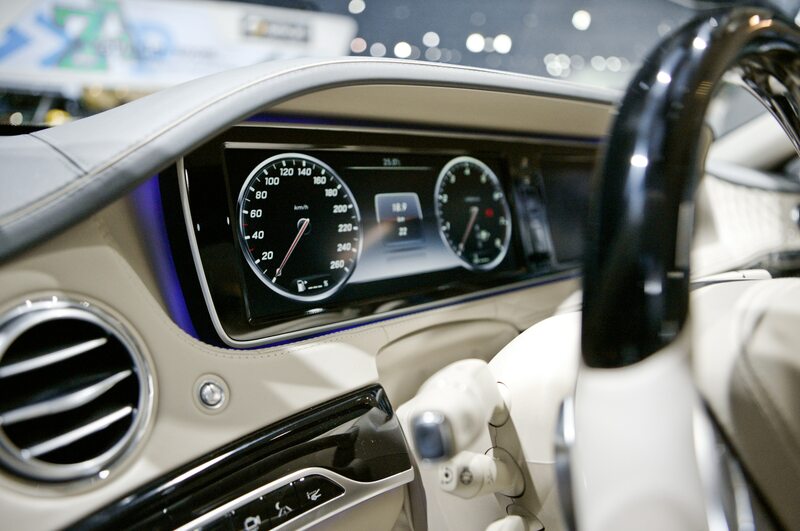 As in the S-Class sedan, two giant screens dominate the coupe’s dashboard, one for the virtual gauge cluster and one for the navigation/infotainment system. 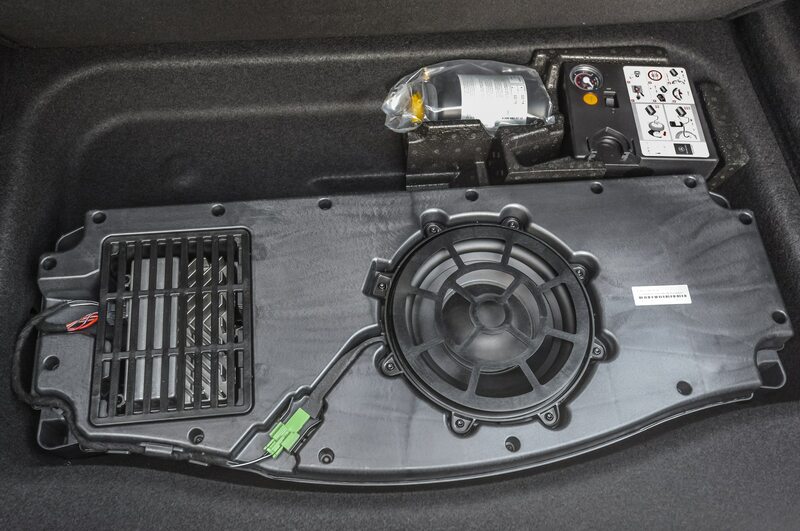 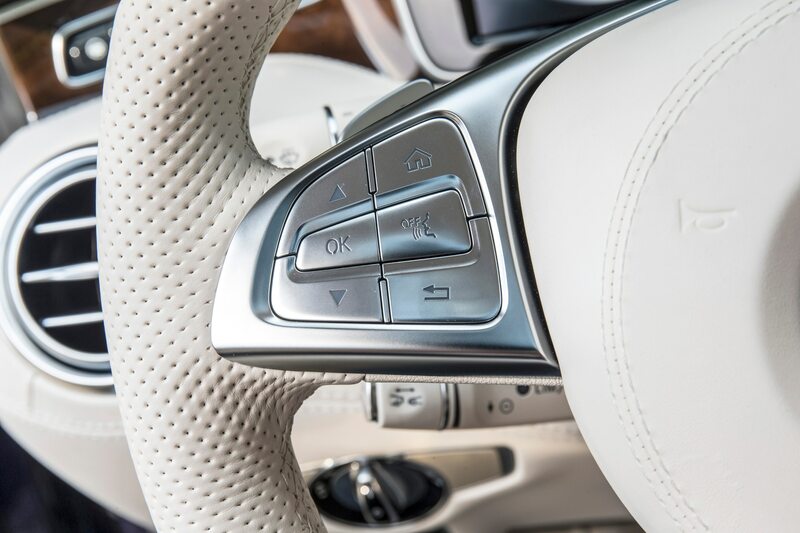 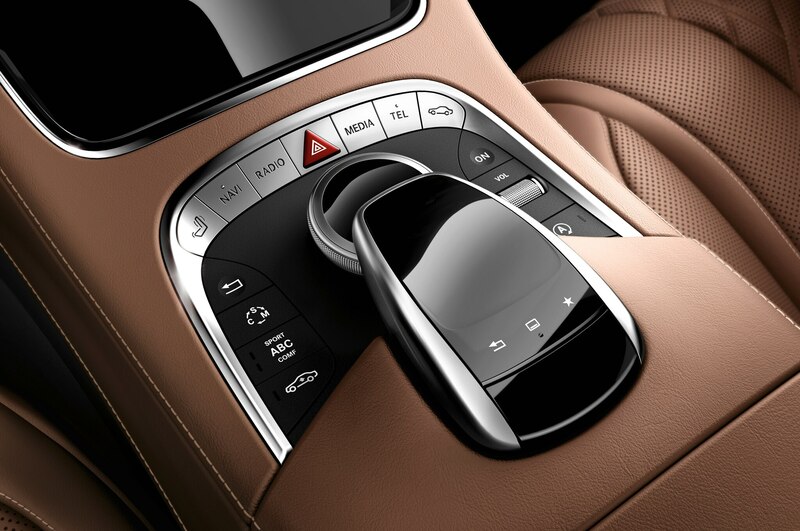 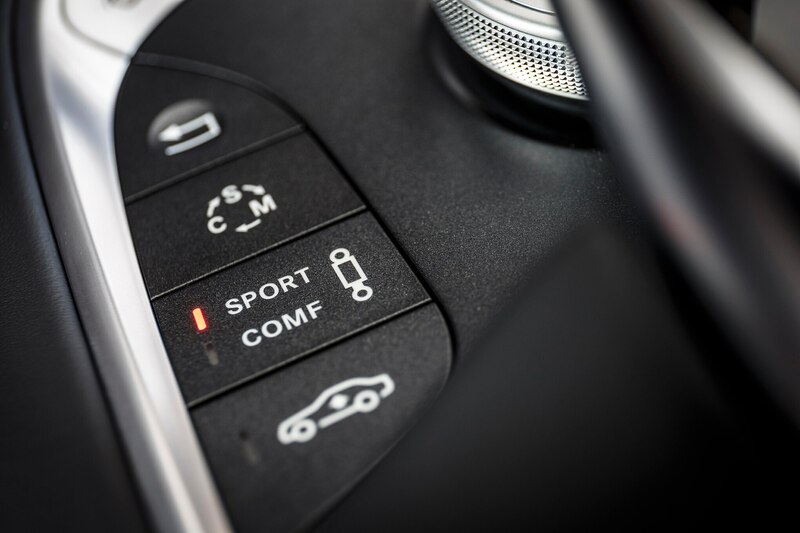 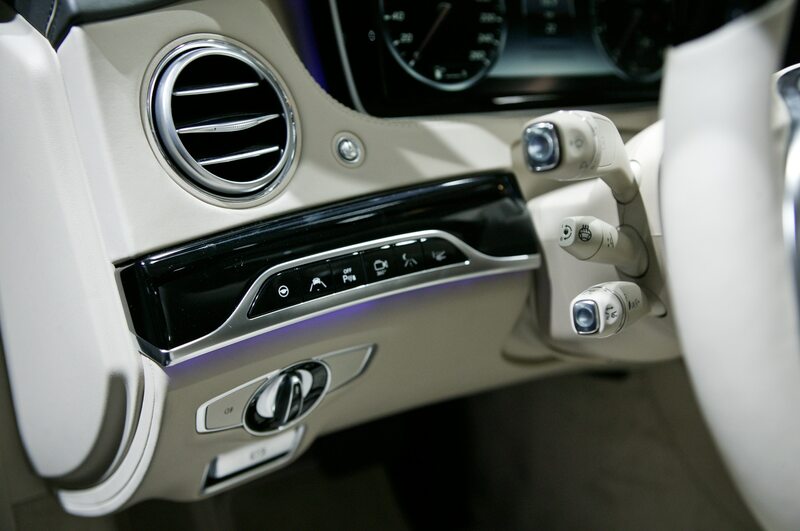 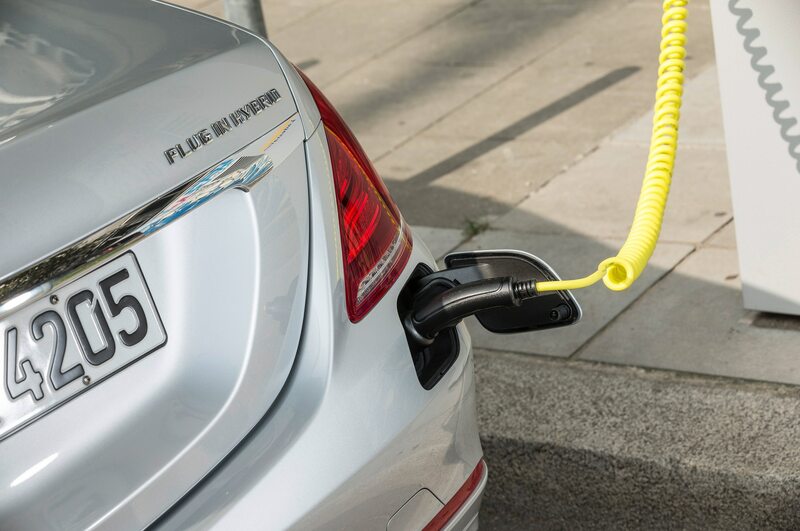 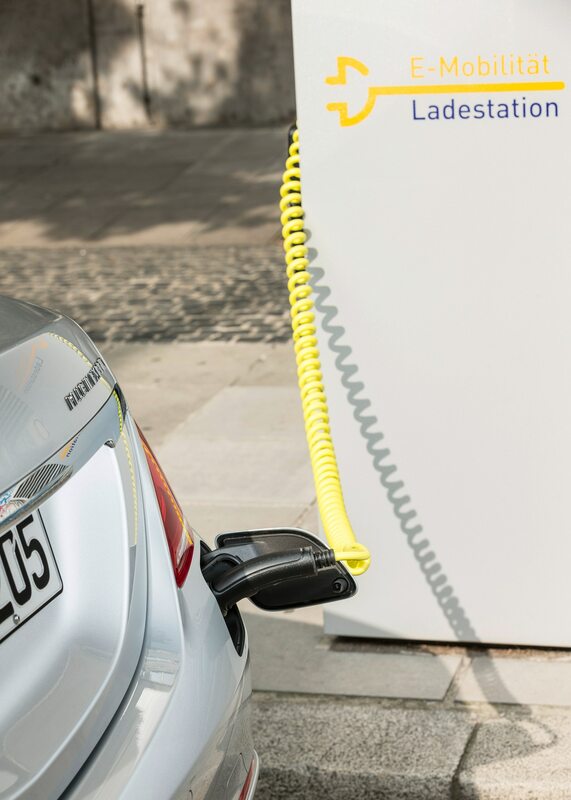 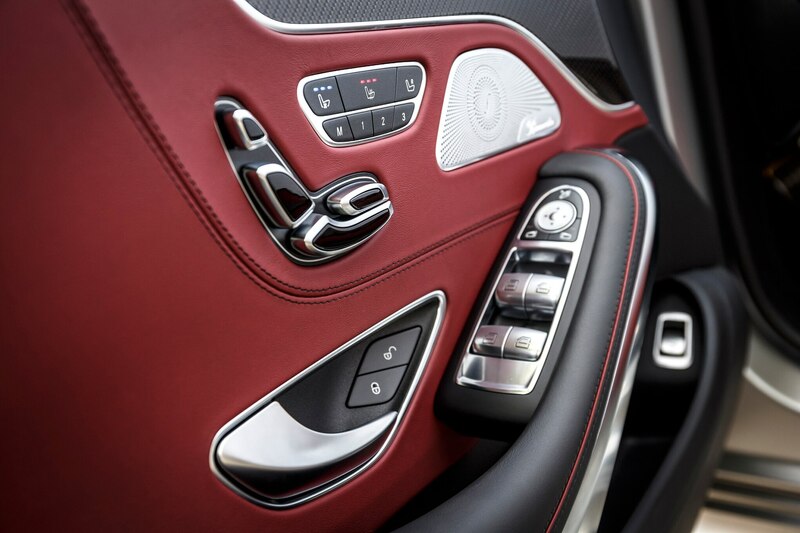 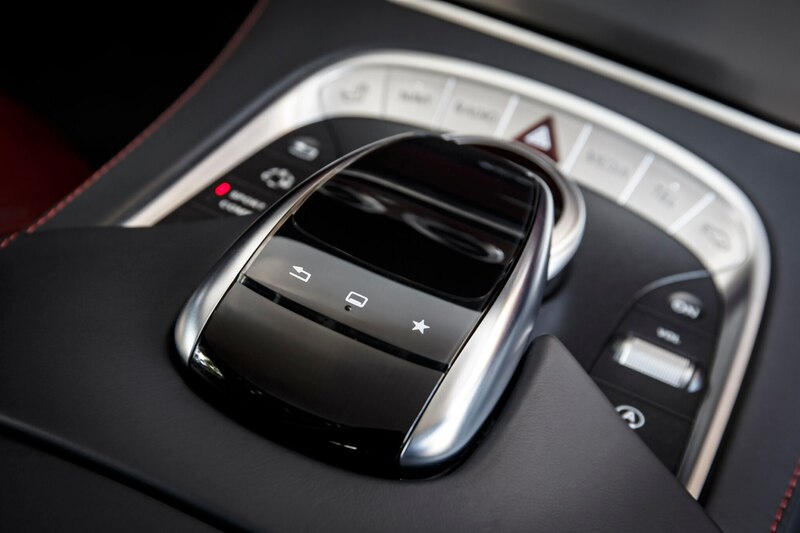 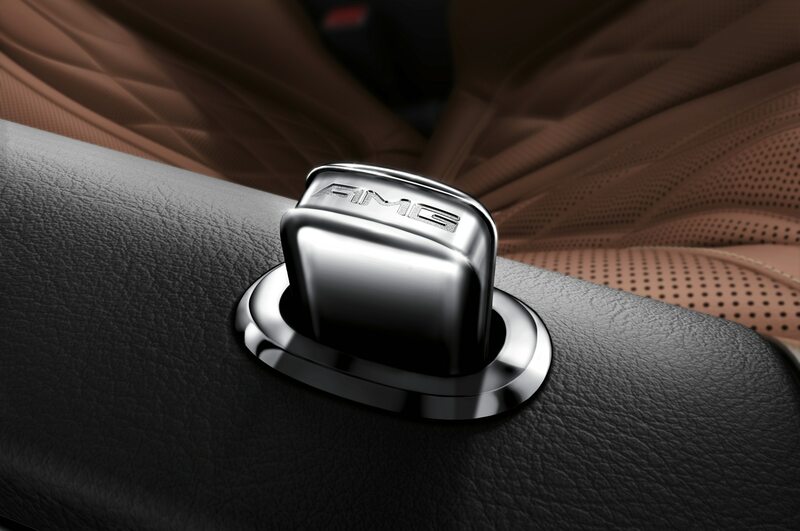 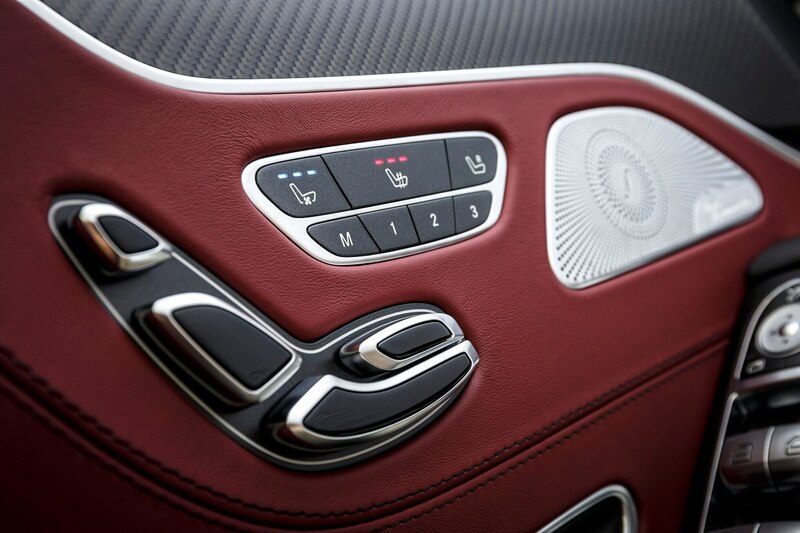 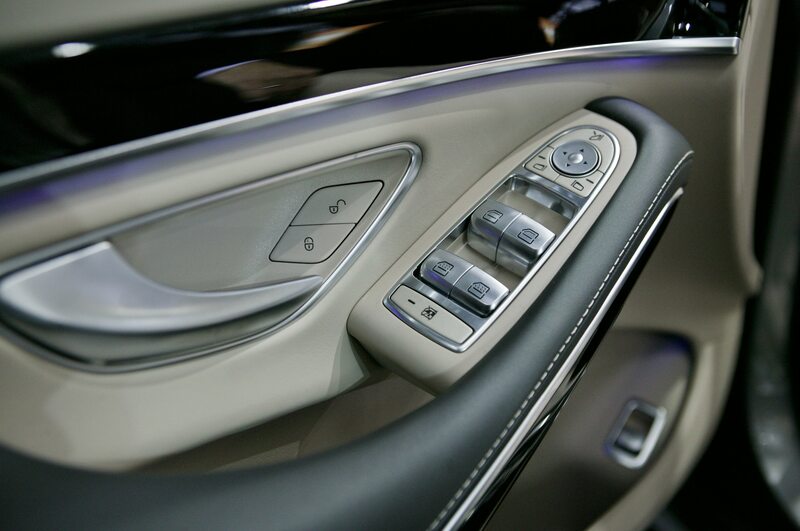 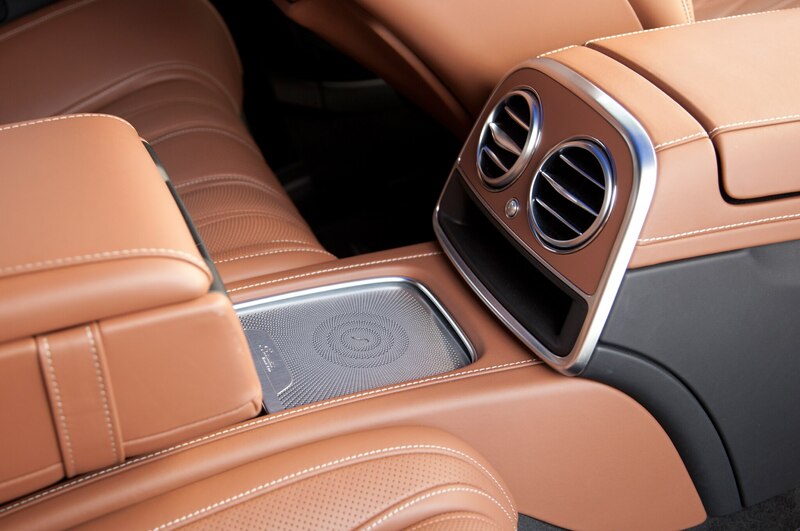 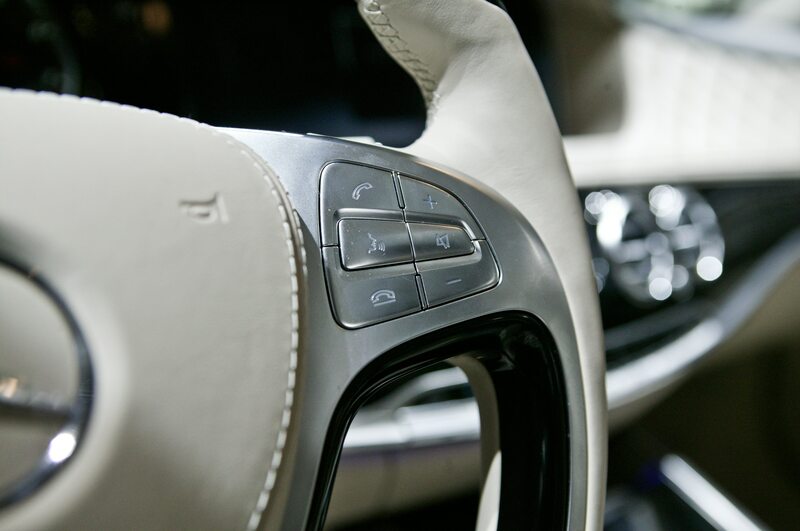 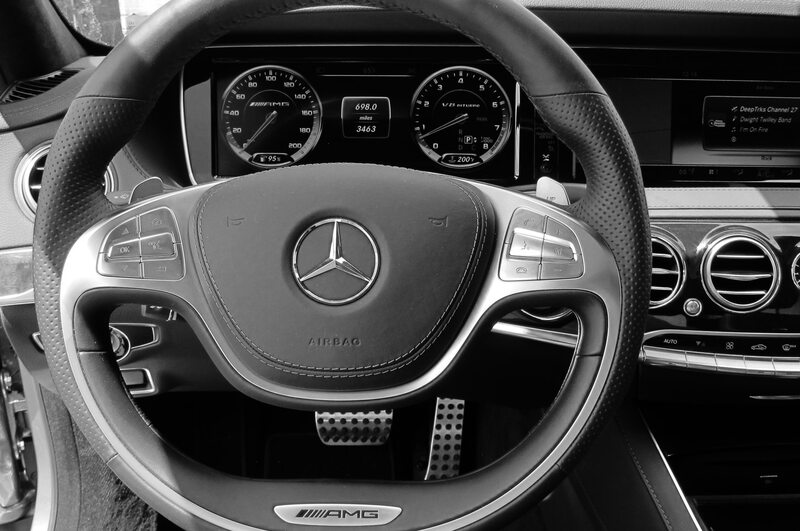 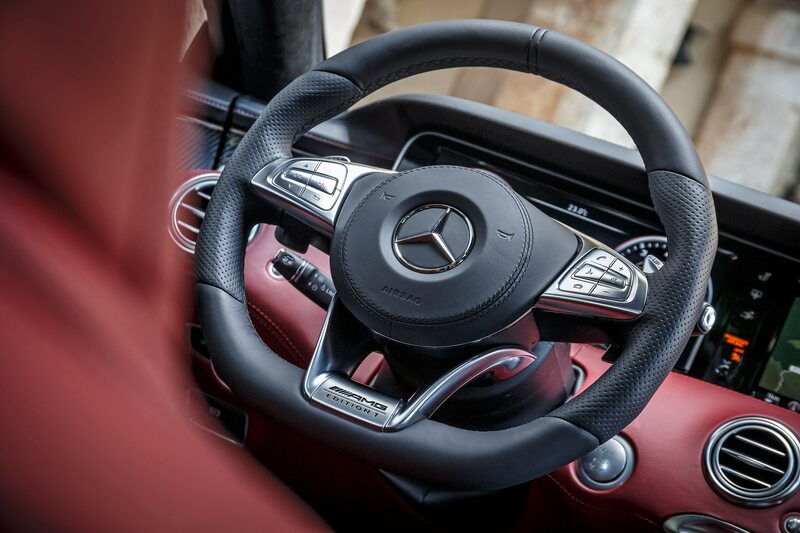 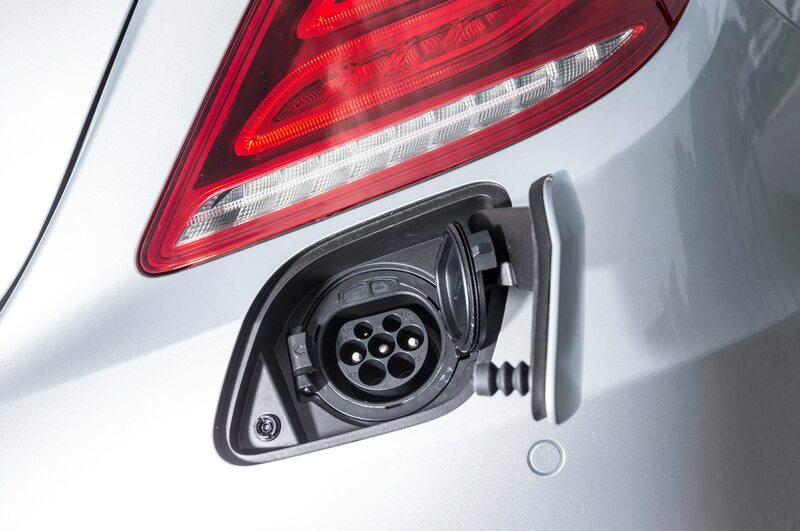 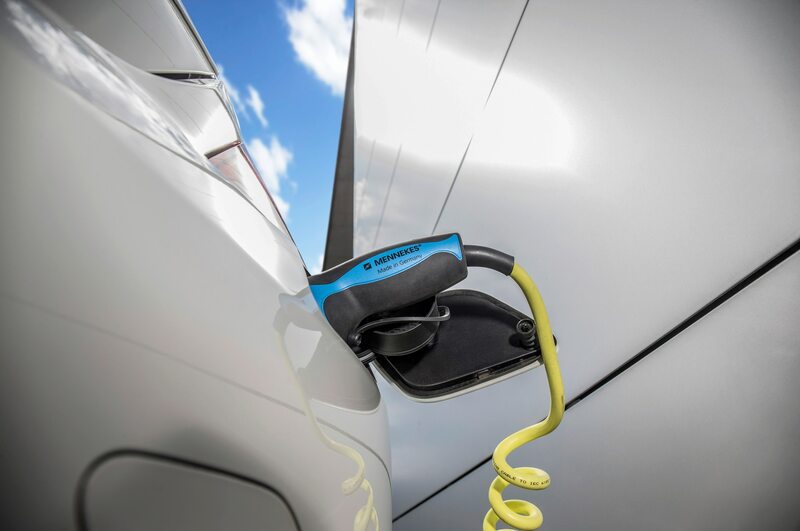 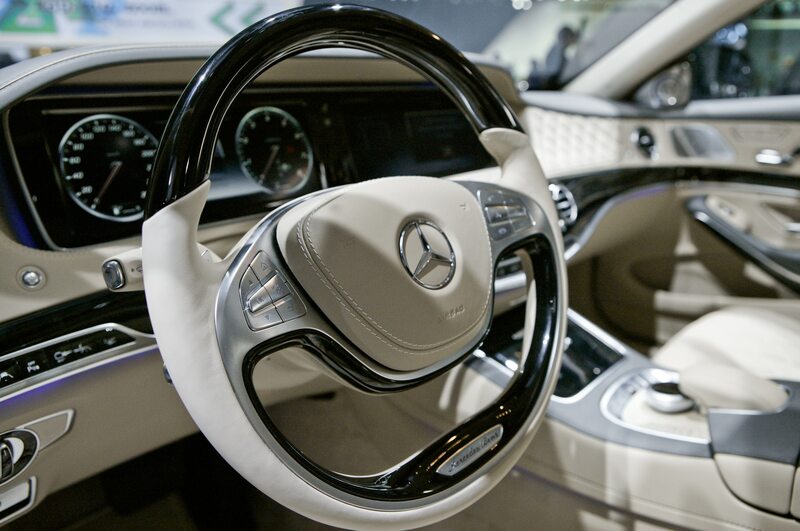 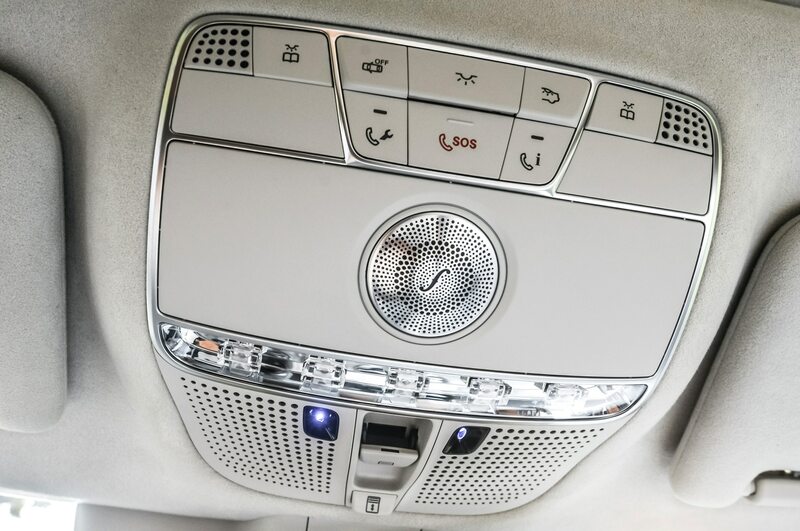 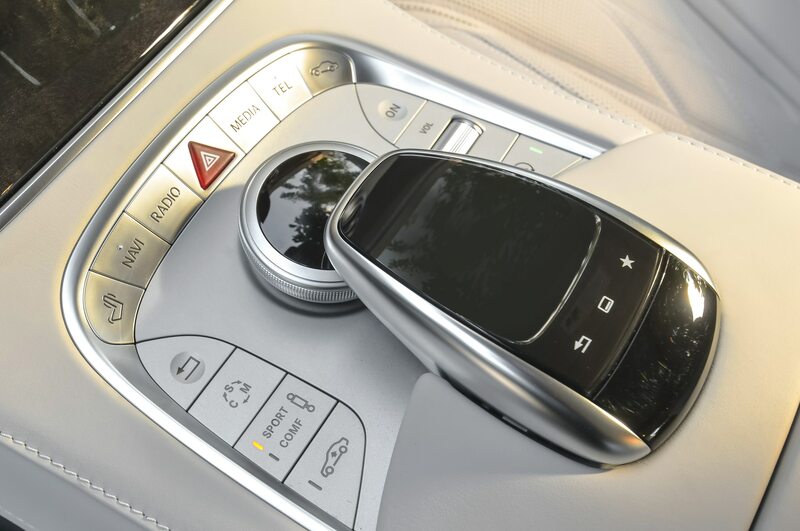 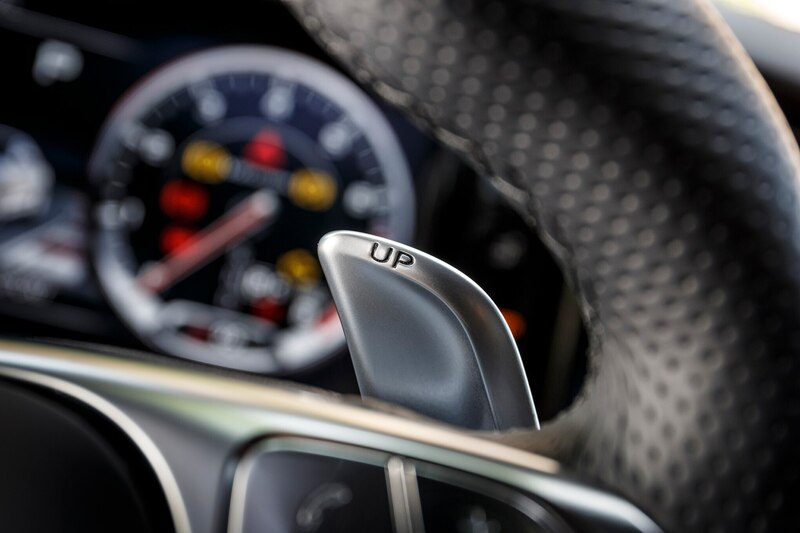 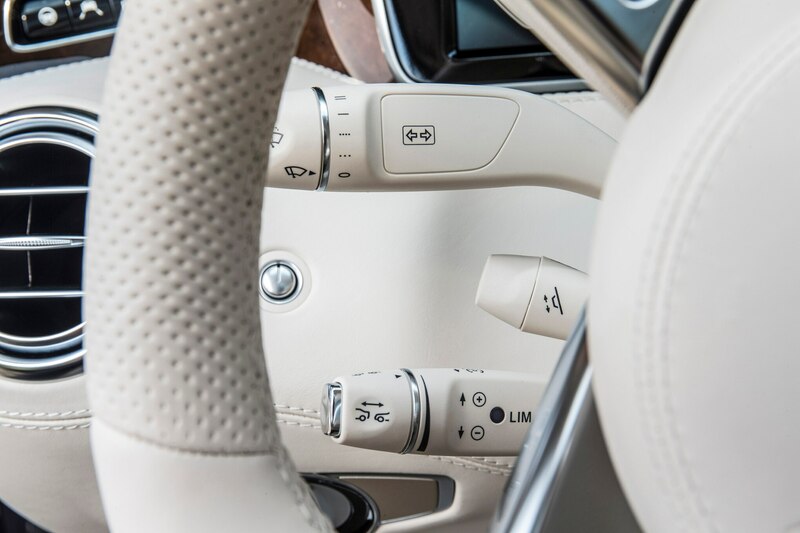 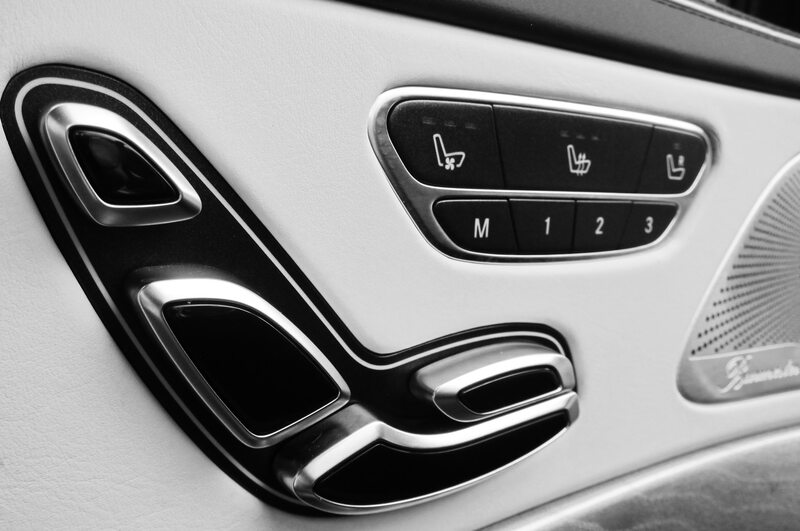 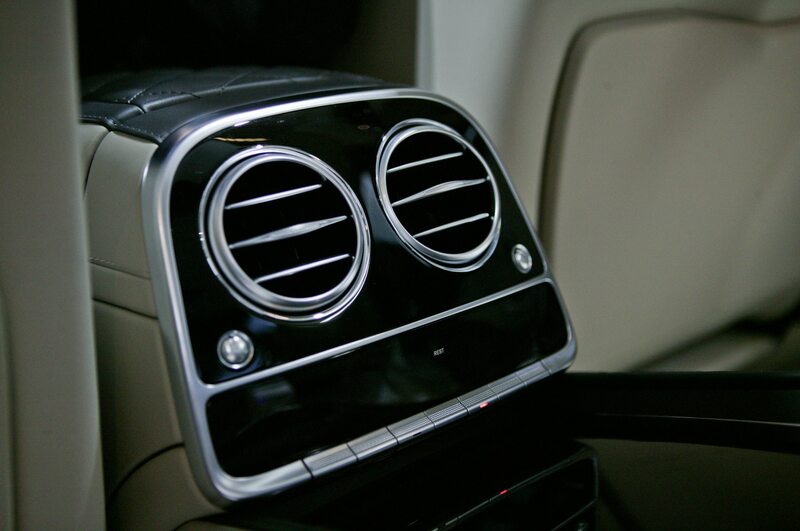 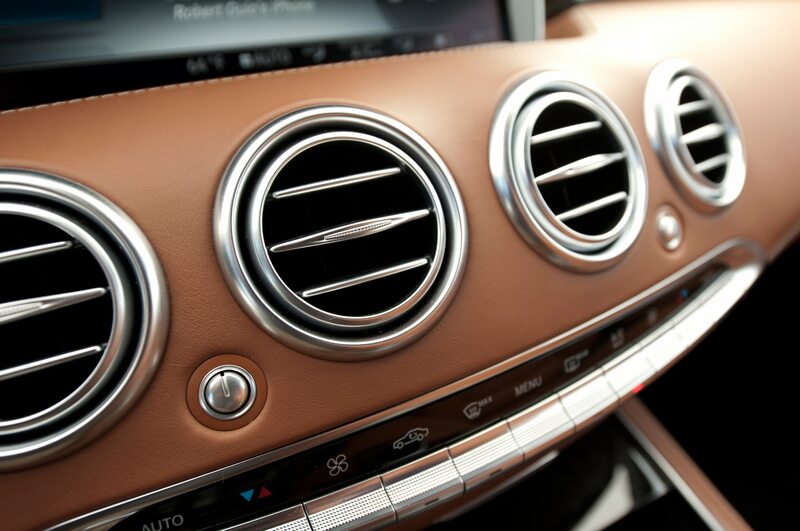 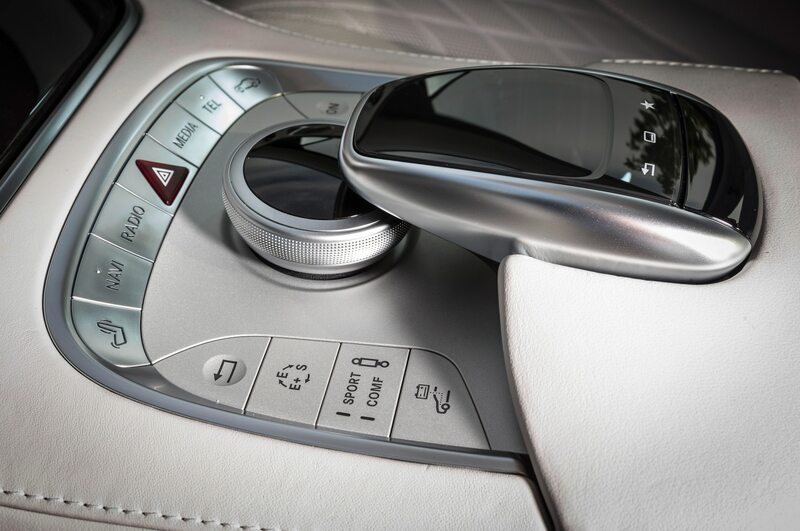 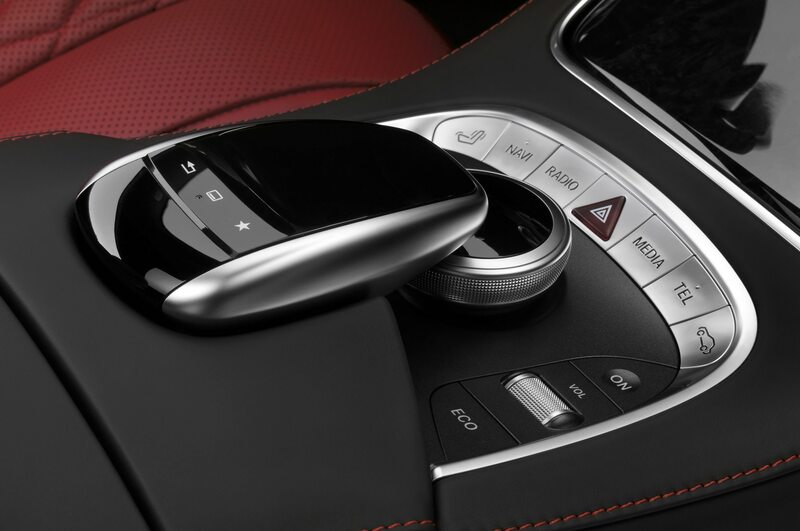 To operate the latter, Mercedes’ click-wheel controller is supplemented by a mouse-like touch pad. 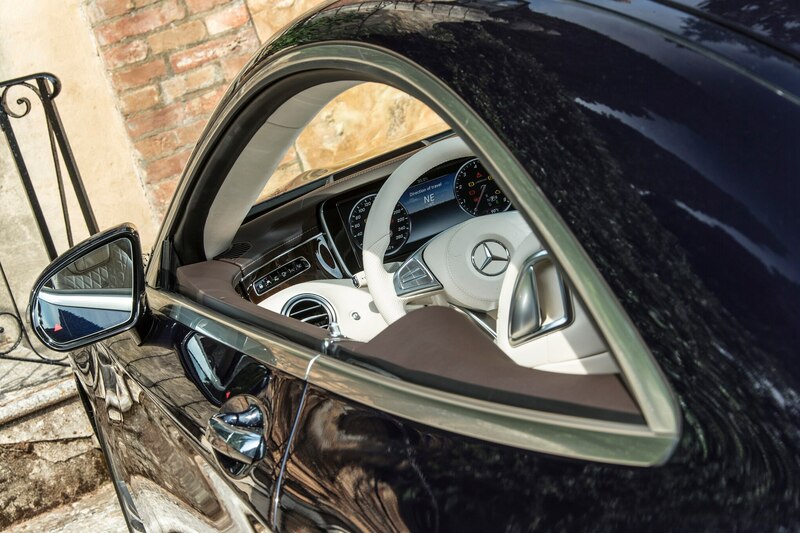 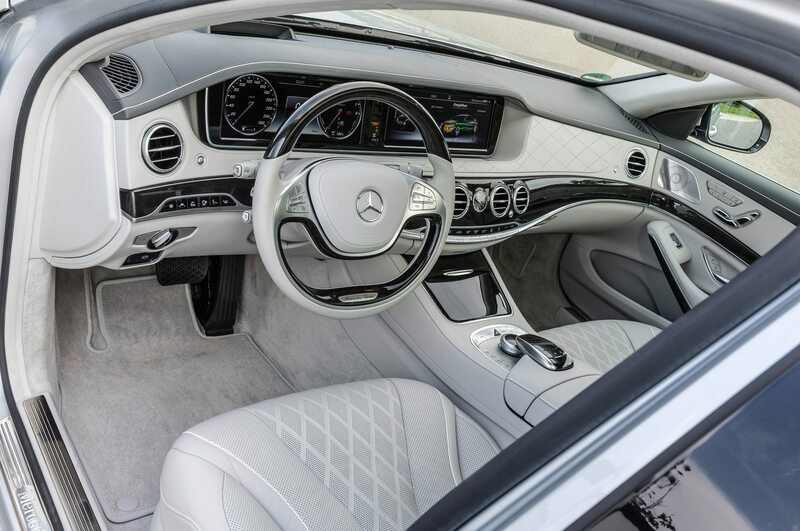 Long a hallmark of Mercedes coupes, this new car’s pillar-less greenhouse makes for an airy environment, and the standard, panoramic glass sunroof enhances the feeling. 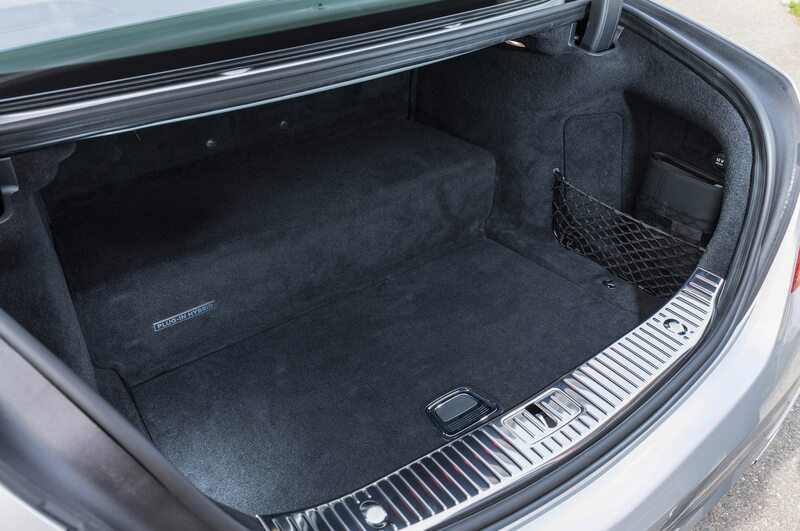 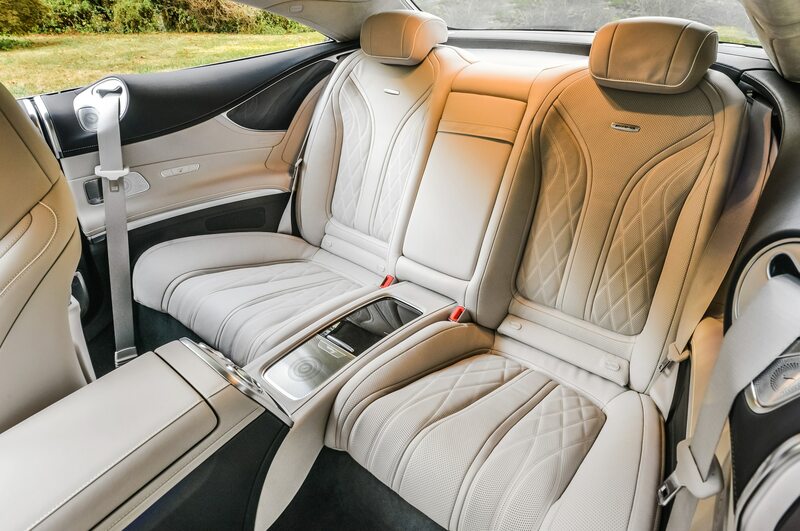 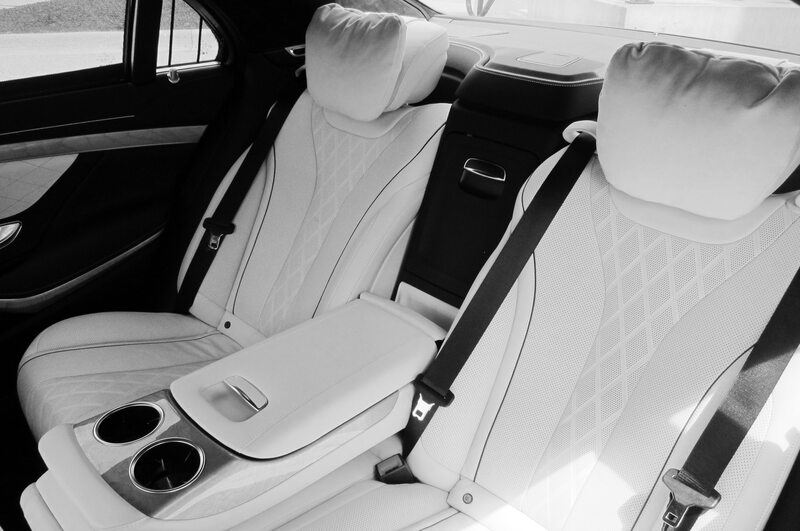 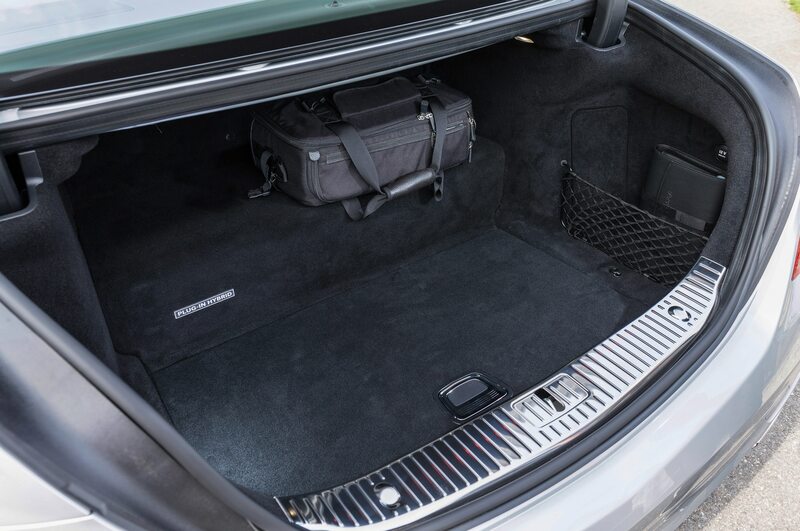 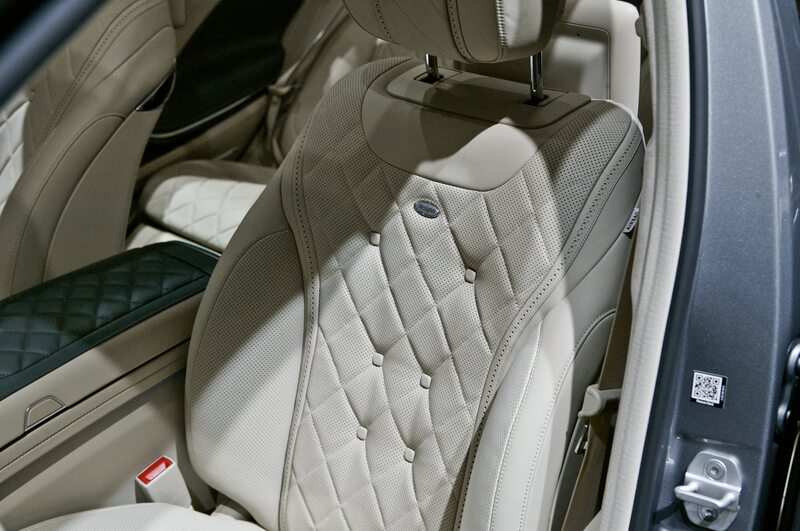 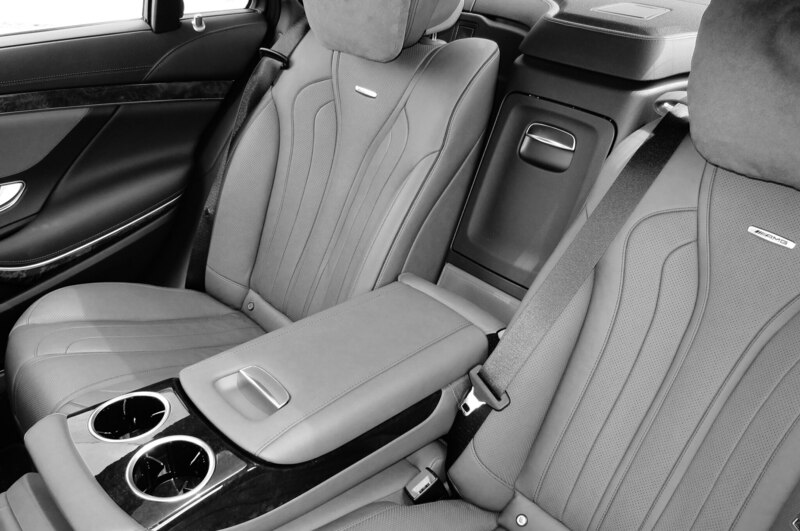 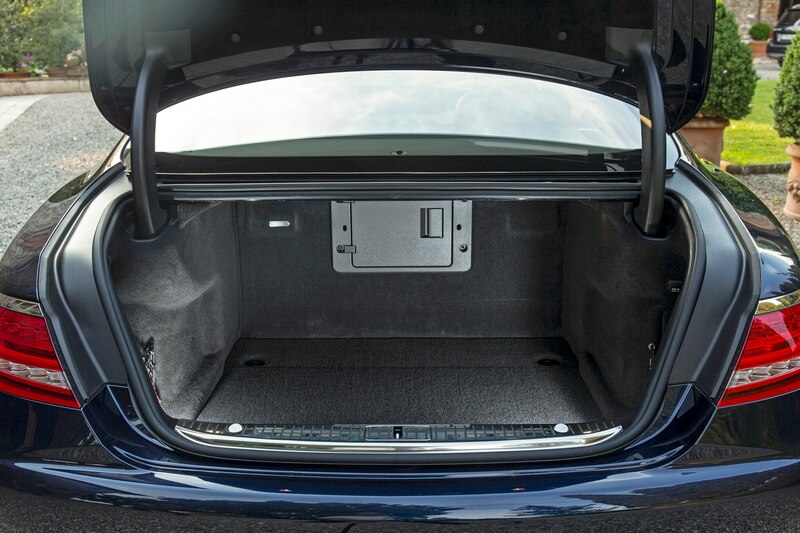 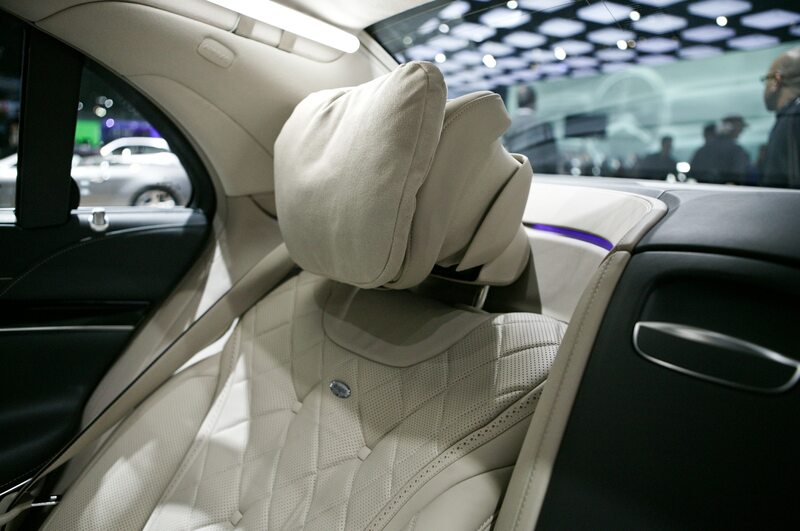 And since the B-pillars are missing, the rear-seat passengers also get a good view to the side, which is better treatment than those in the back seat usually get in swanky coupes. 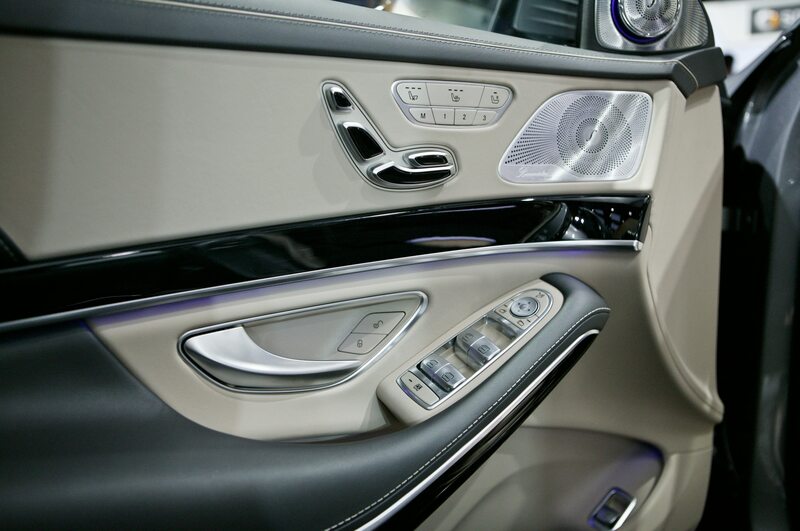 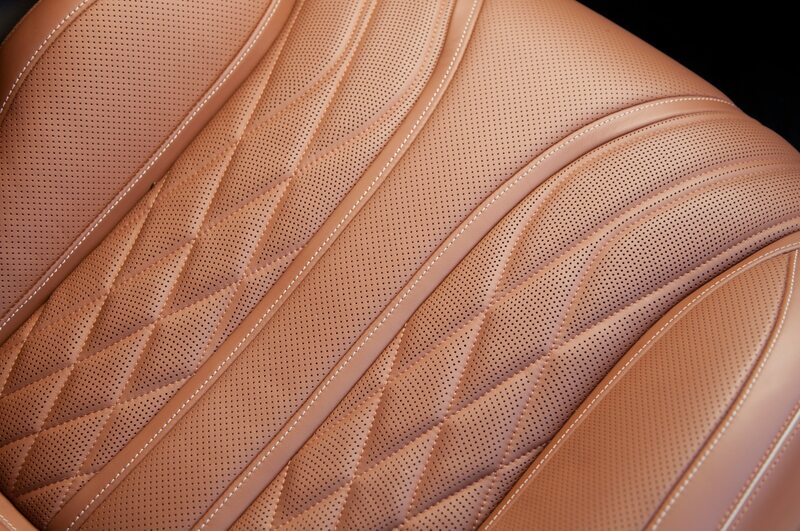 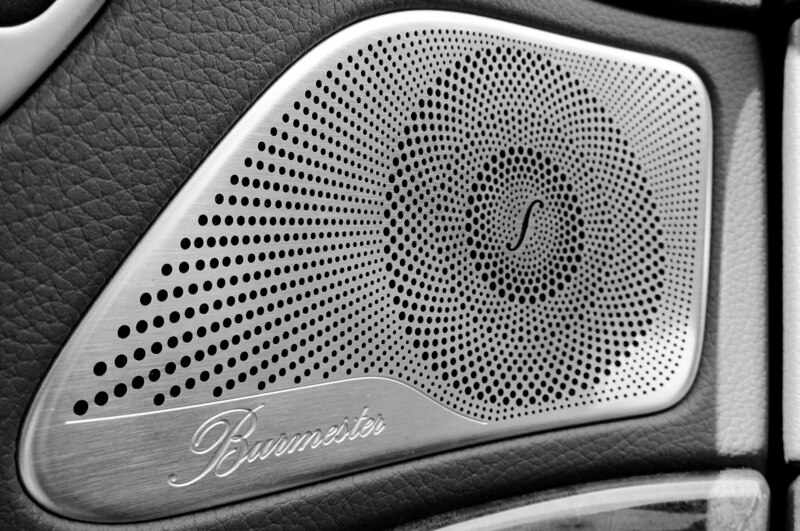 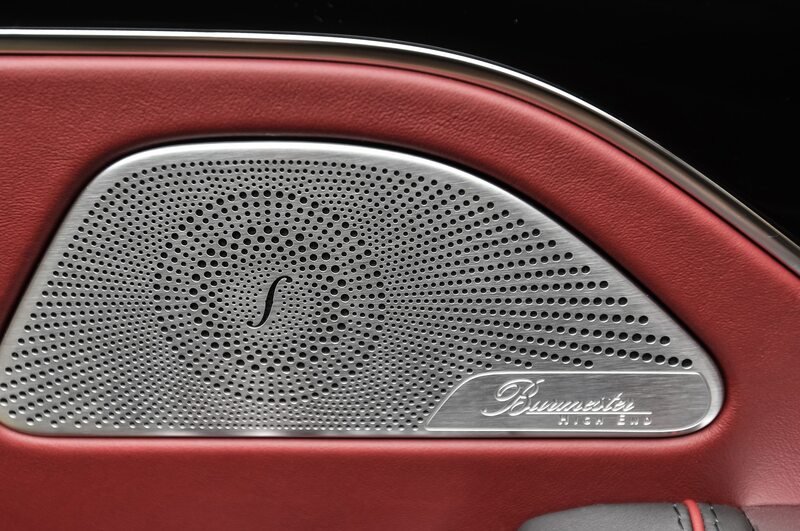 As Wagener understands, nothing creates want better than beautiful design. 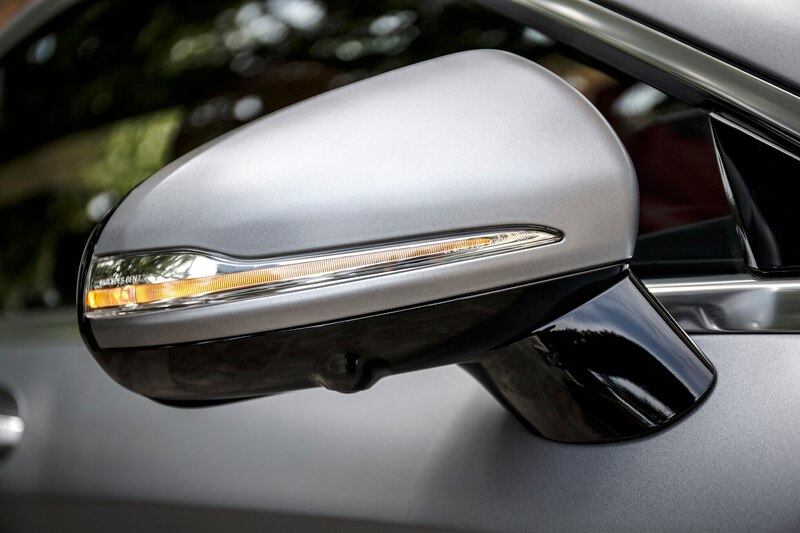 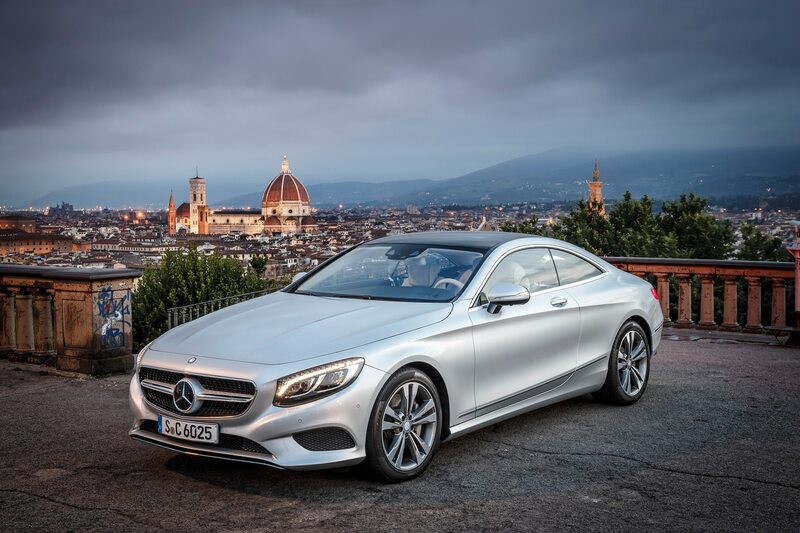 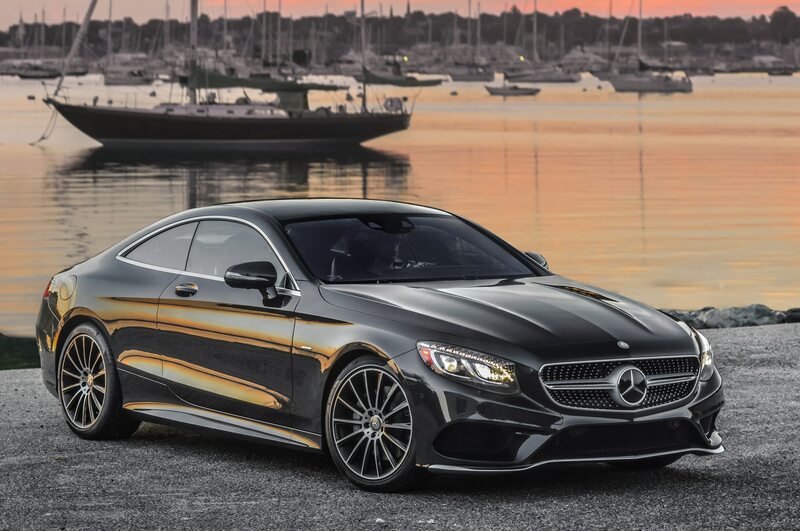 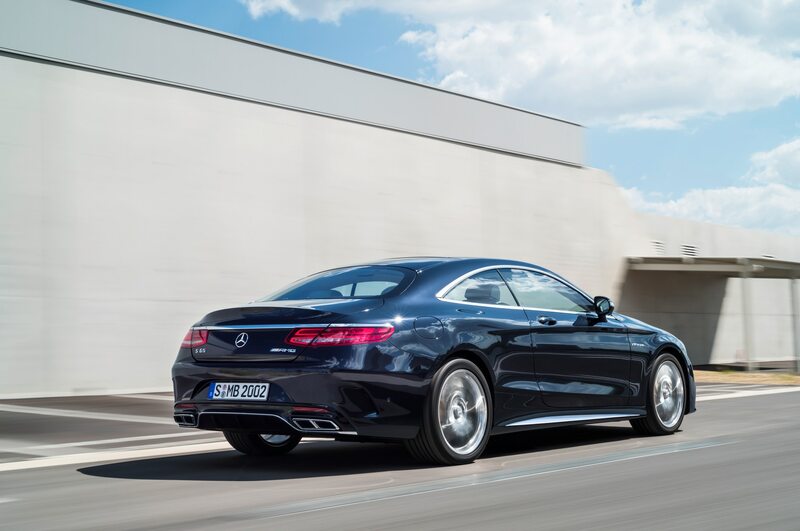 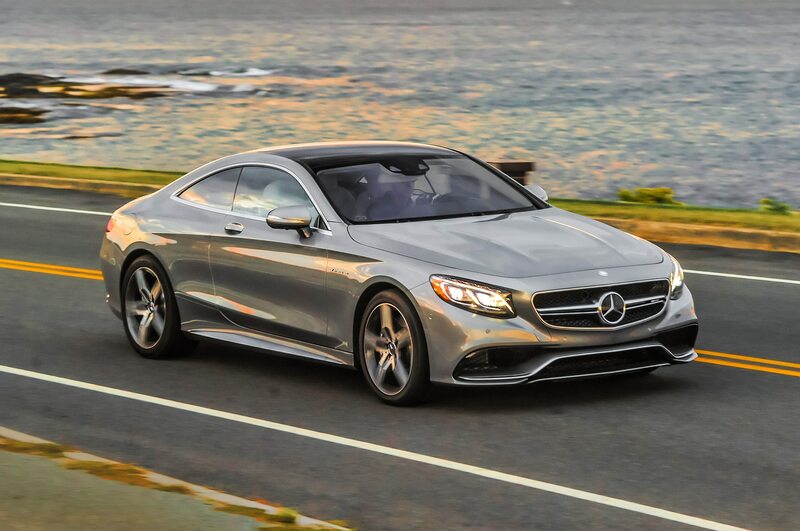 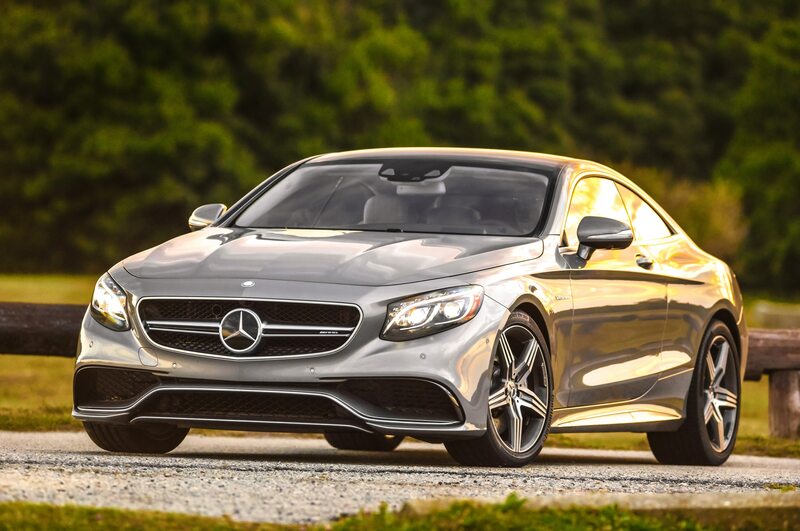 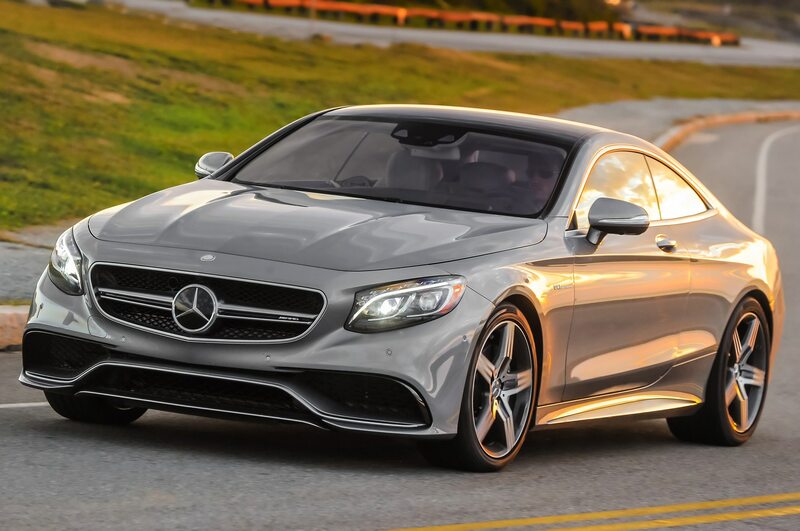 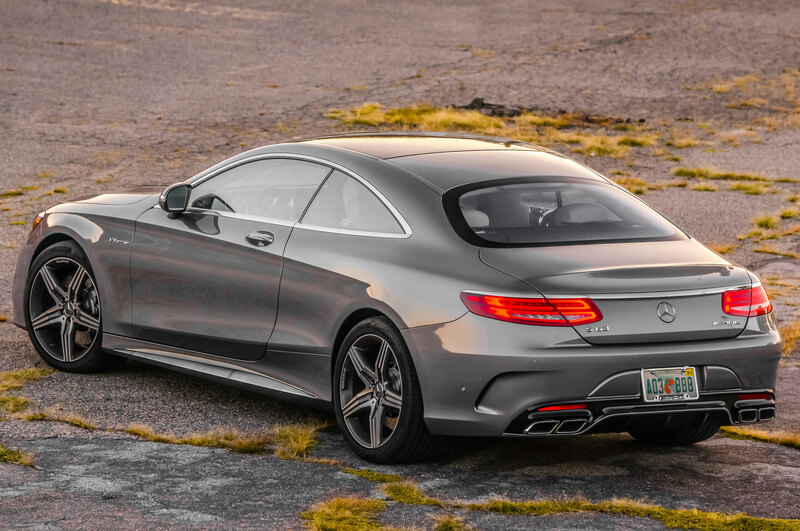 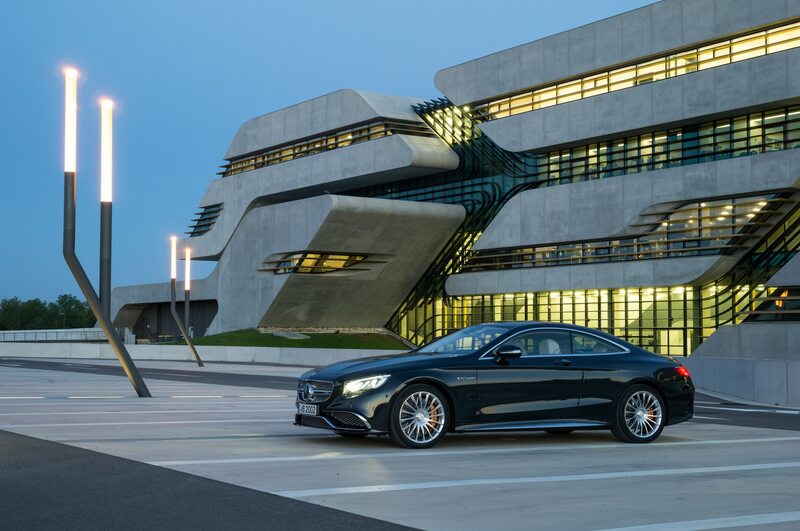 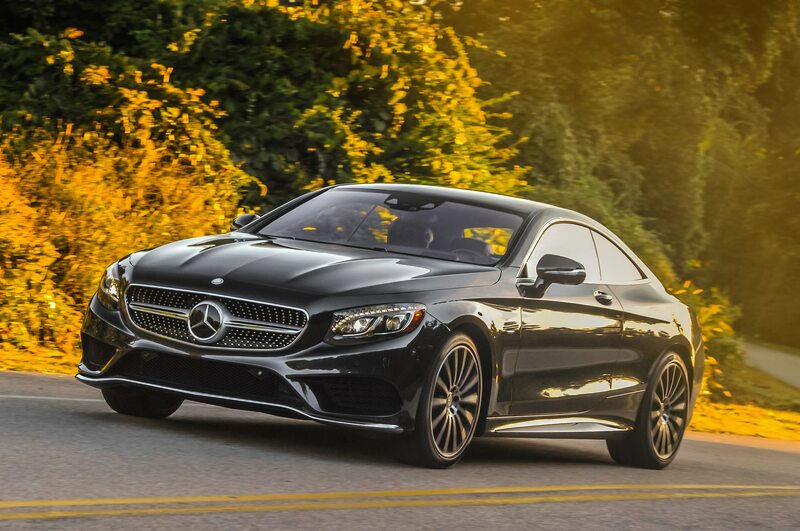 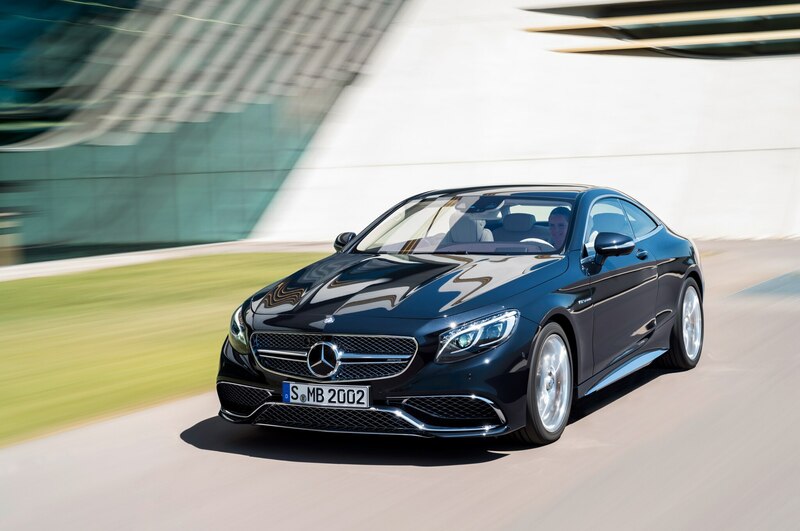 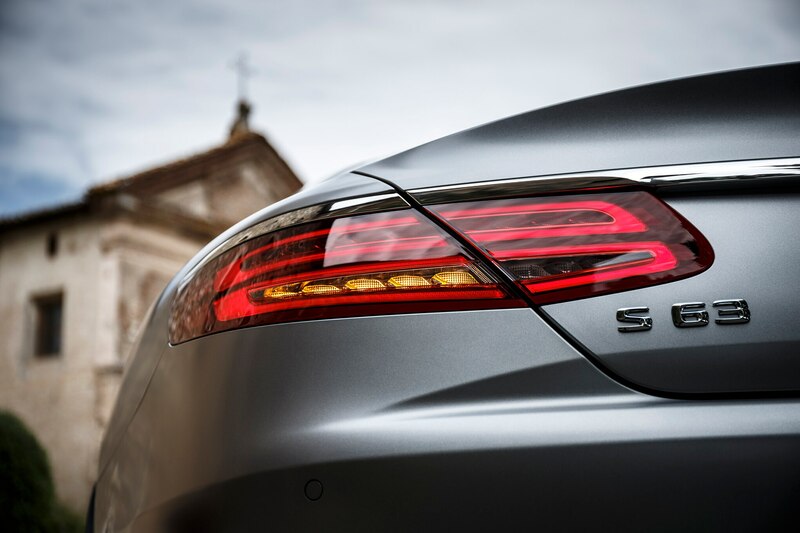 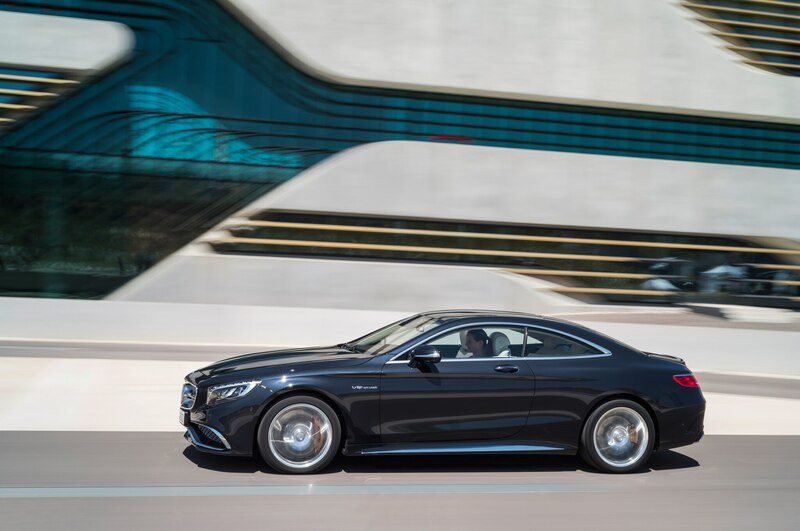 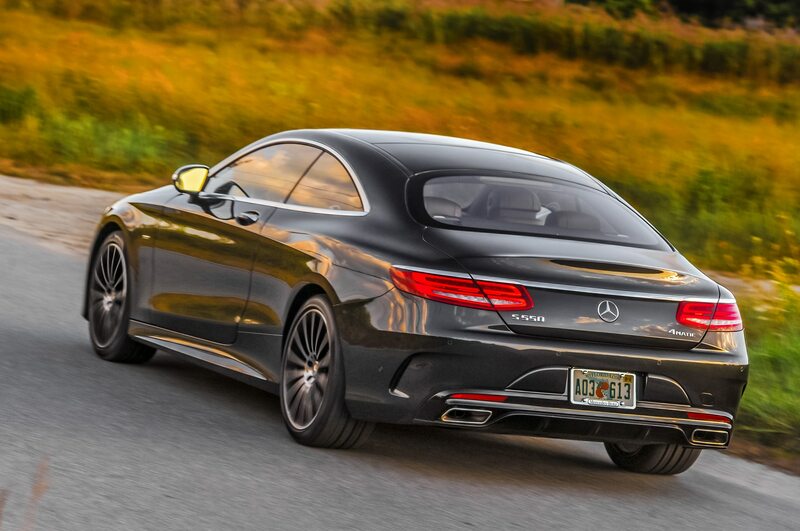 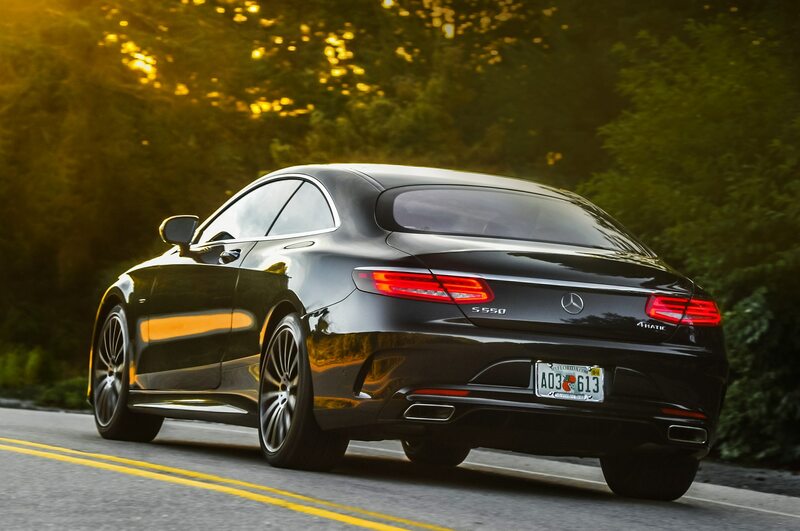 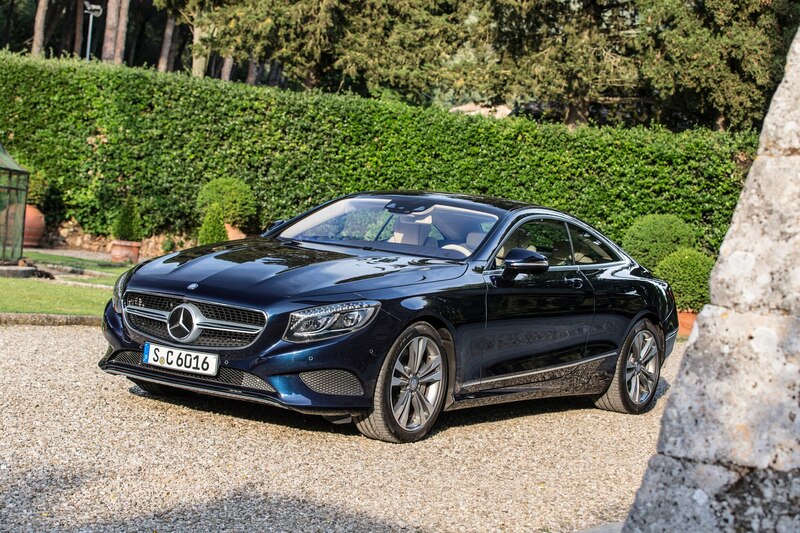 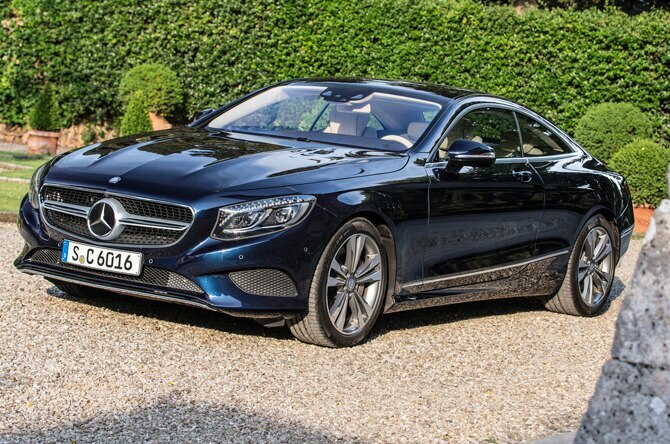 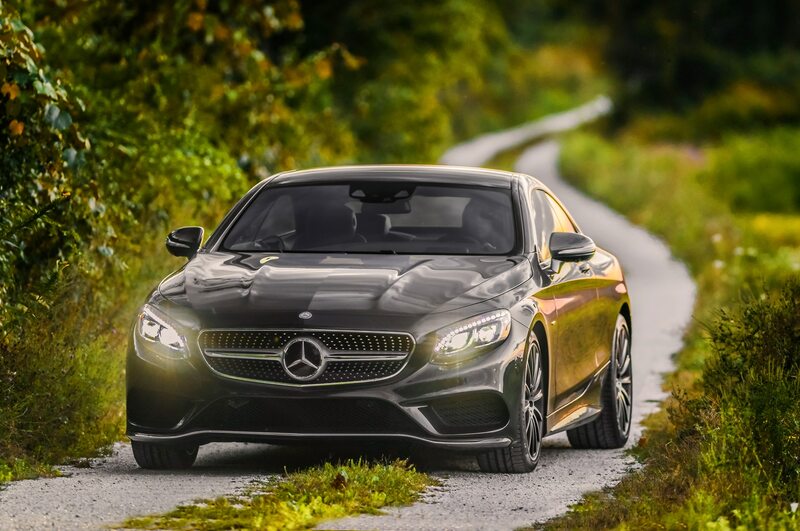 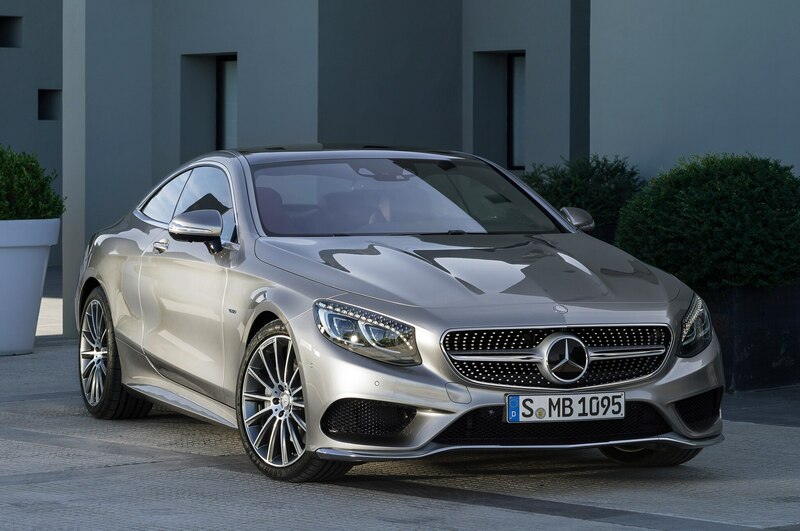 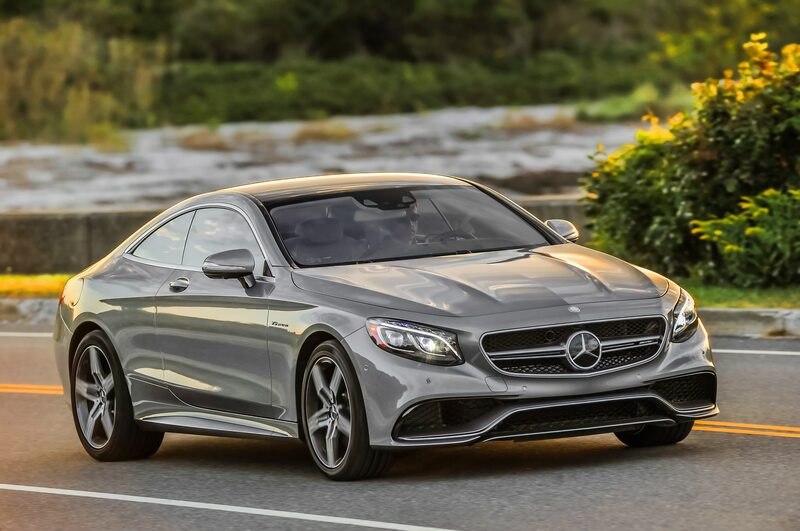 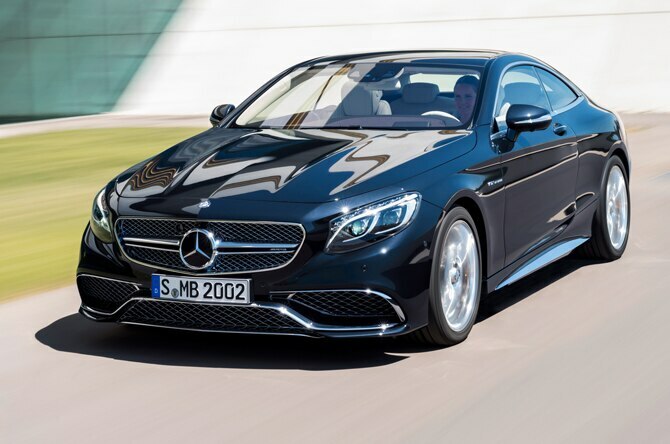 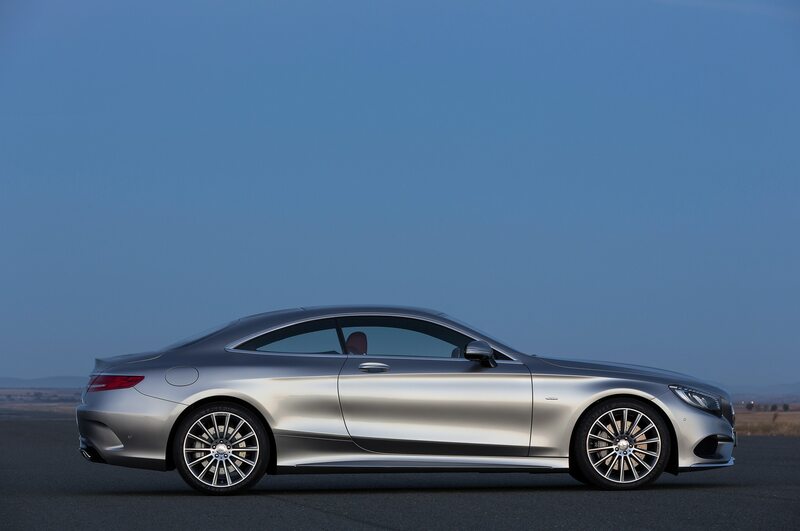 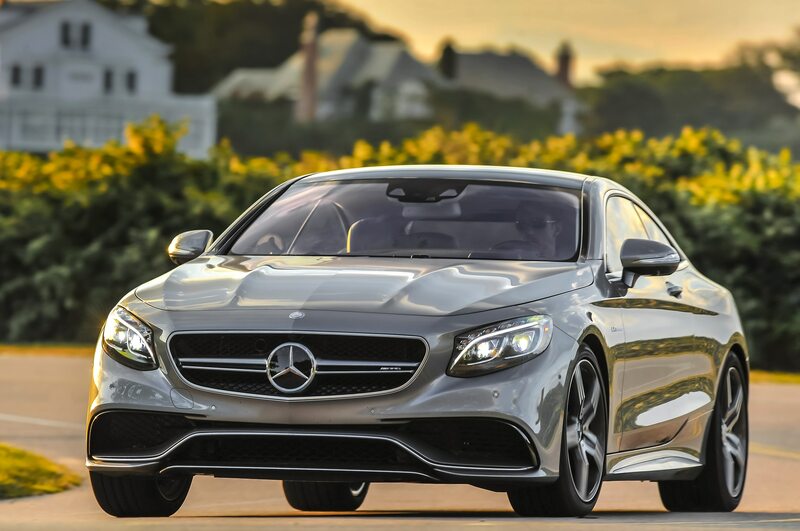 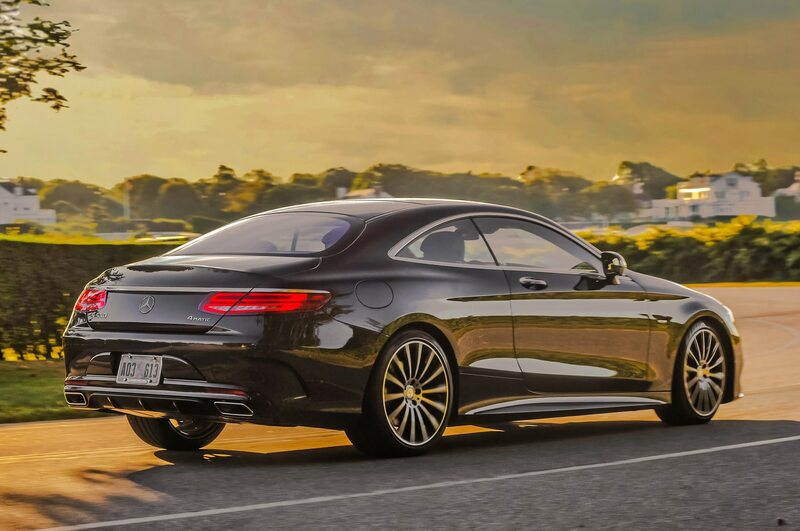 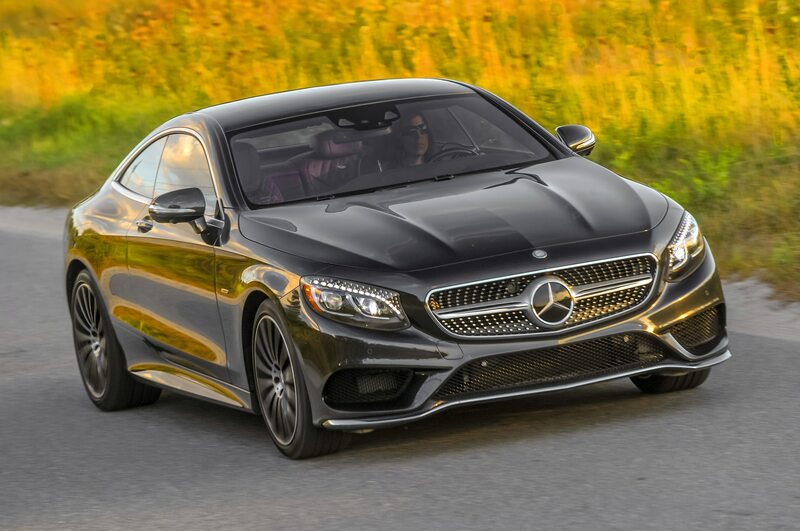 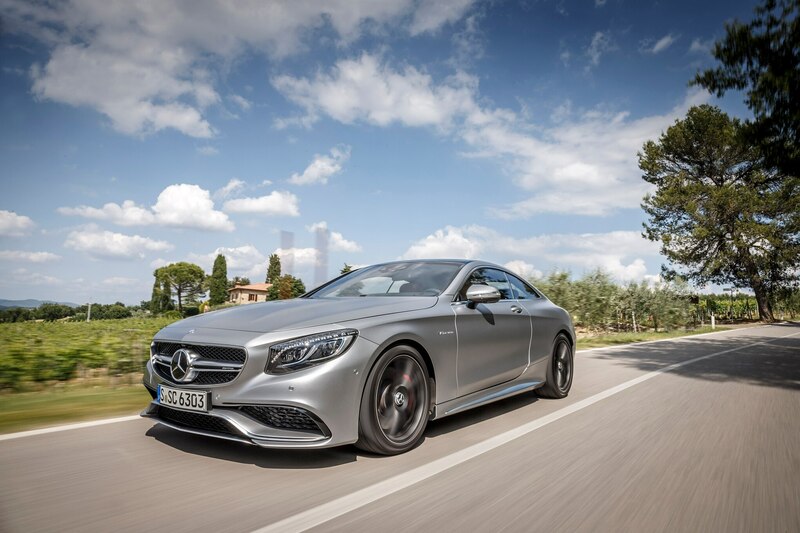 Here again, the 2015 Mercedes-Benz S-Class coupe scores, its shapely sheet metal draped over a machine with revised proportions that are wider than the previous Mercedes-Benz CL-Class, yet shorter in length and height. 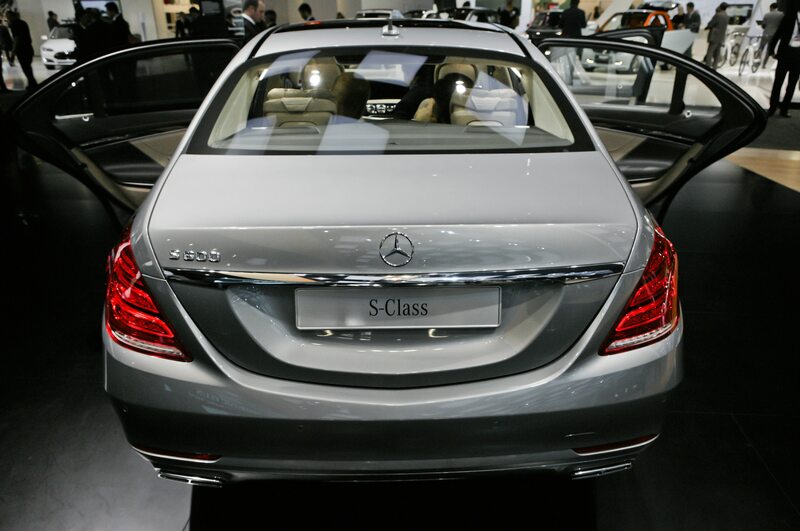 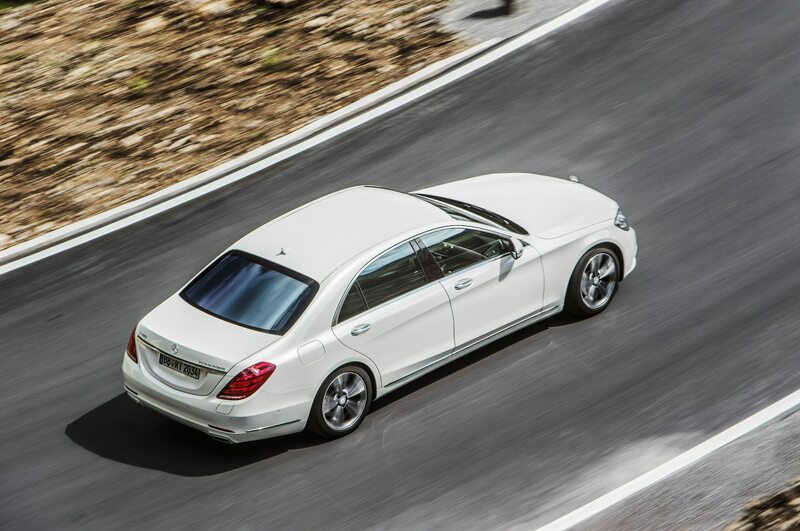 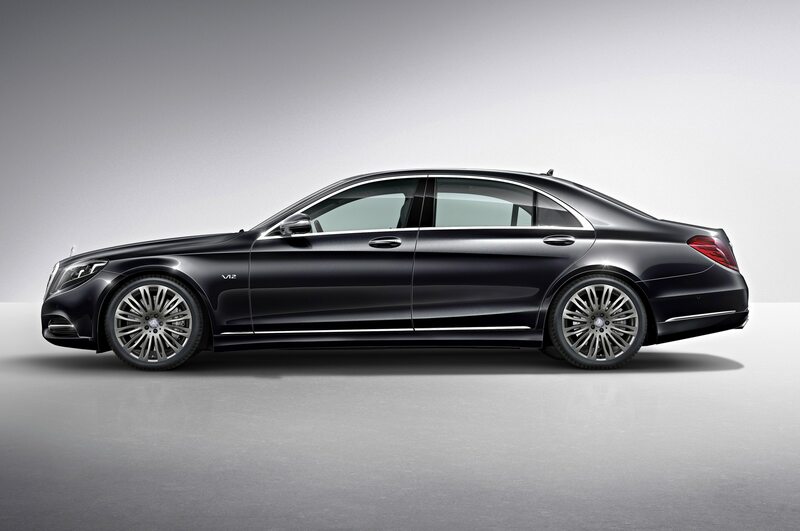 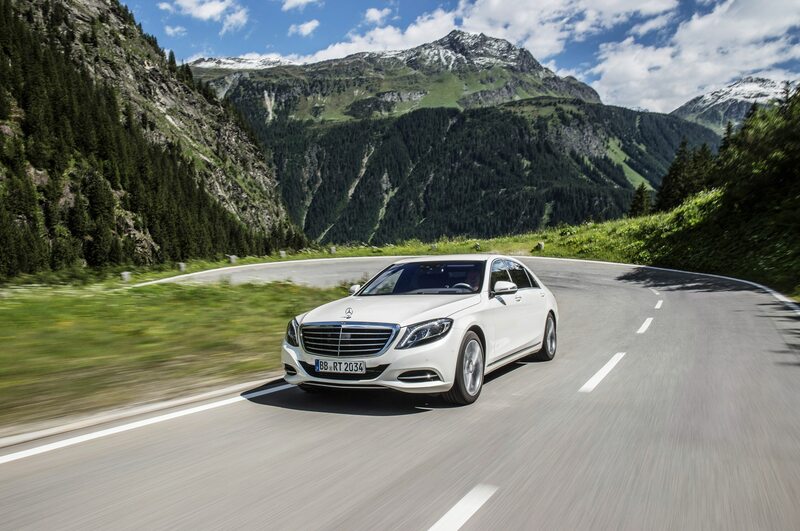 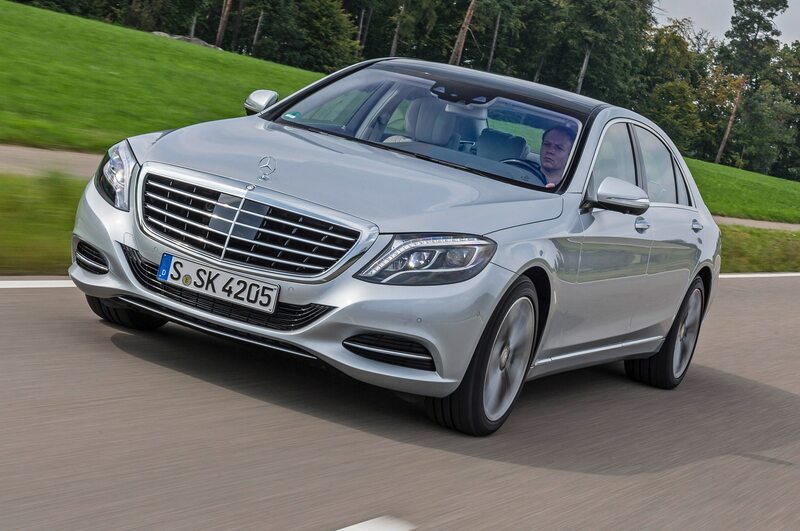 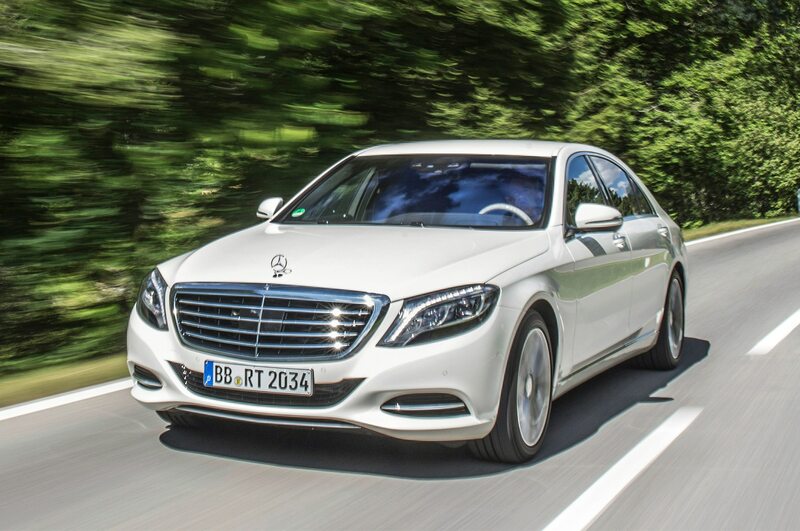 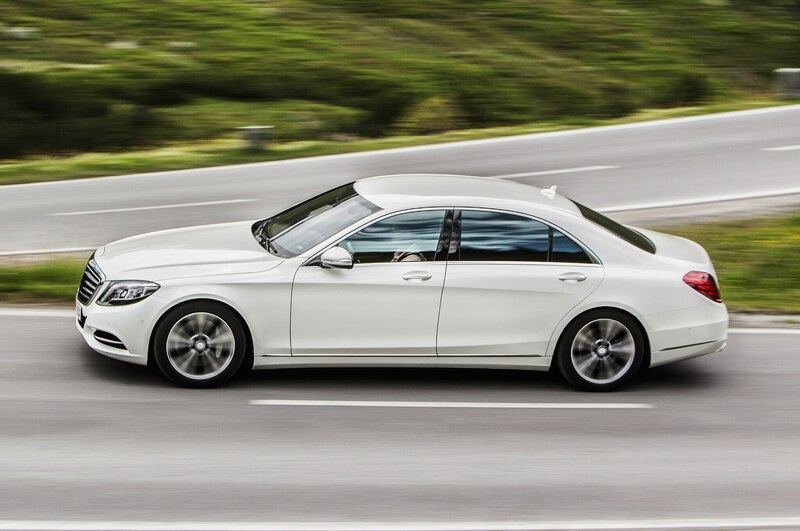 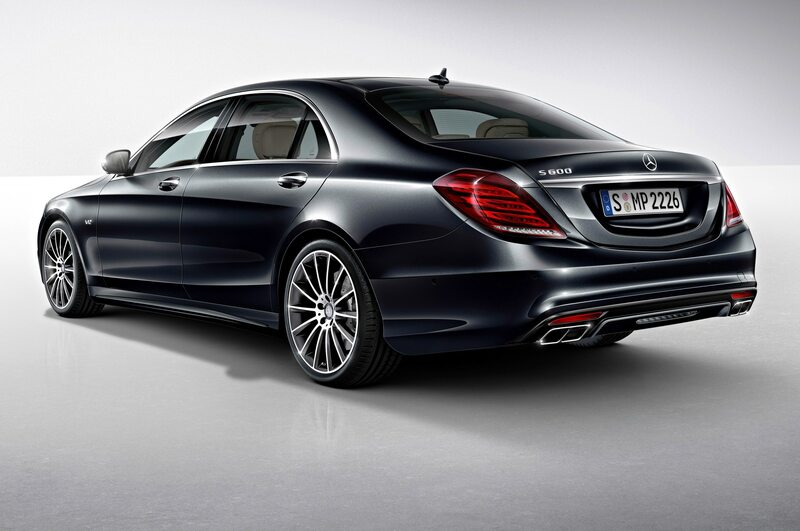 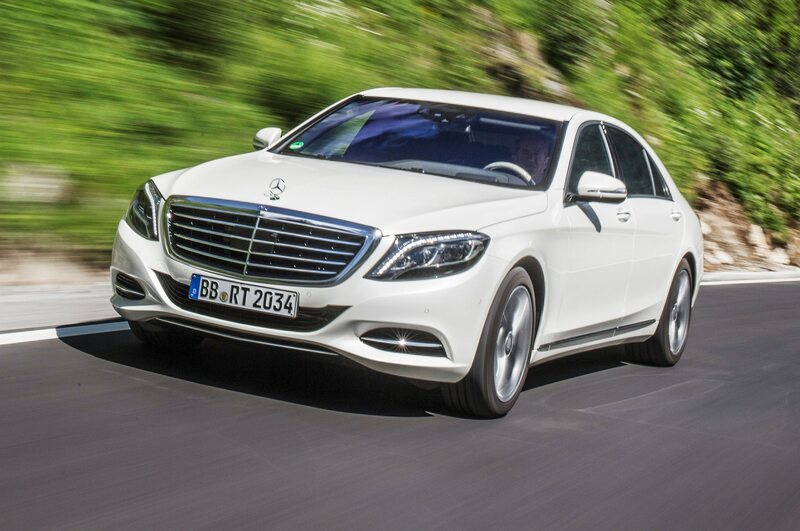 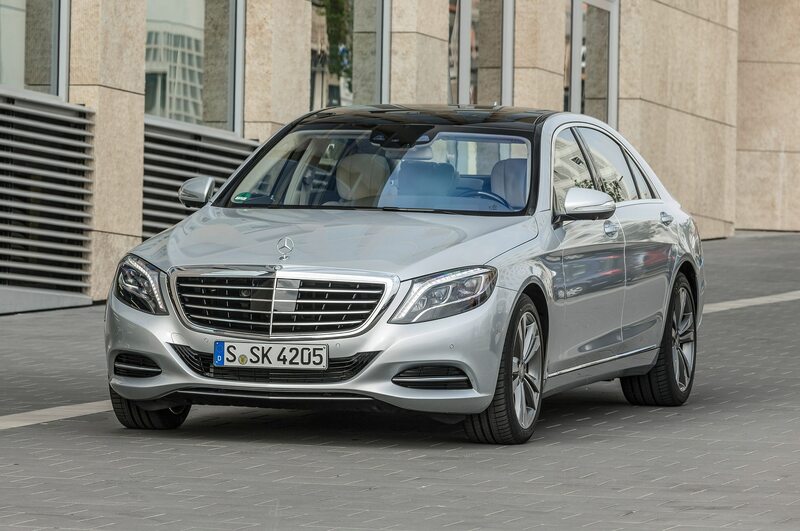 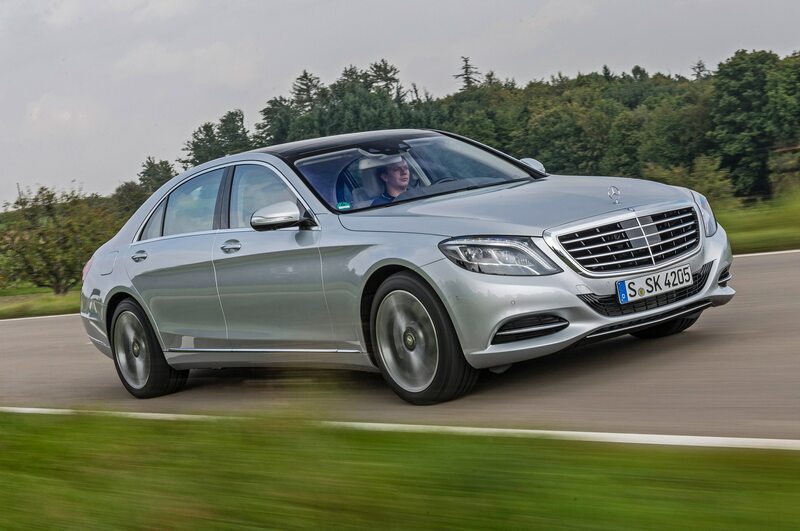 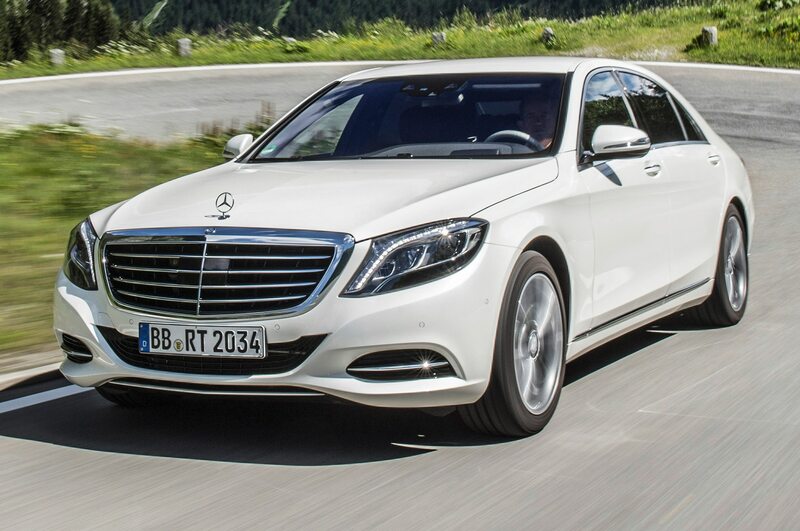 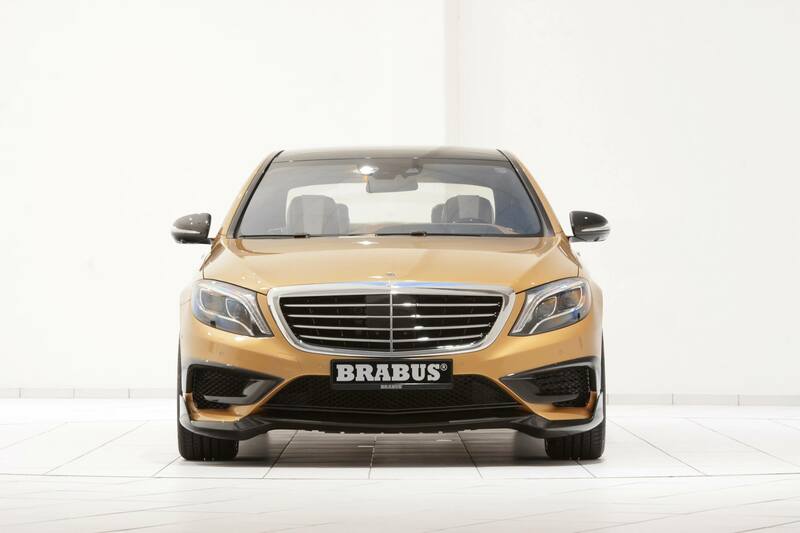 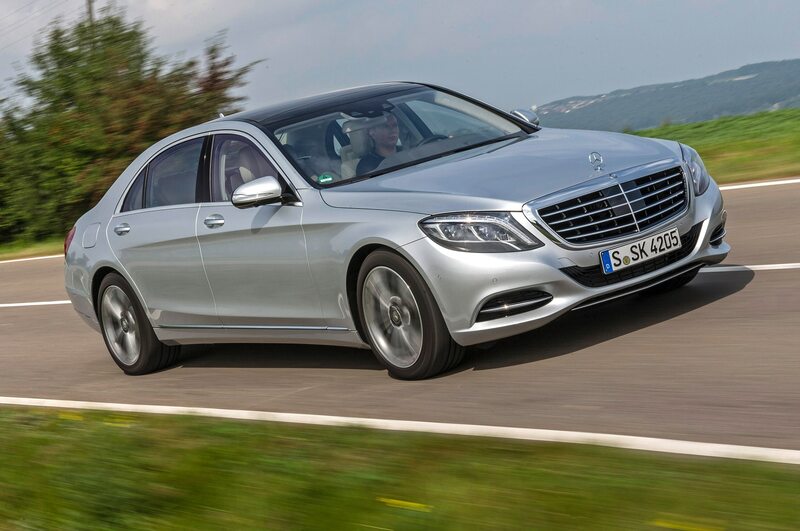 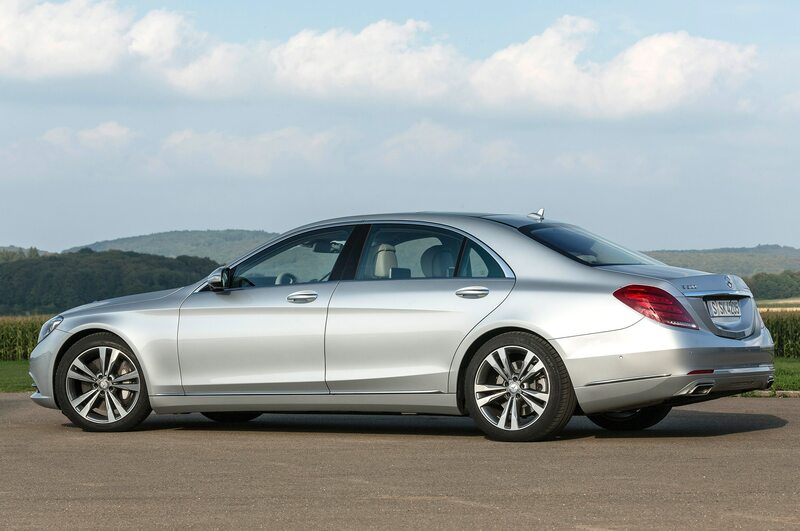 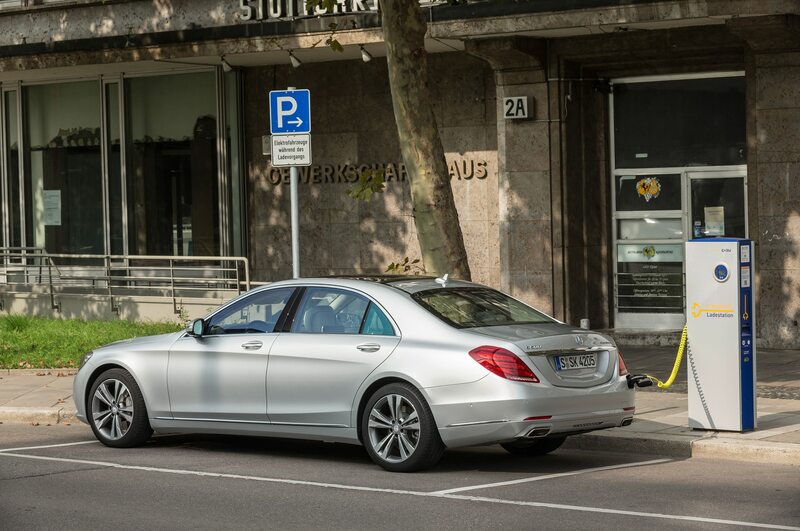 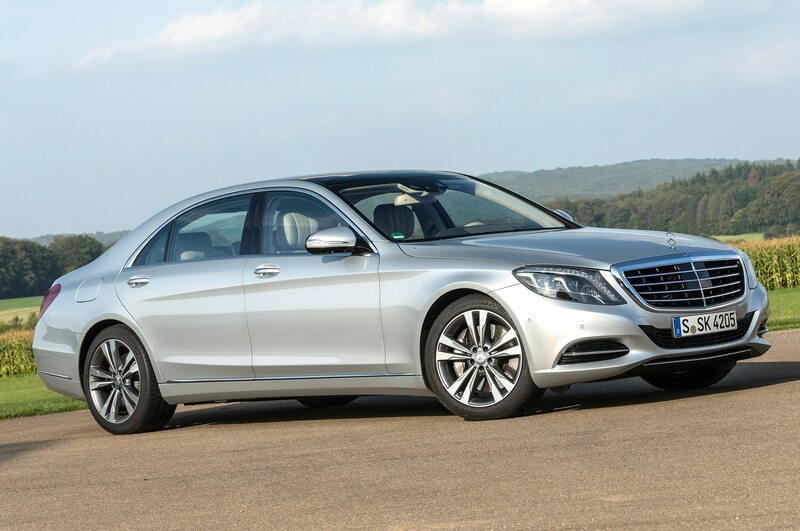 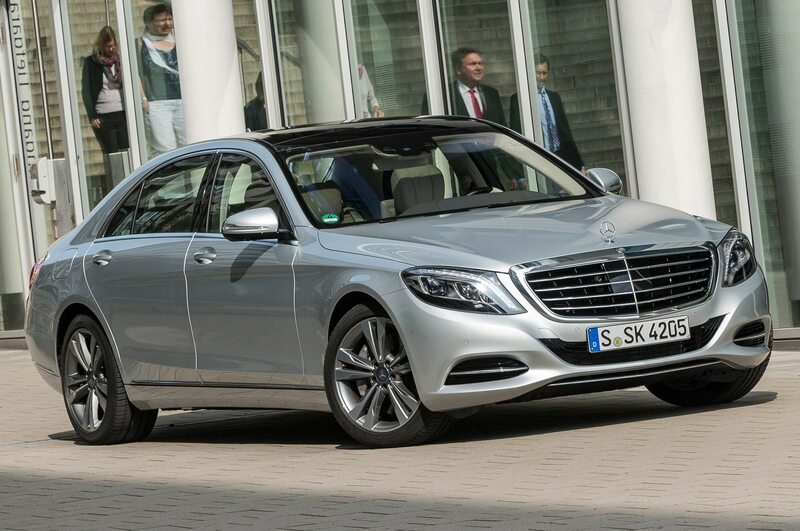 This car is also shorter in length and wheelbase compared to the new S-Class sedan. 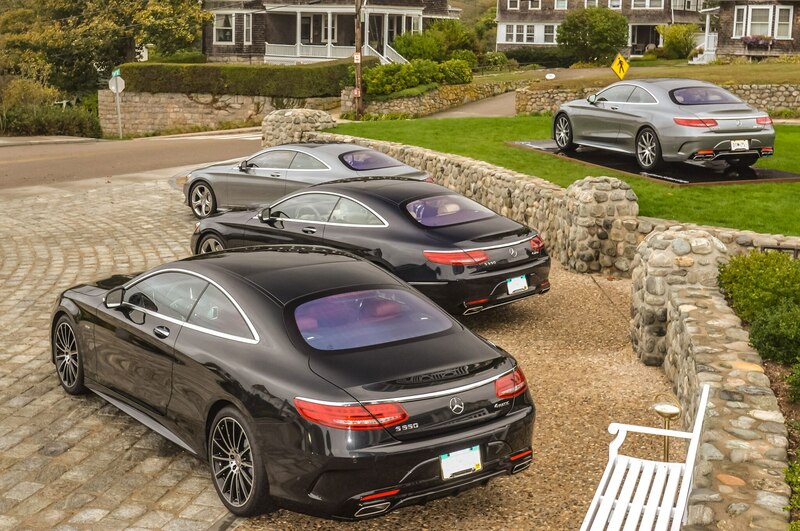 We thought that a Mercedes encrusted with Swarovski crystals might have enticed Taylor Swift out to have a look, as the pop star’s oceanfront manse is just a few doors down from where we were staying in Watch Hill. 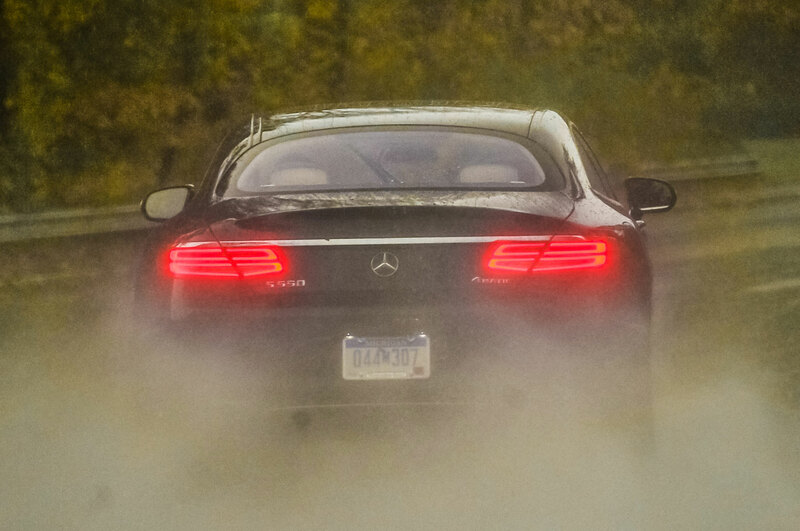 But she did not appear, and we headed out into a gathering monsoon to start our tour through three states (which, in New England, is a quicker trip than it sounds). 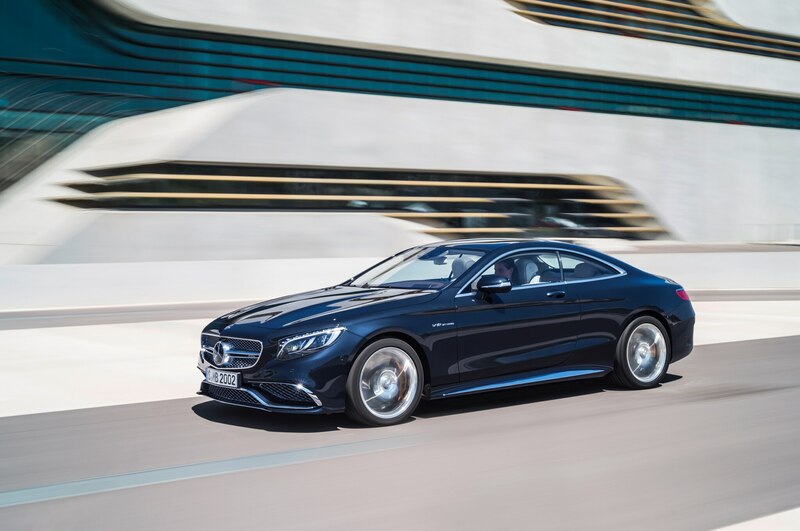 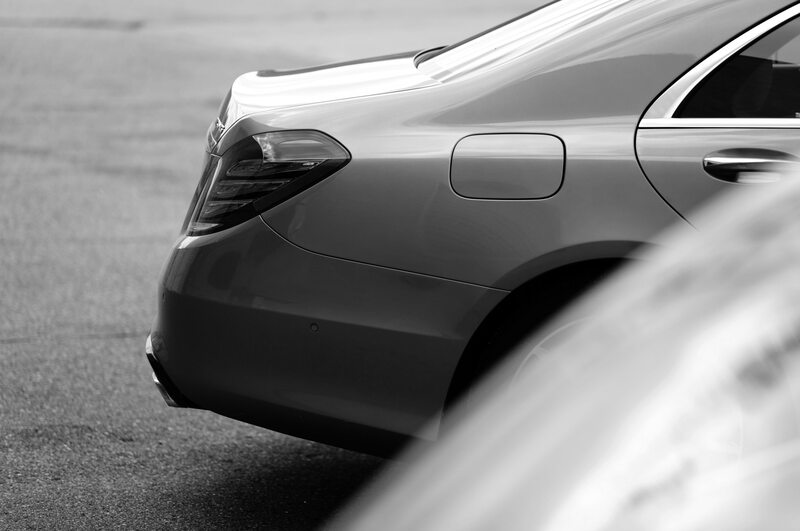 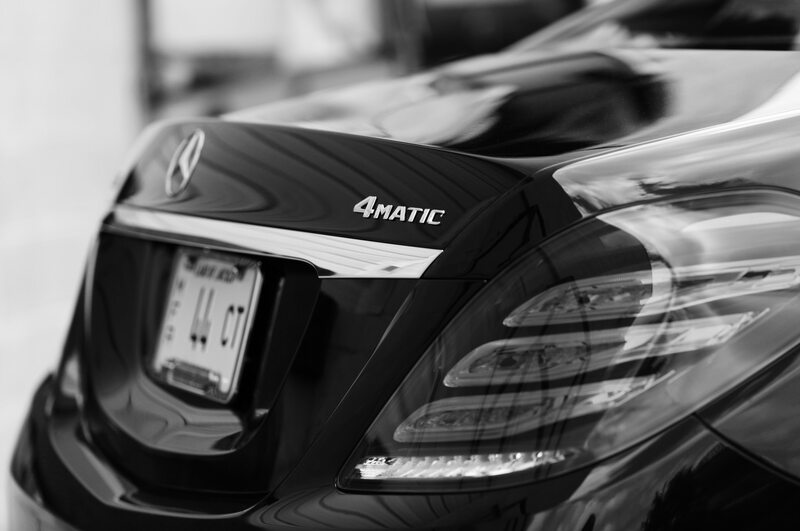 The wet weather discouraged exploring the outer edges of the big Benz’s performance envelope, but this plump luxury coupe’s stock-in-trade is really effortlessness and isolation in any case. 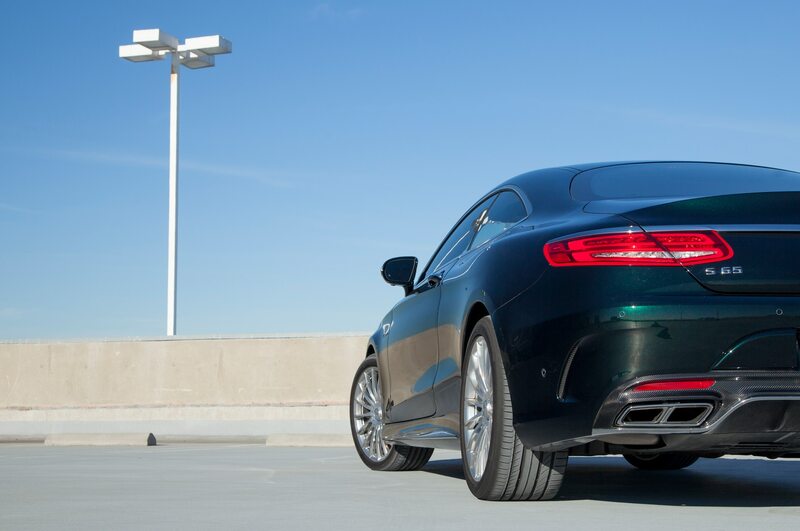 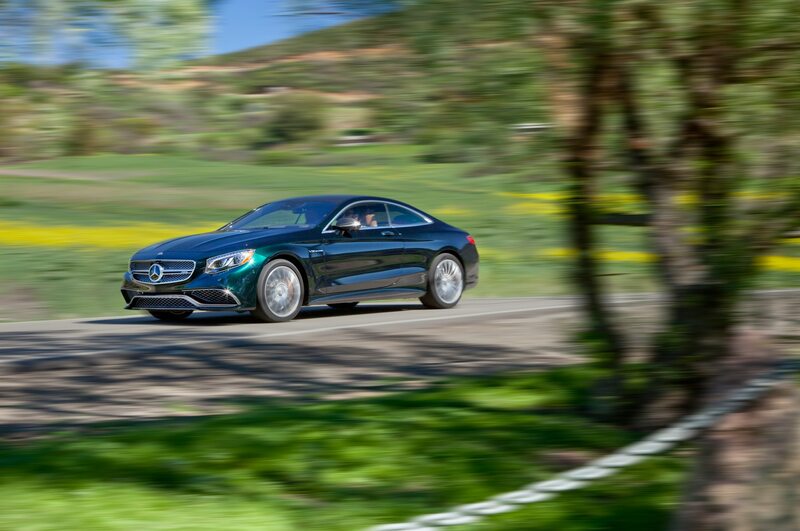 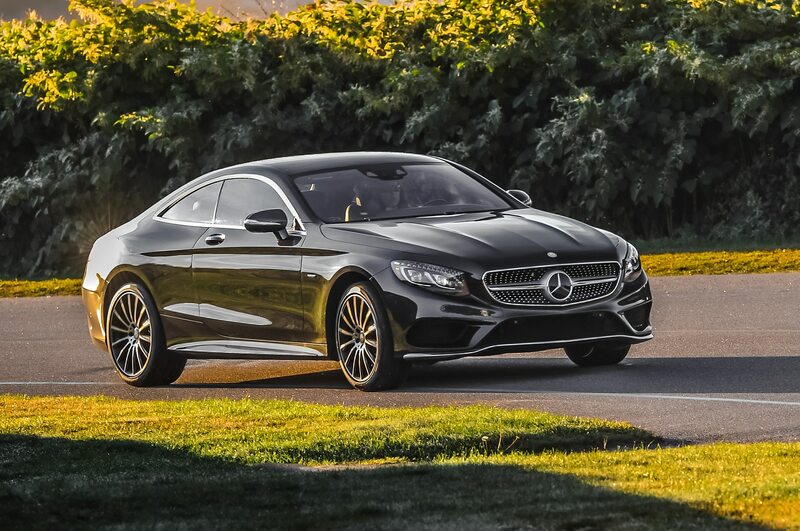 For the second half of the day, we switched to the 2015 S63 AMG coupe. 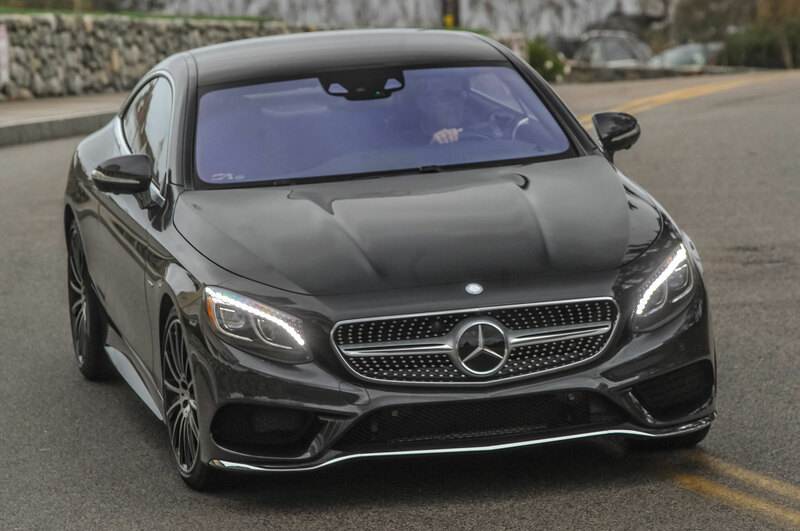 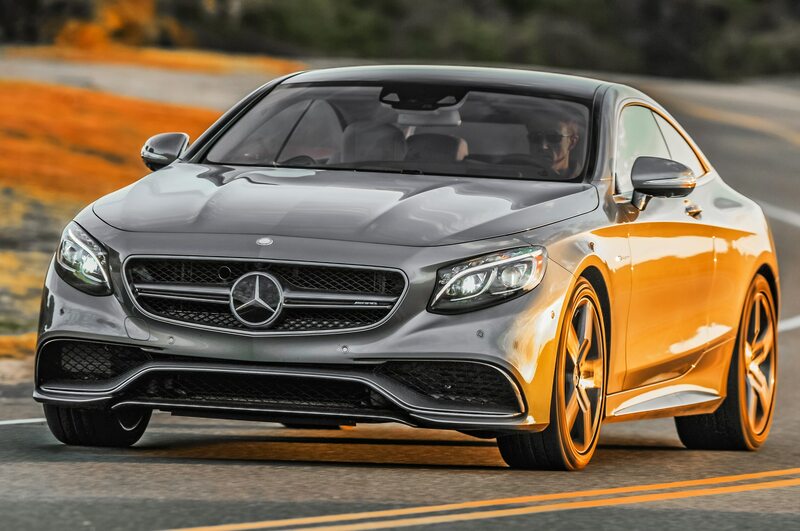 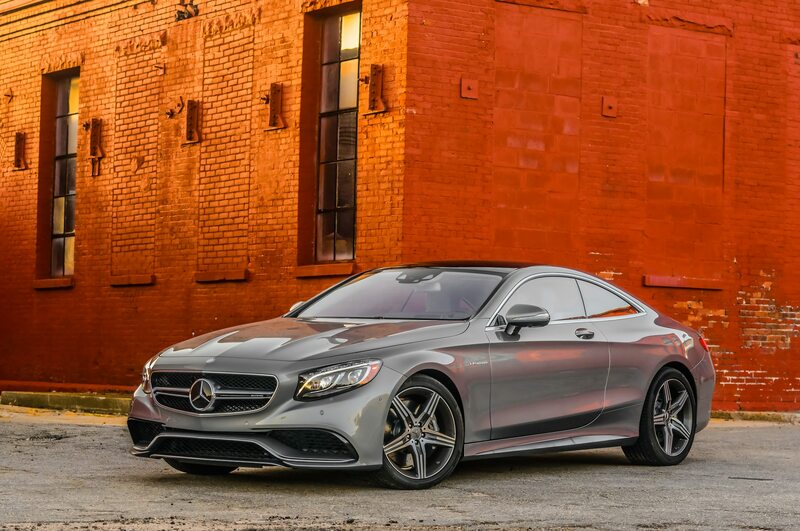 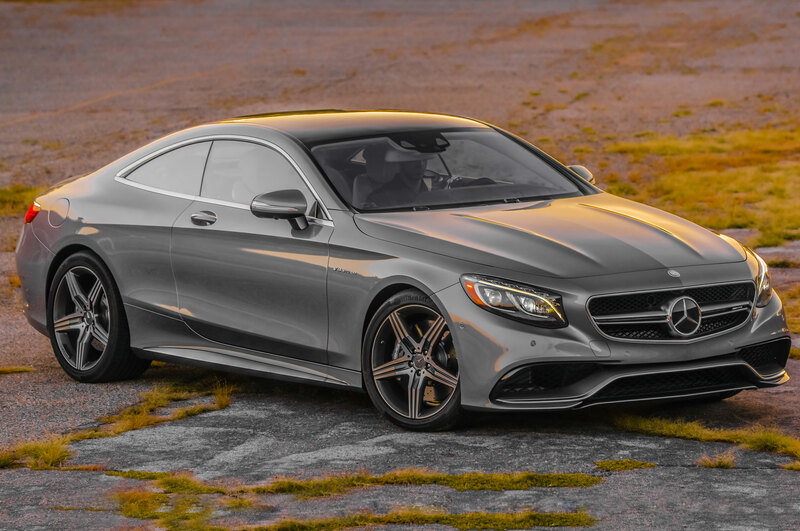 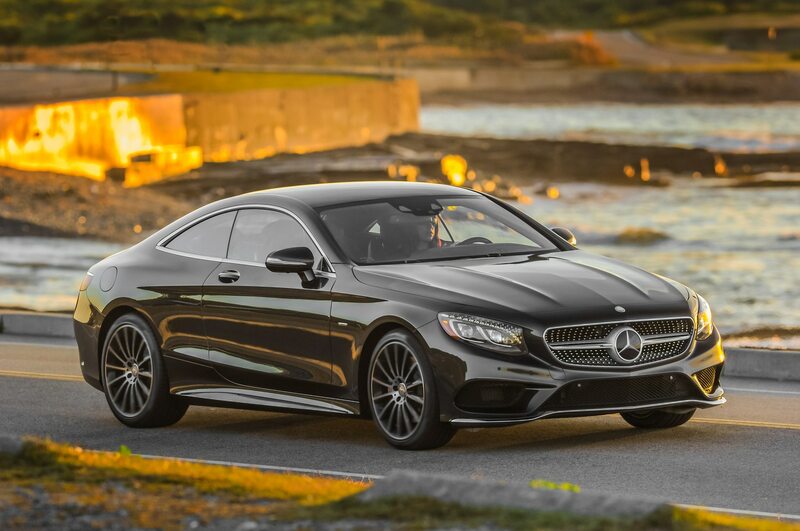 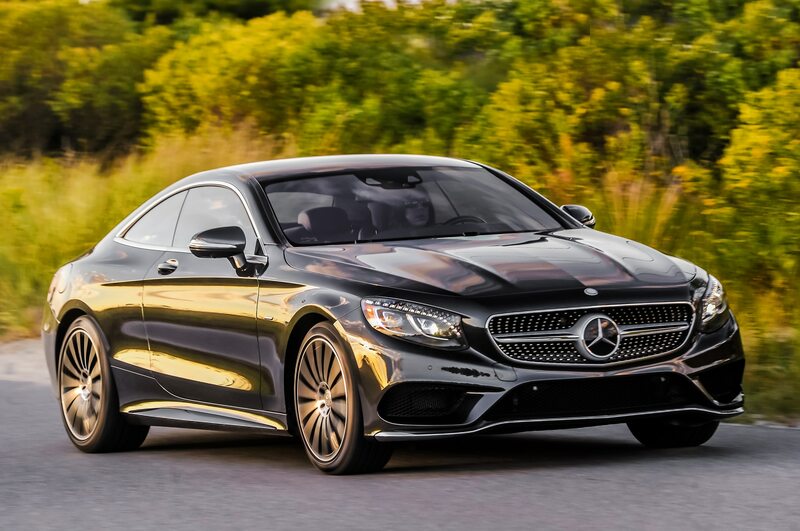 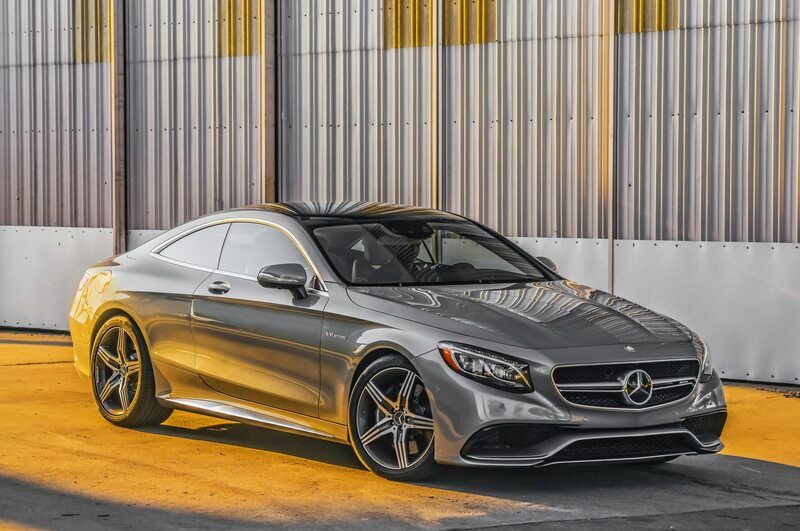 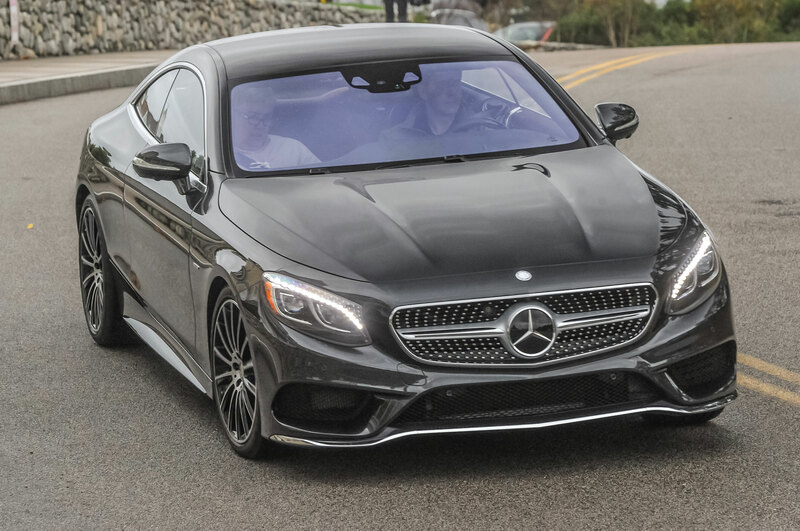 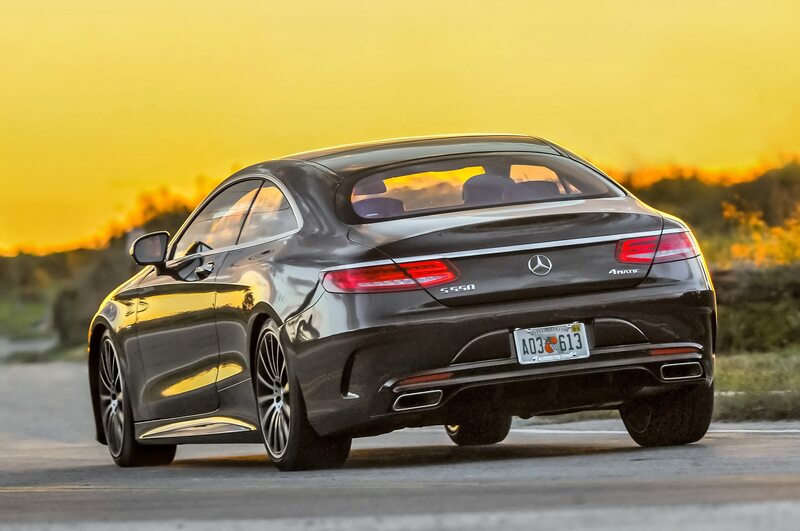 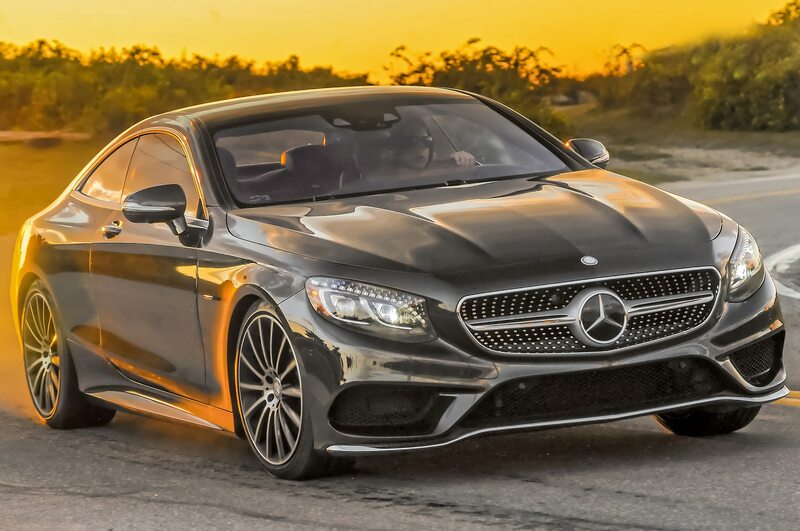 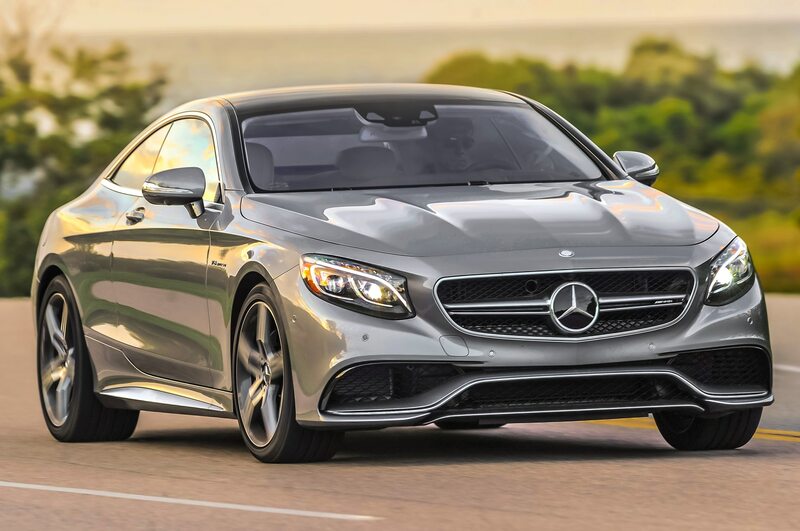 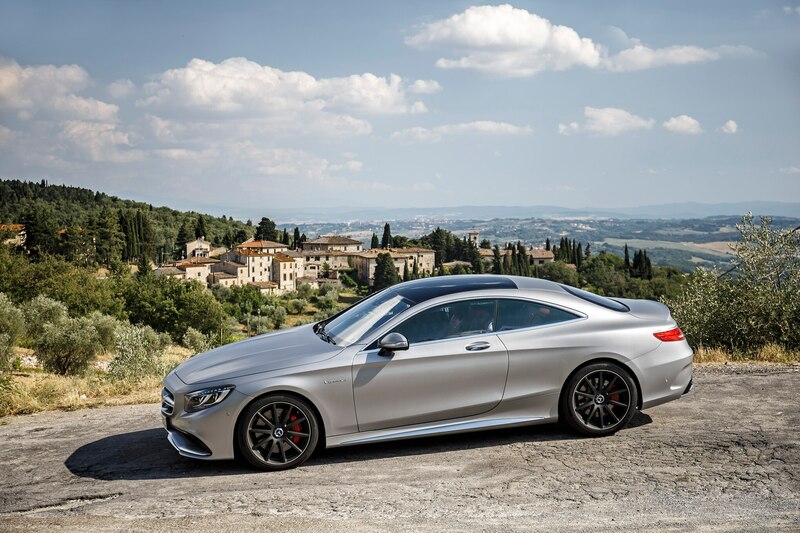 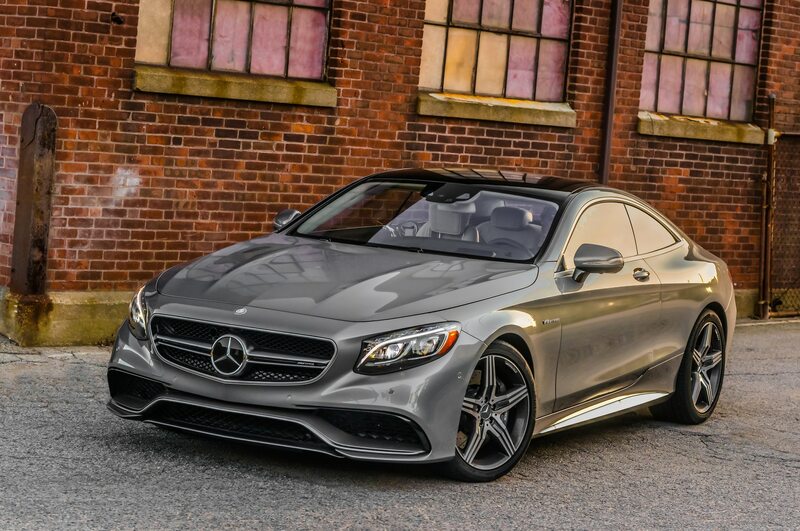 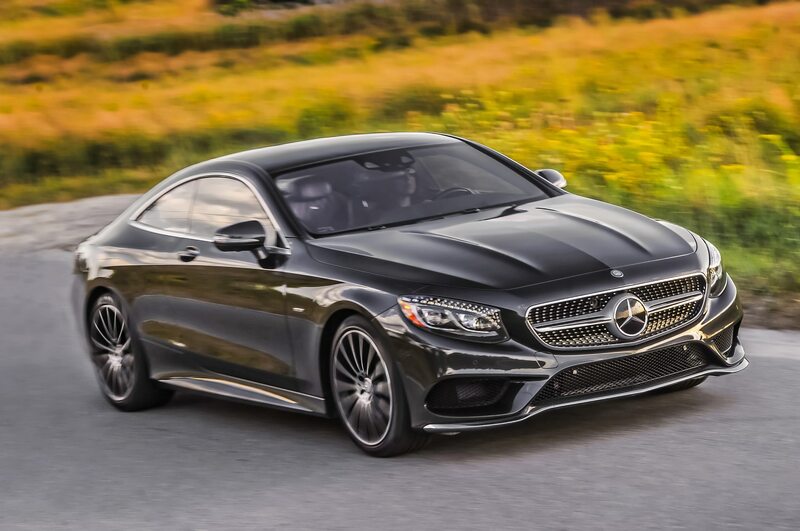 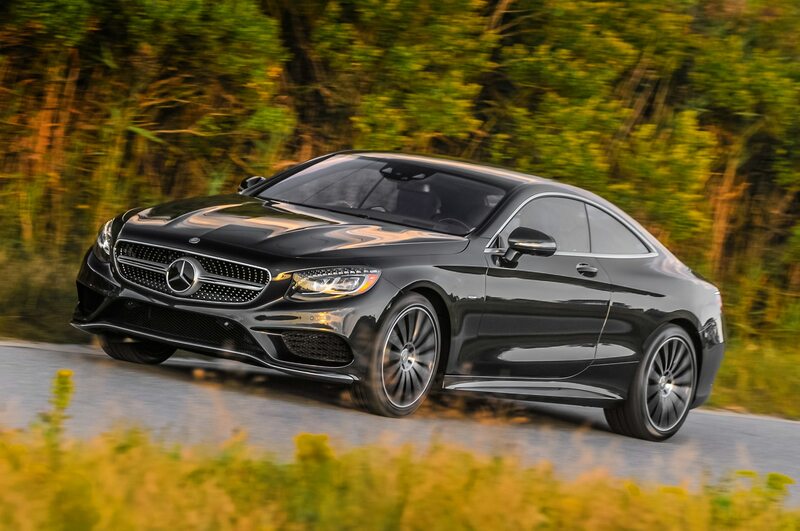 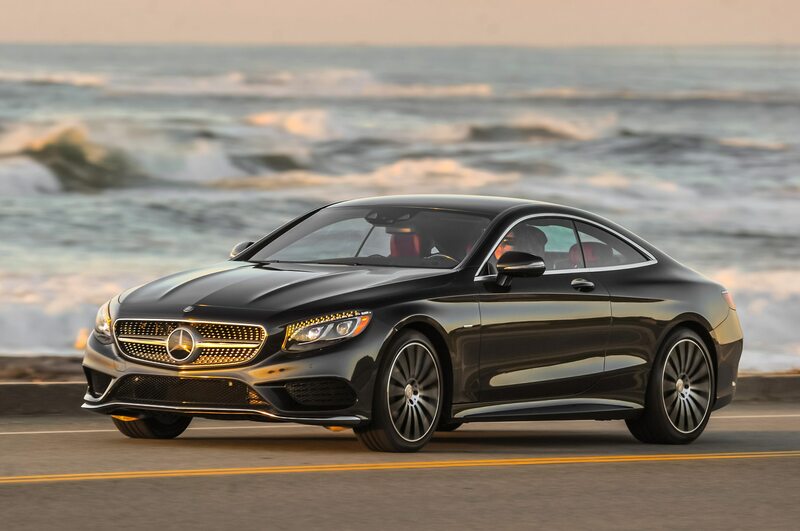 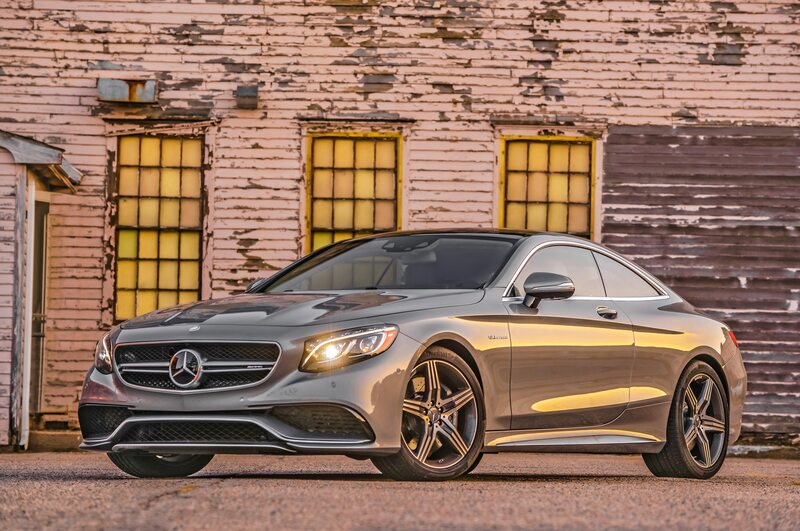 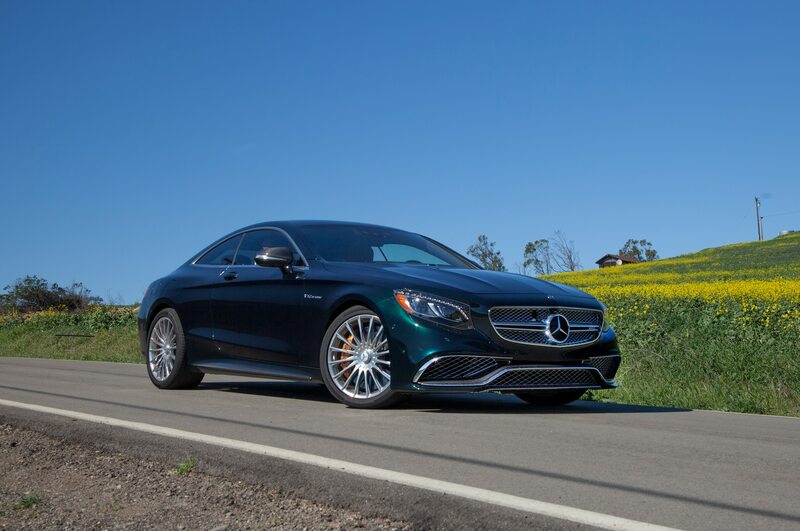 Its $161,825 starting figure marks a significant bump up in price over the S550 coupe, so buyers in this bracket might naturally gravitate toward it as the S-Class coupe that offers more of everything. 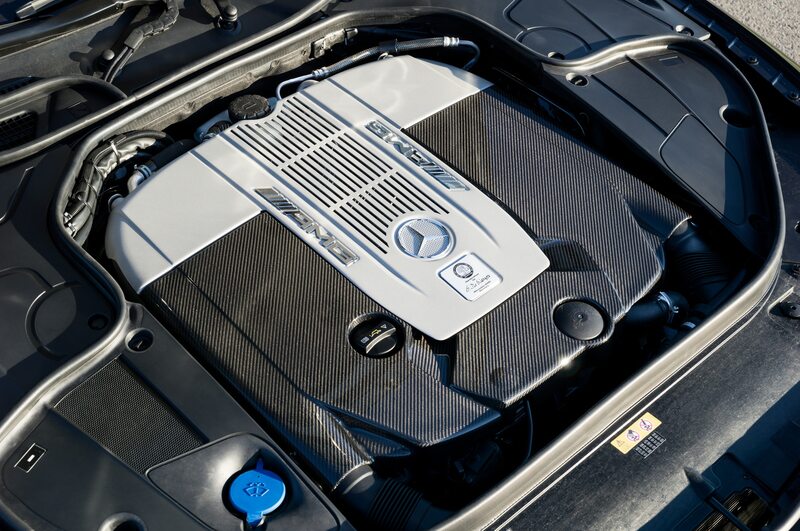 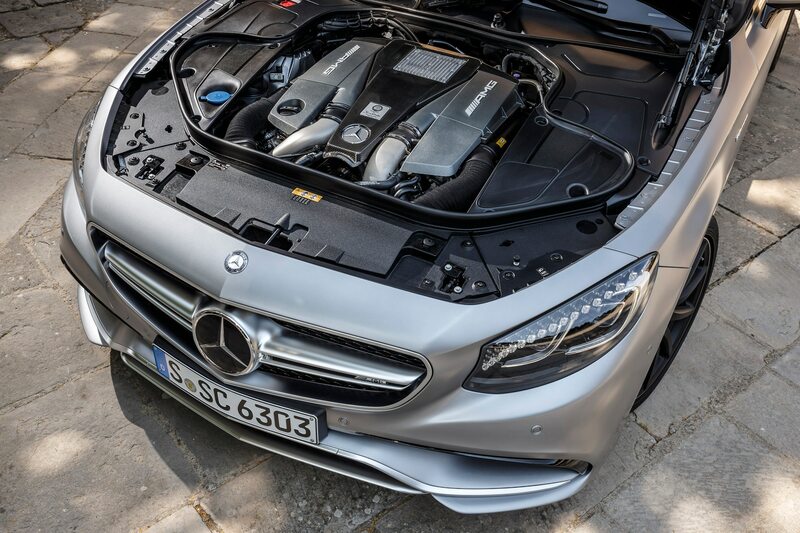 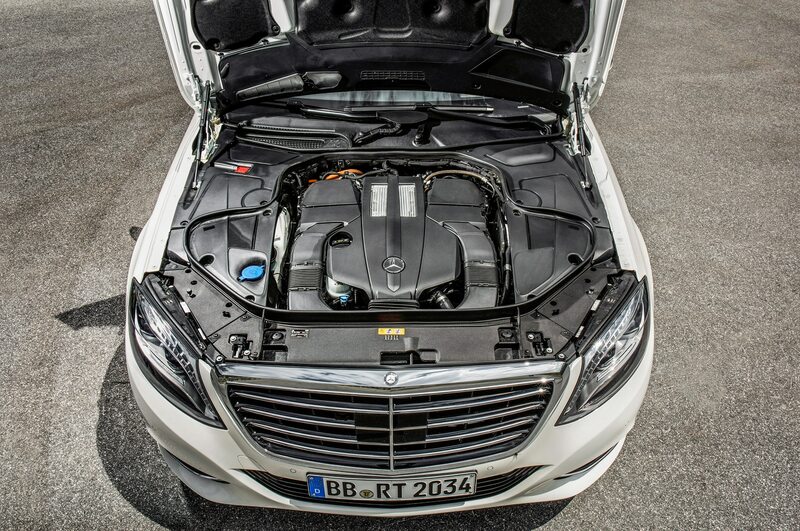 It certainly offers more in terms of power, and the biturbo 5.5-liter V-8 bristles with 577 hp and 664 lb-ft of torque, which are enough to shave the 0-60 time from the S550’s impressive 4.5 seconds to a blistering 3.9 seconds. 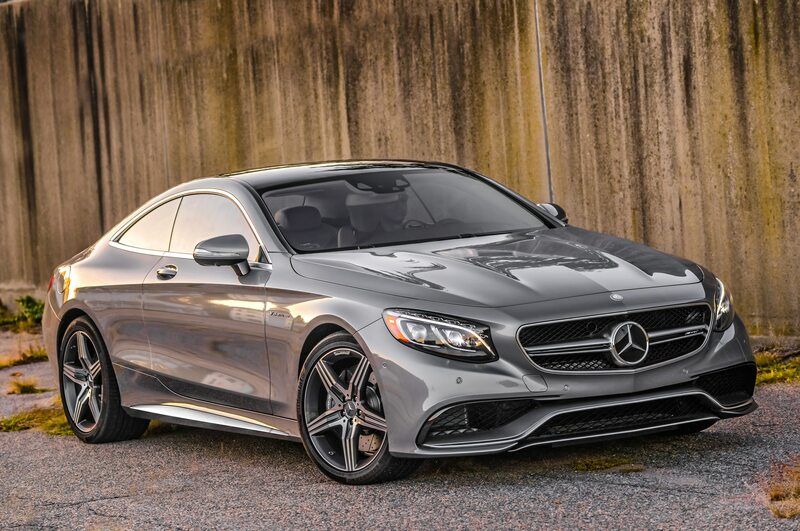 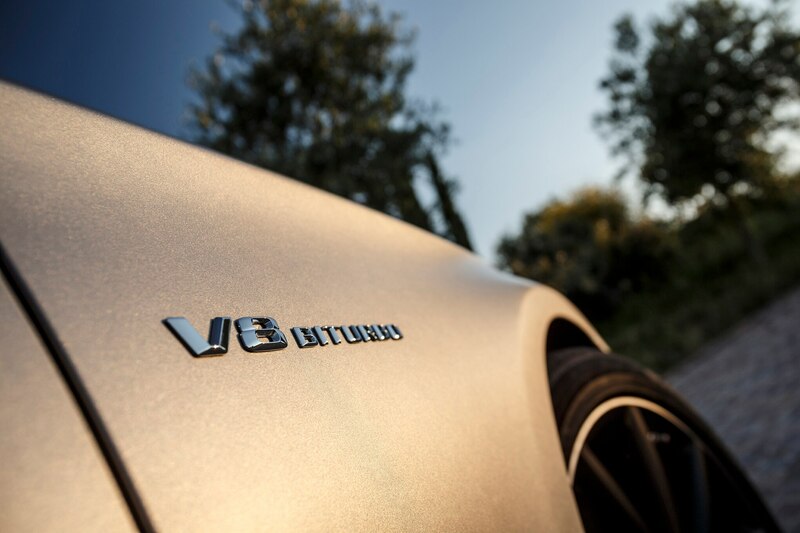 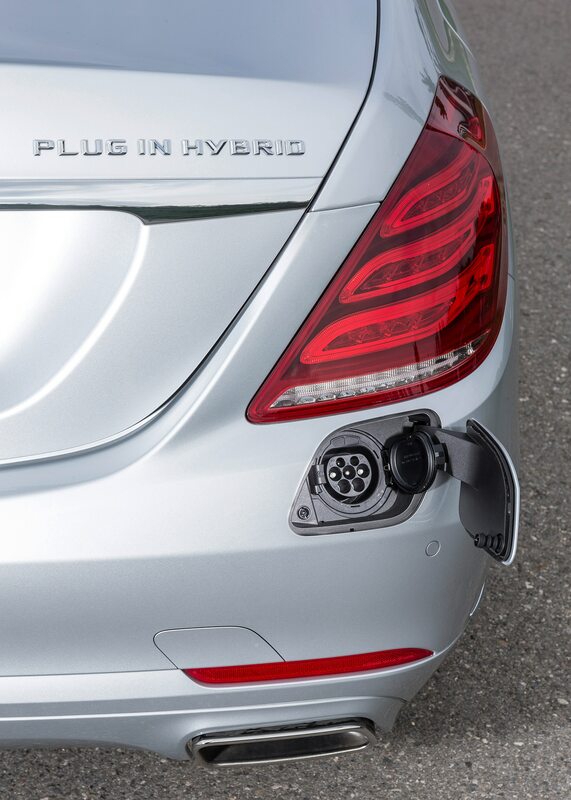 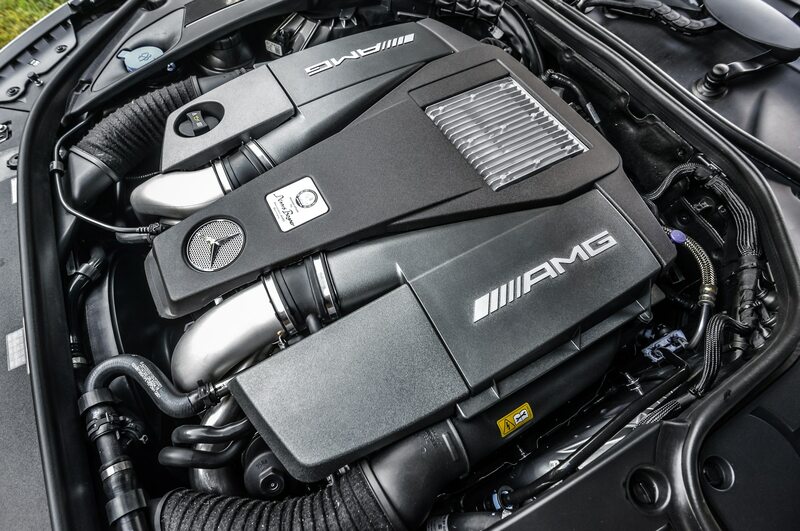 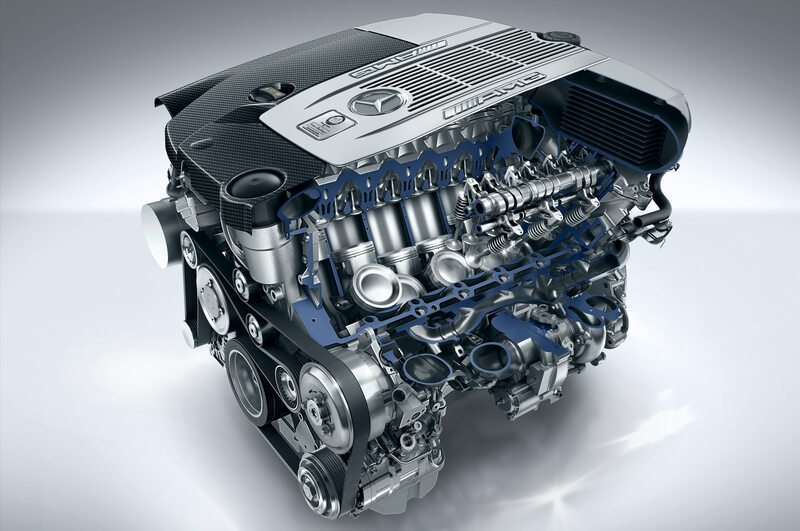 This more powerful V-8 is paired with AMG’s high-tech, seven-speed Speedshift automatic, which whips off near-instantaneous upshifts, though it’s not as smooth in action when moving off from a stop as the S550’s conventional automatic. 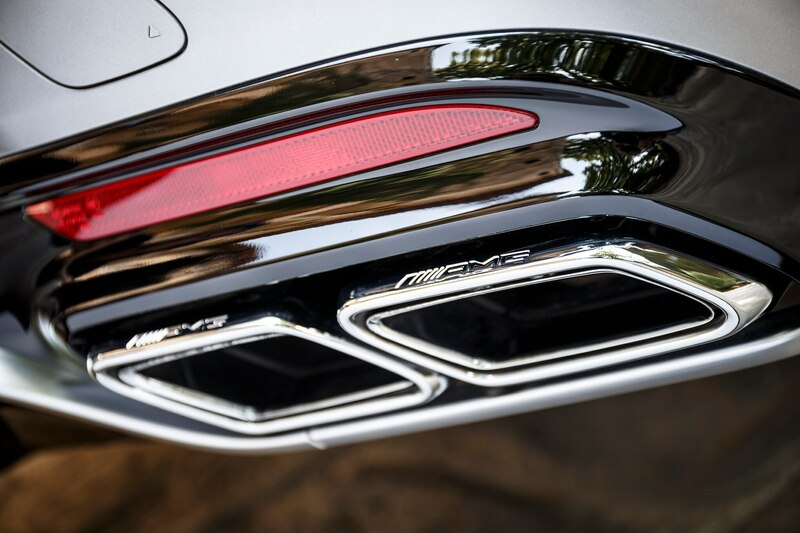 The S63 AMG’s twin-turbo V-8 also emits a deeper rumble and pops on the overrun when you flick its two-stage exhaust system into Sport mode. 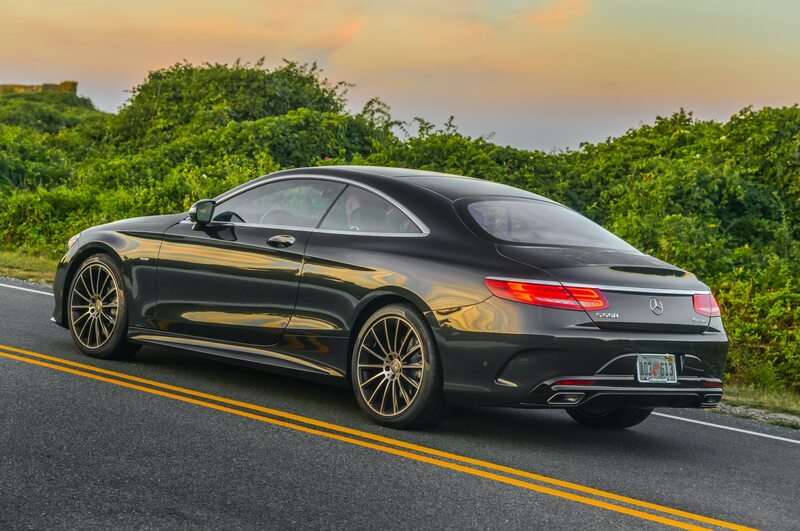 The Sport mode additionally firms up the suspension more than in the S550, and the ride can get a little brittle over broken pavement. 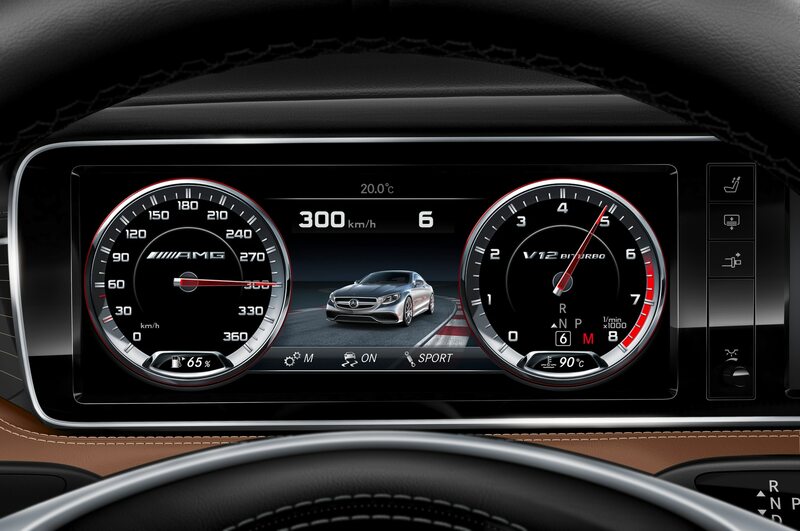 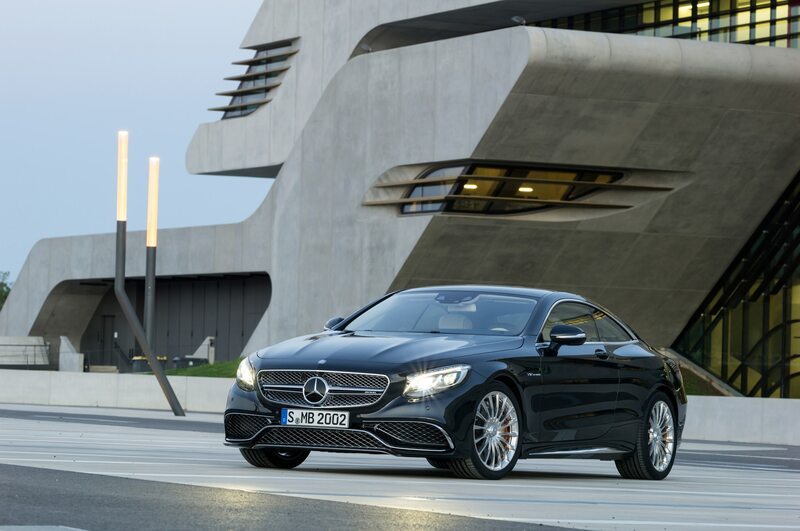 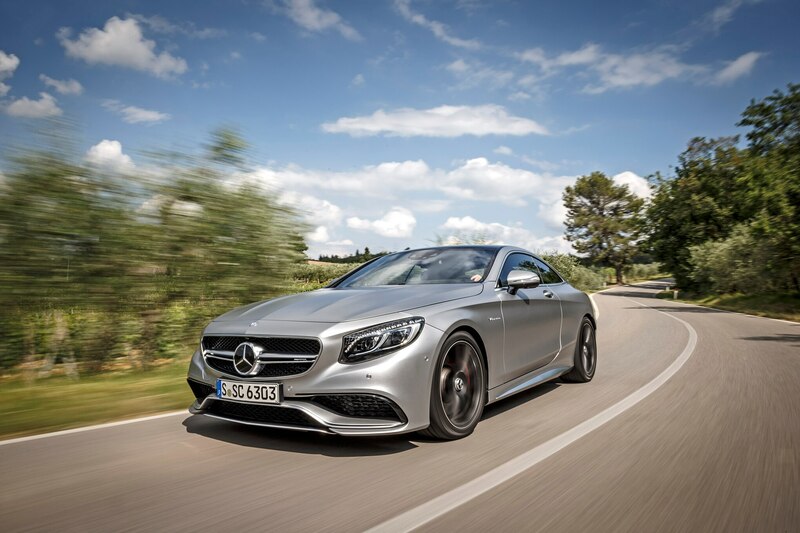 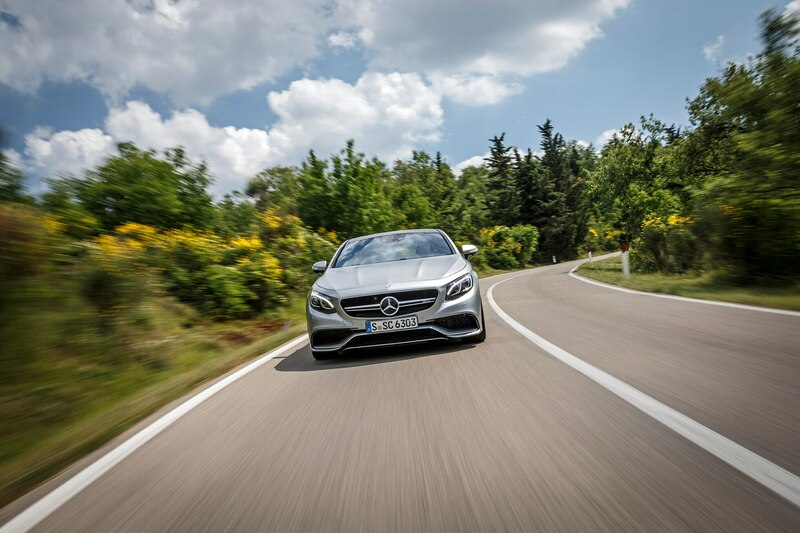 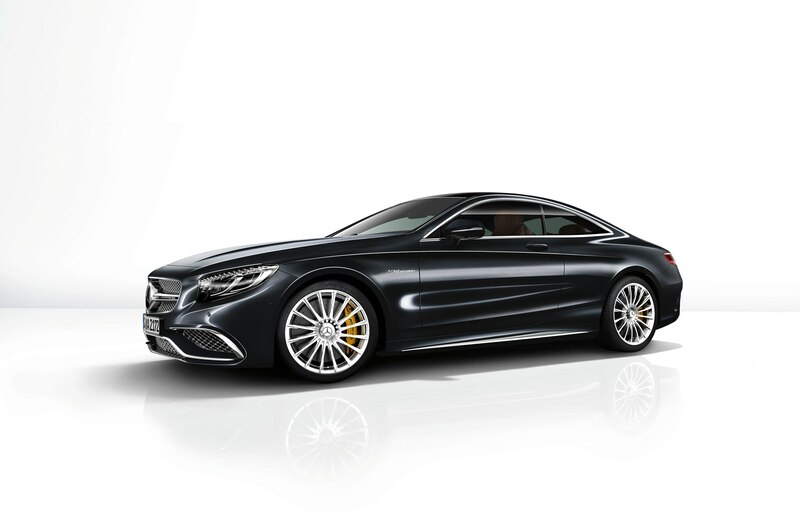 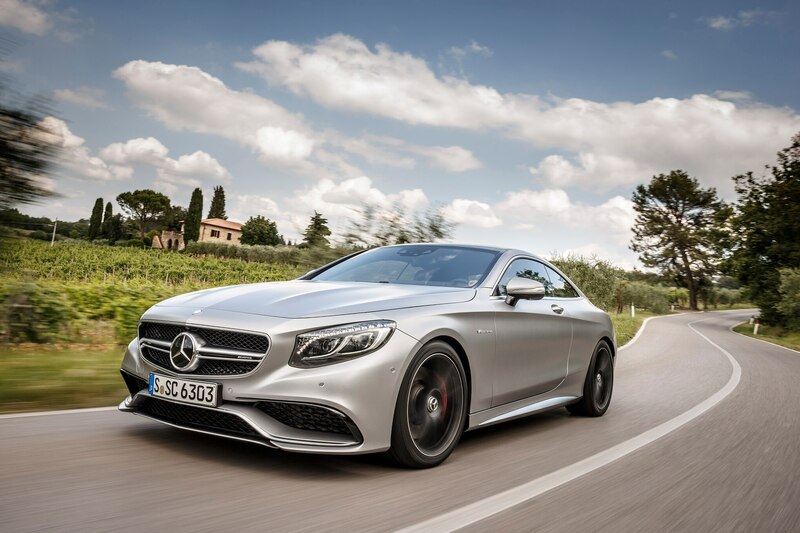 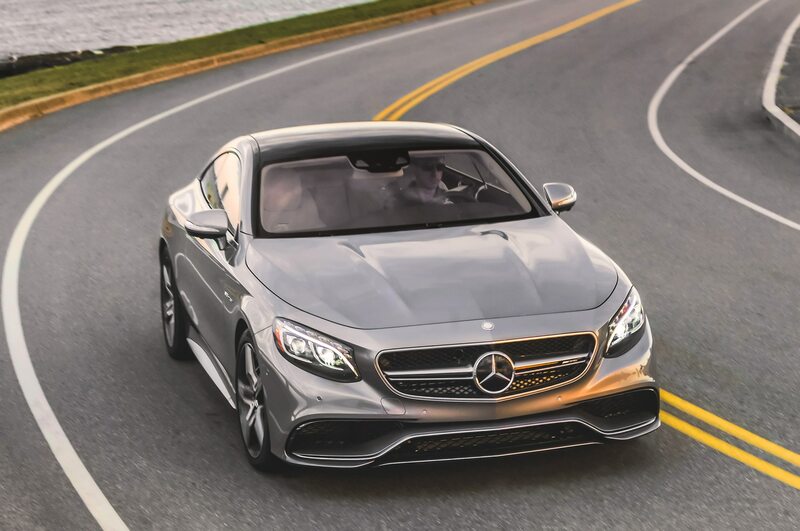 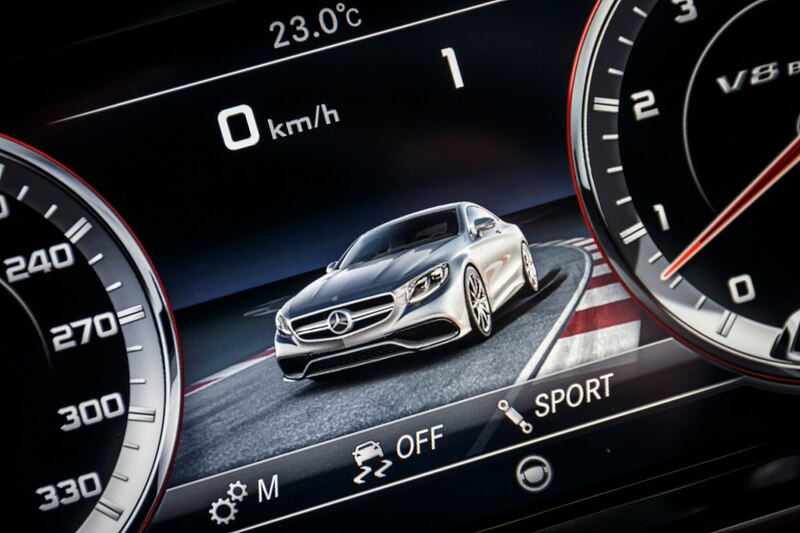 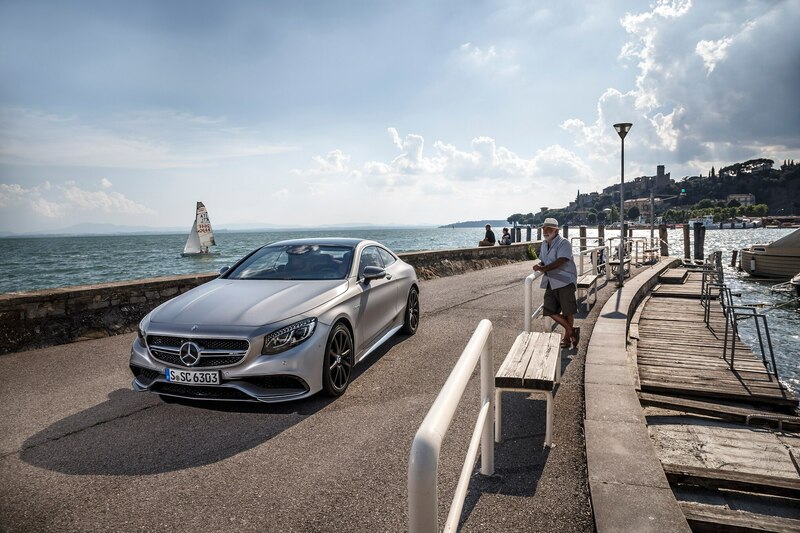 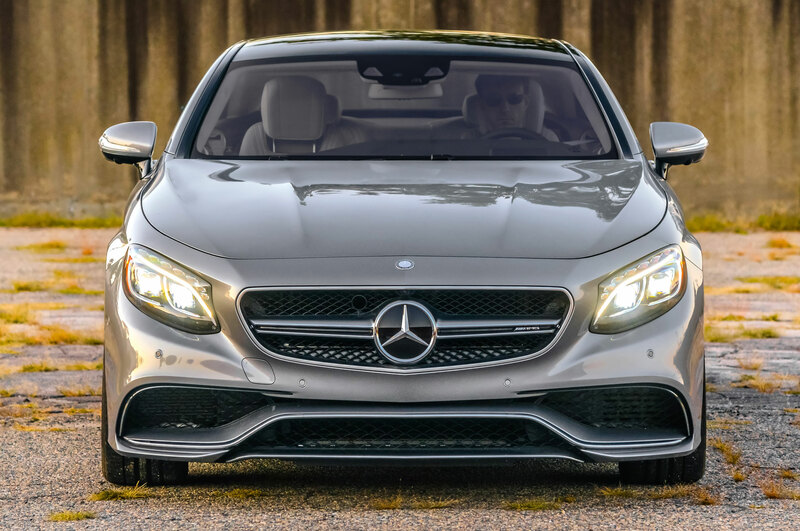 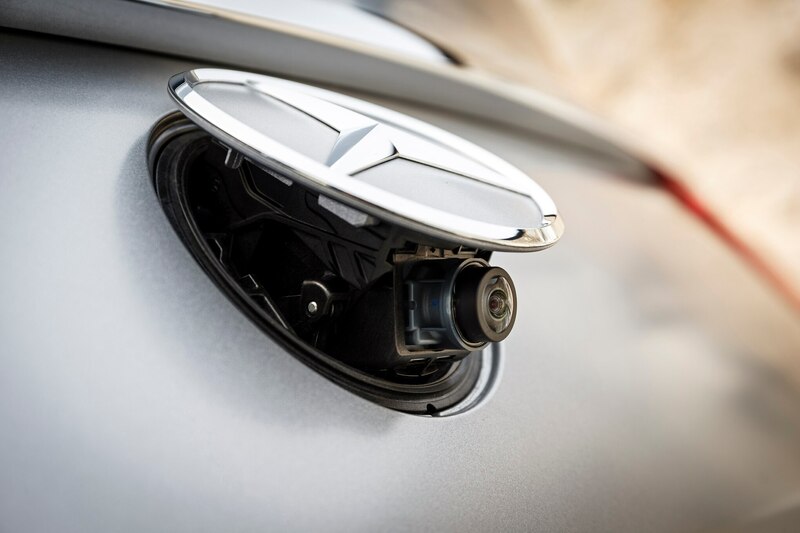 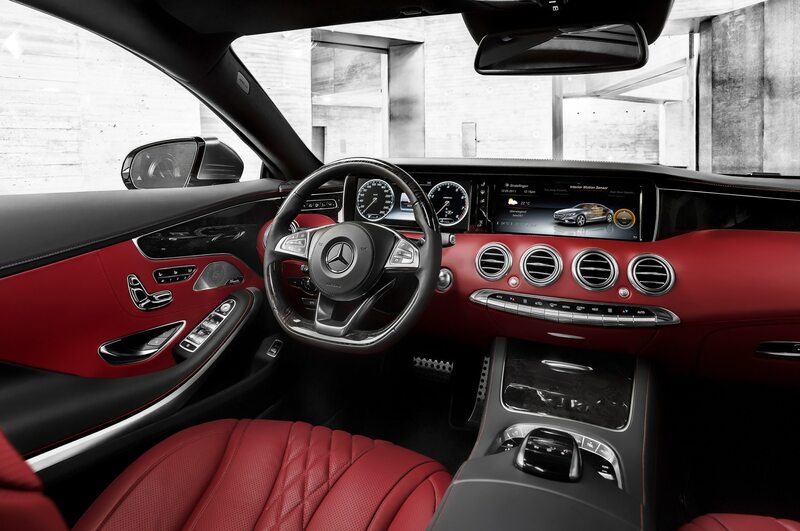 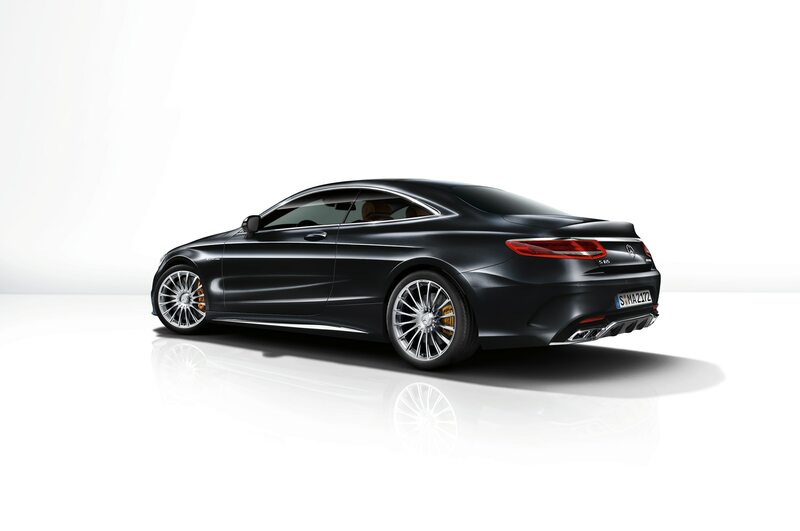 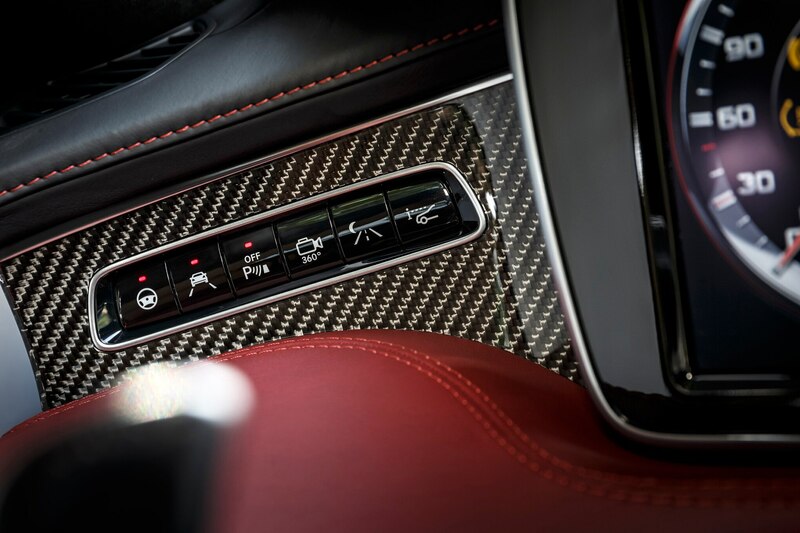 The S63 AMG coupe adds as standard the Premium option package, with the useful head-up display and surround-view camera, as well as massaging, variable heating, and the strange active contour function for the front seats. 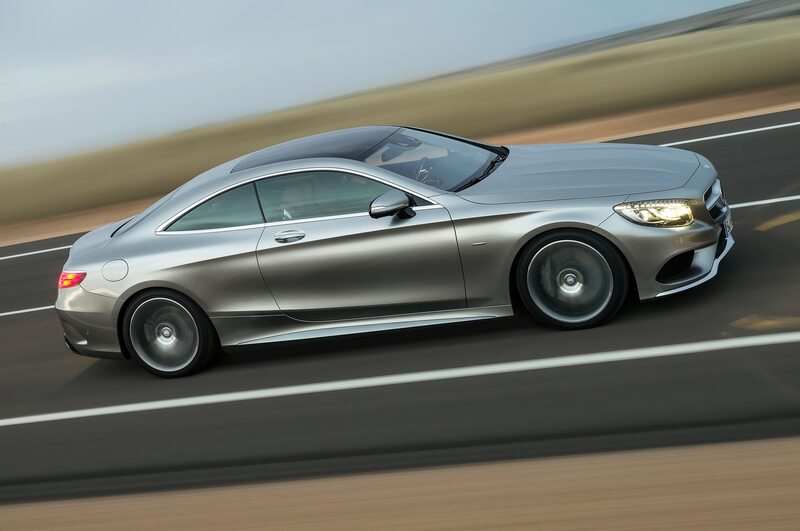 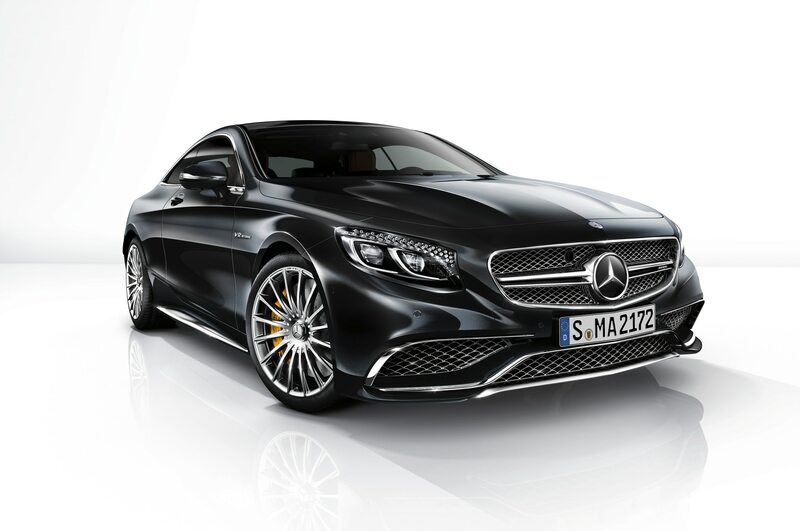 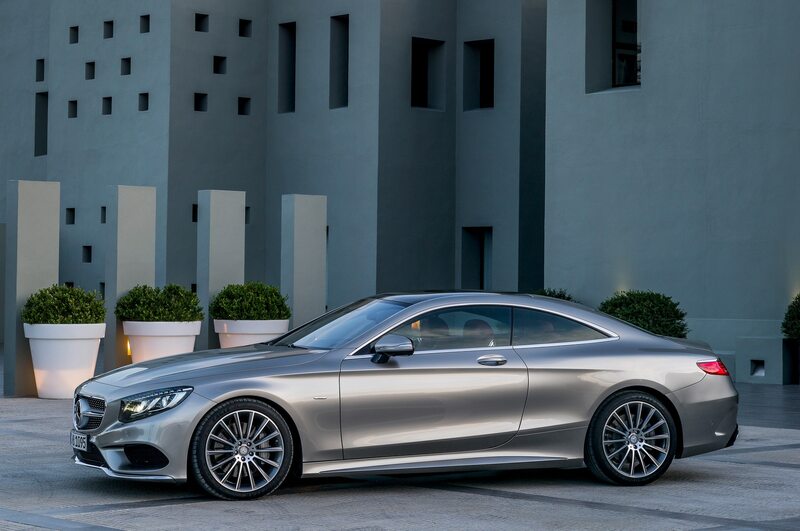 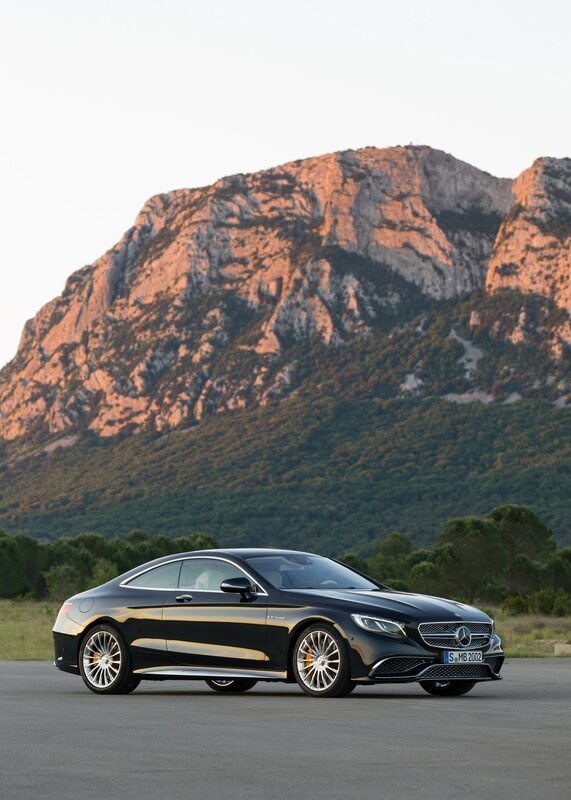 However, buyers of the S550 coupe can add that package, along with AMG-style bodywork and 19- or 20-inch wheels. 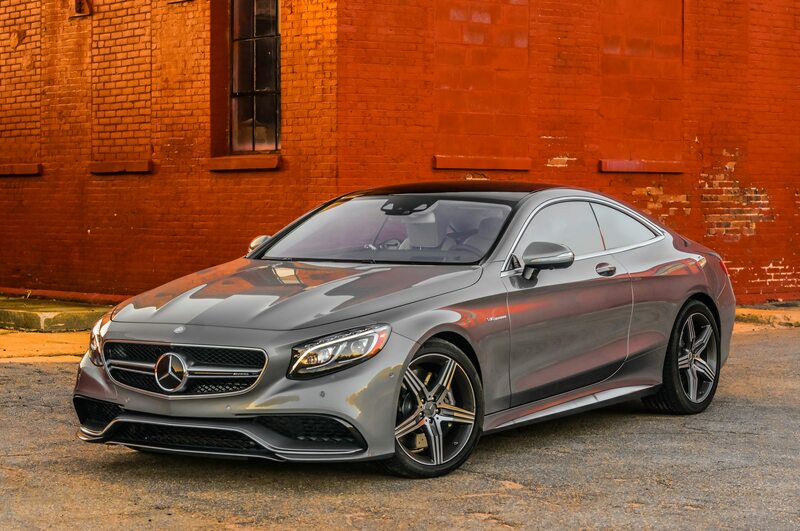 In truth, the 2015 Mercedes-Benz S550 coupe is really the best-realized version of this new high-style, two-door Mercedes. 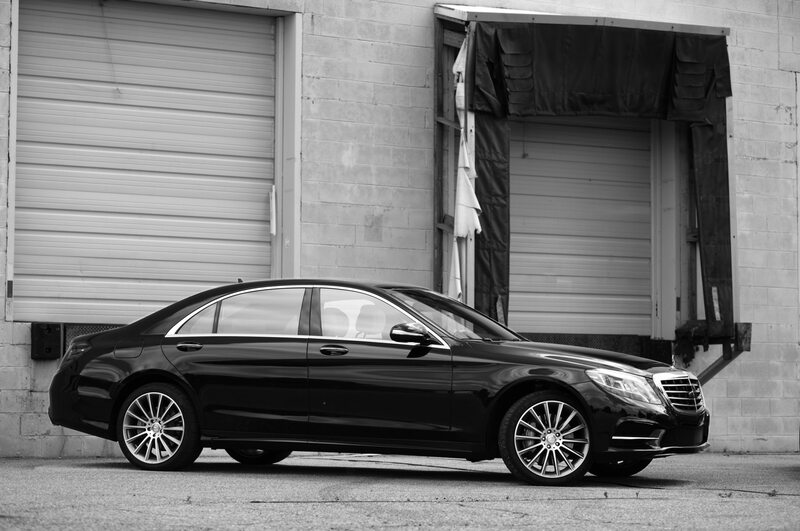 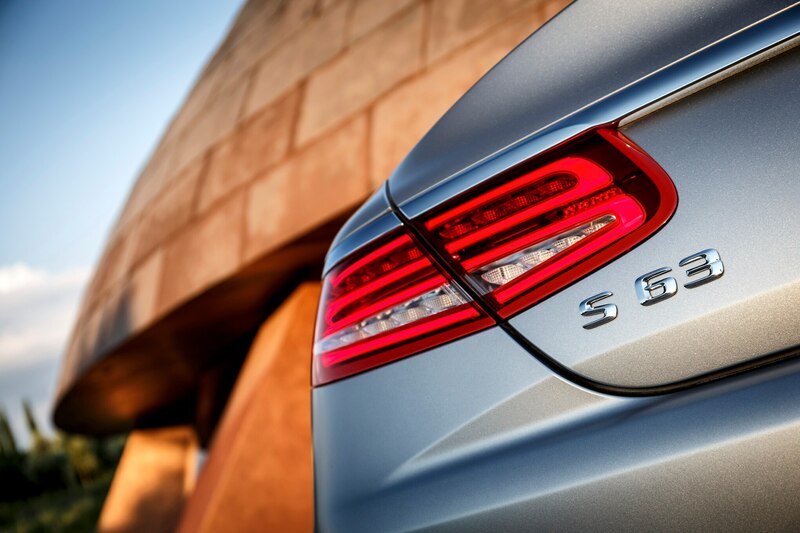 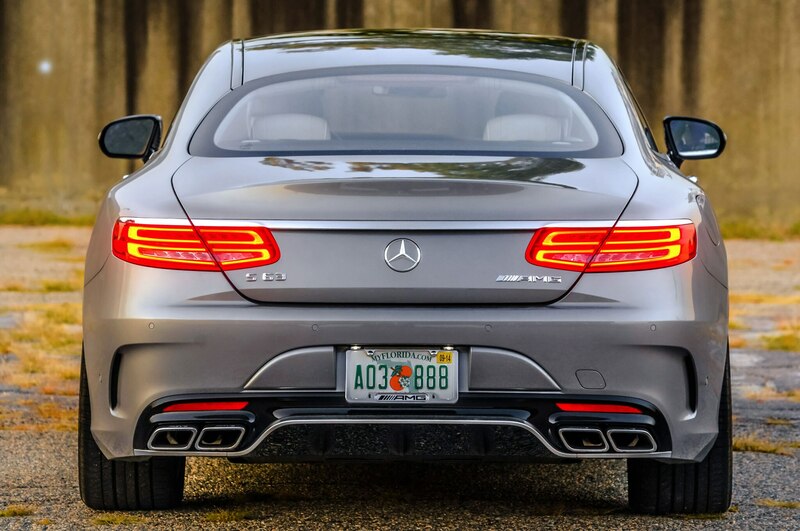 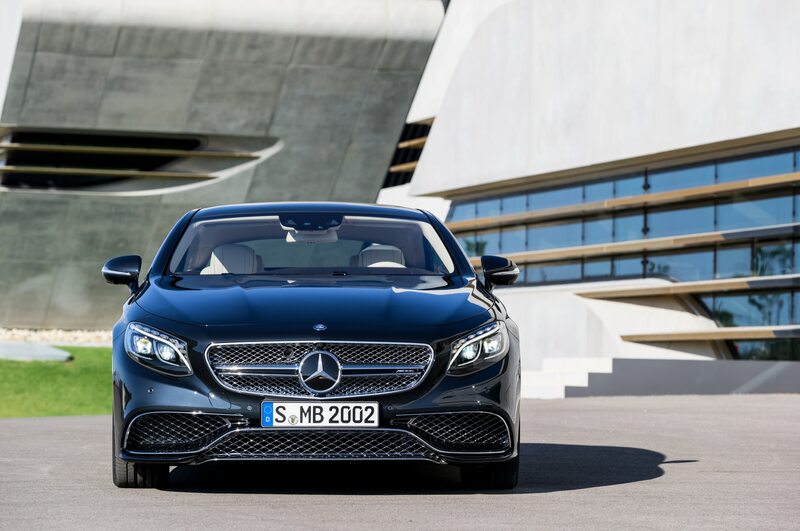 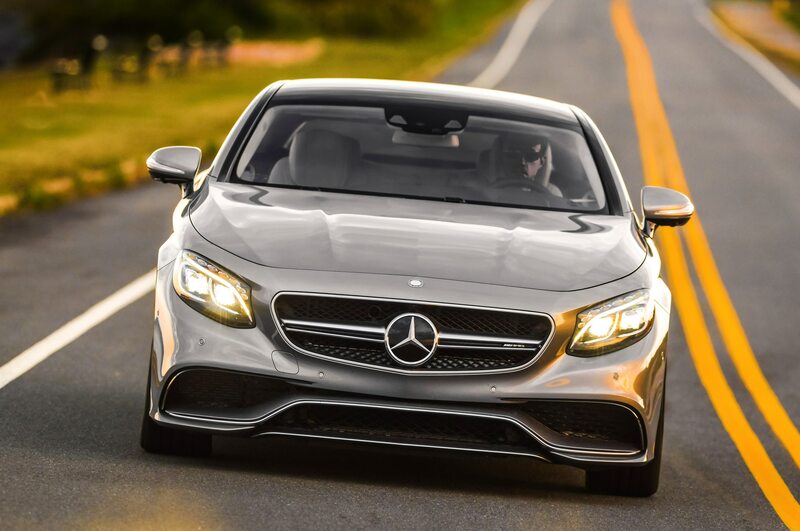 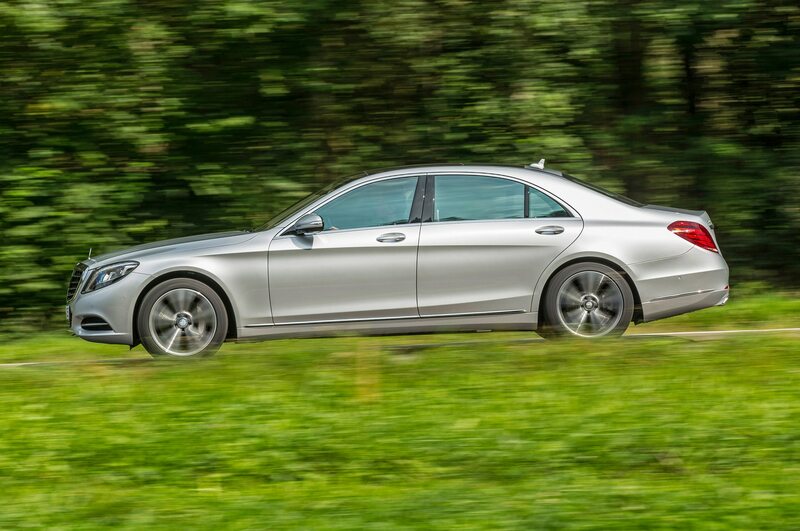 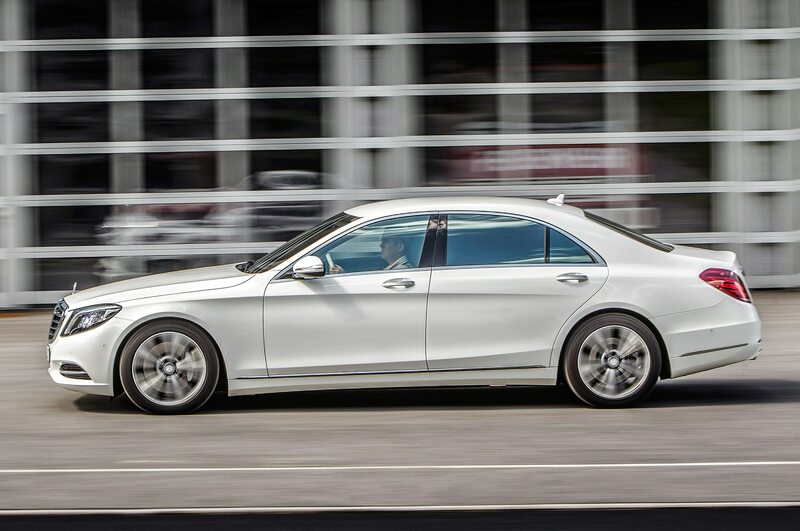 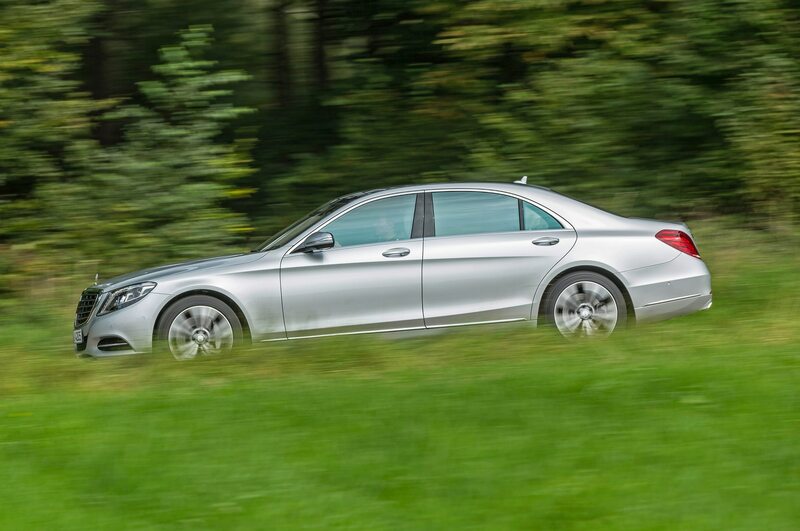 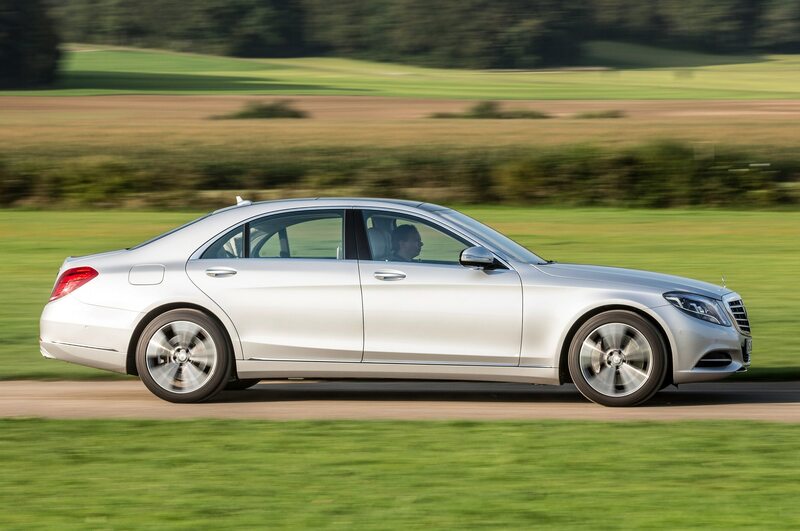 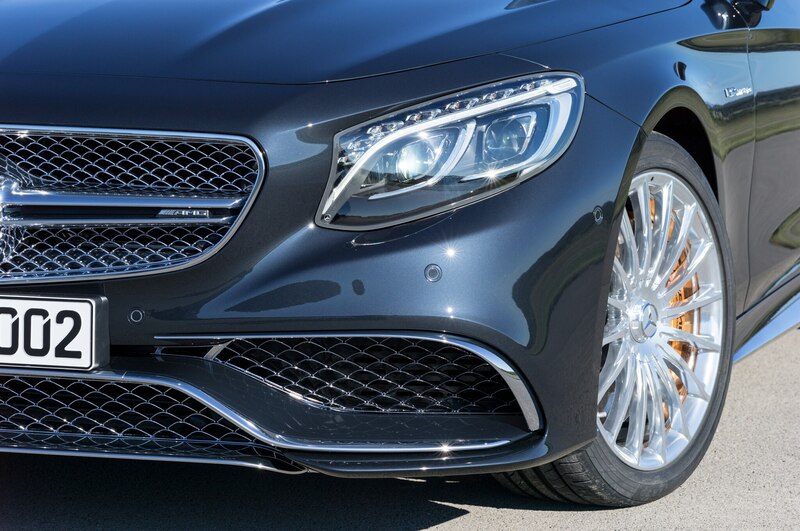 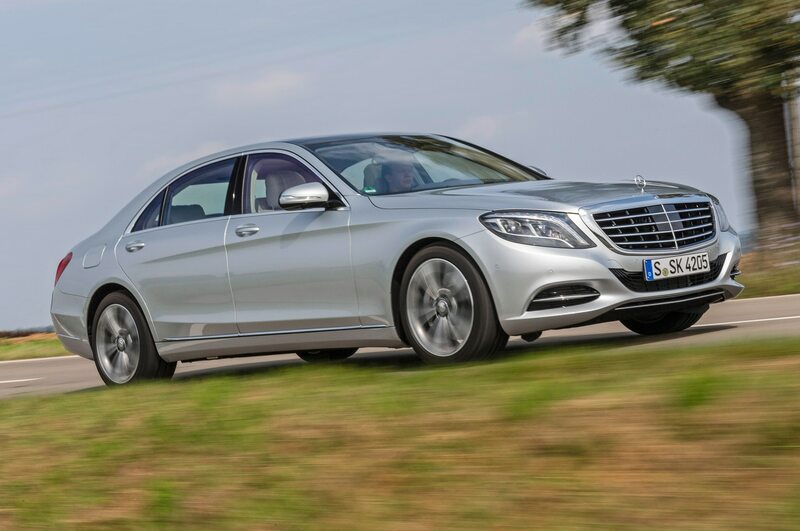 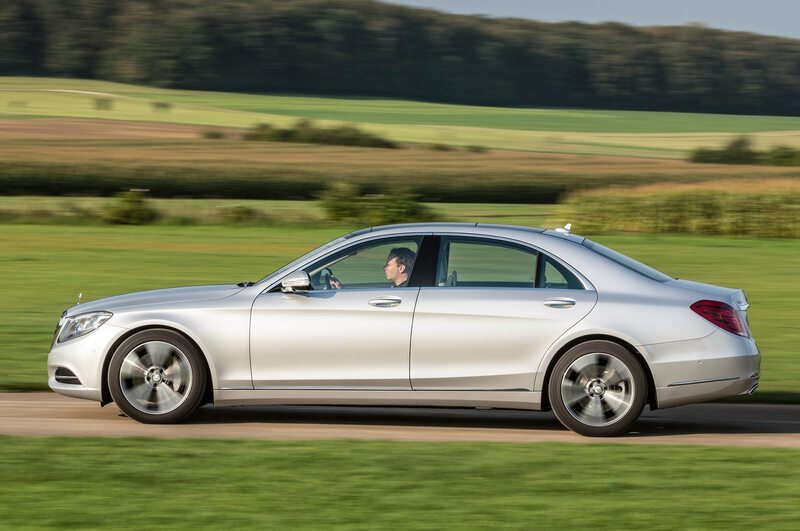 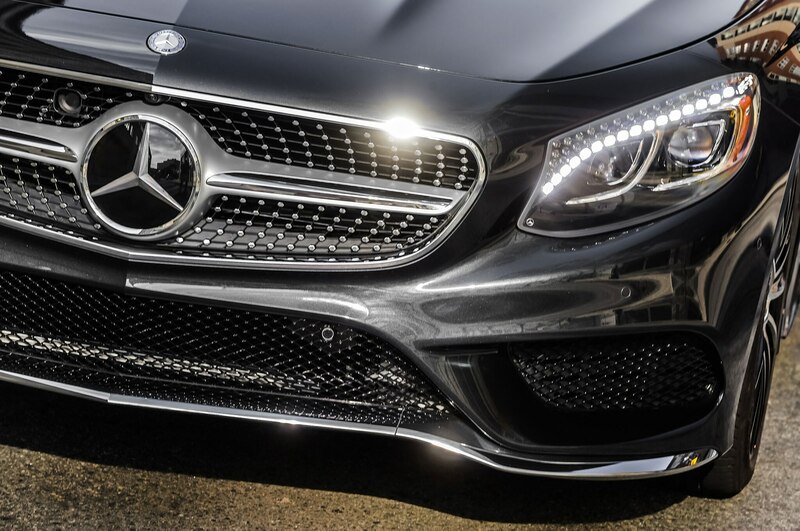 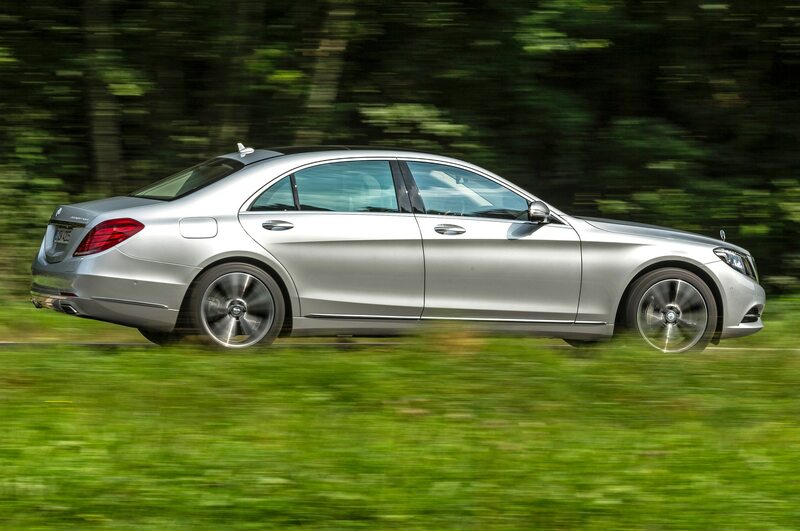 For buyers seeking more, the 2015 S63 AMG delivers, but it comes with a bit of an edge. 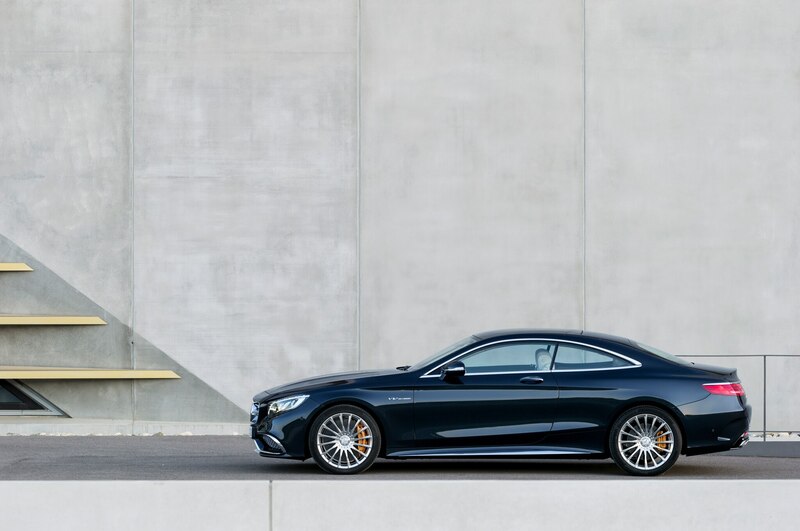 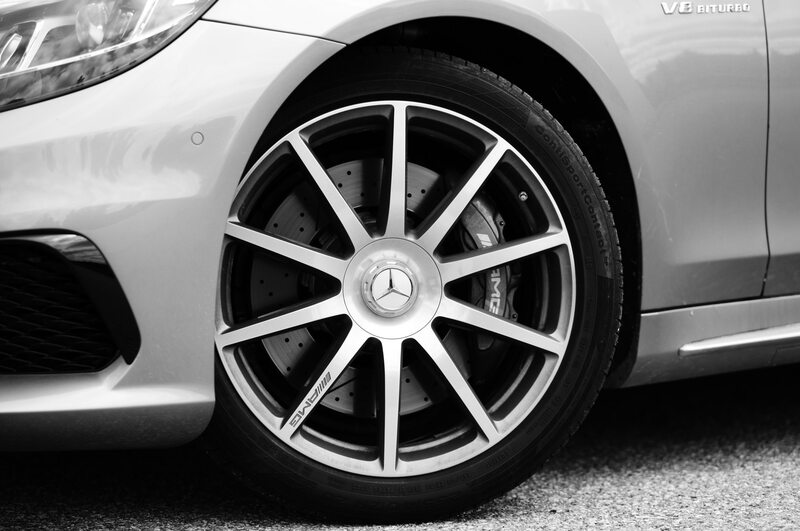 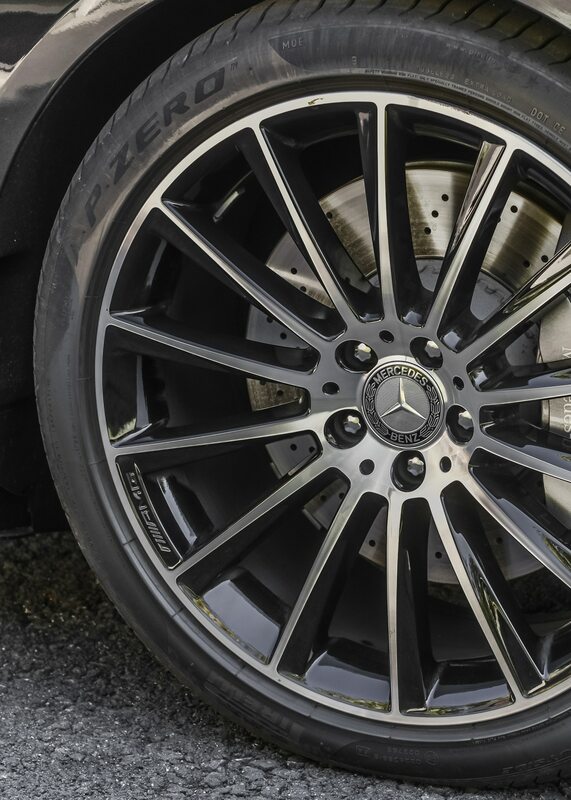 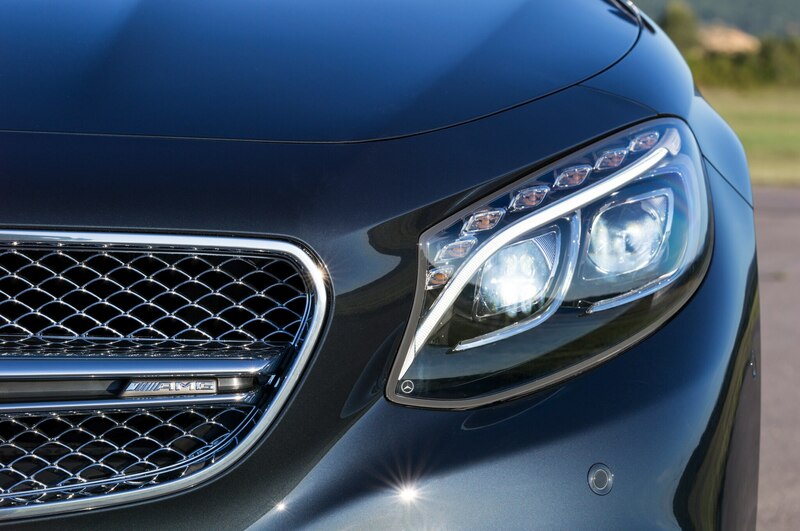 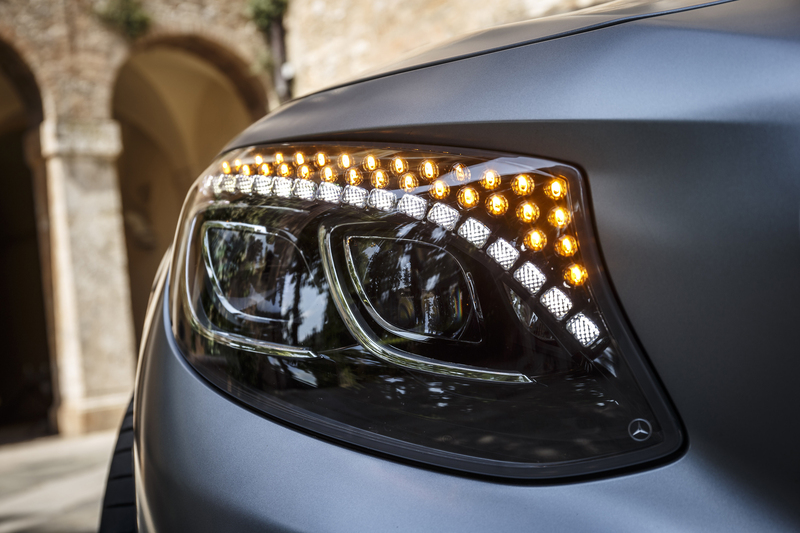 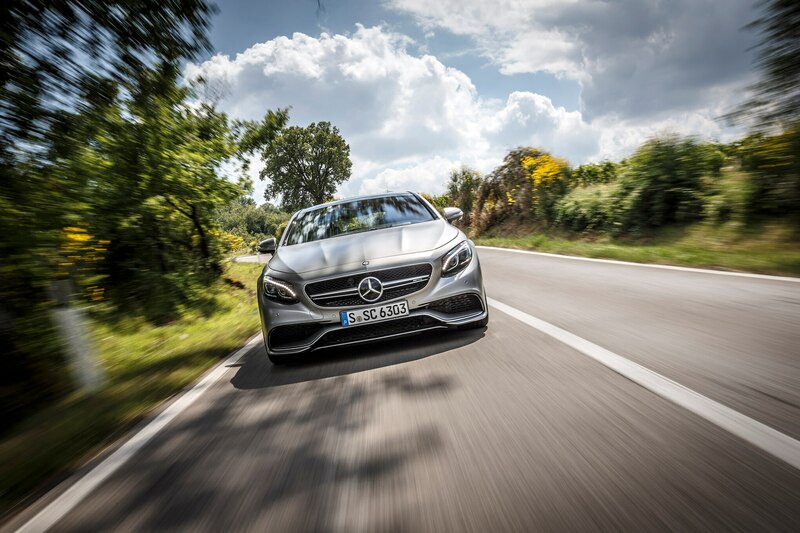 As swanky cars go, one requires a certain kind of restraint to go along with style and power, and this car delivers traditional Mercedes character. 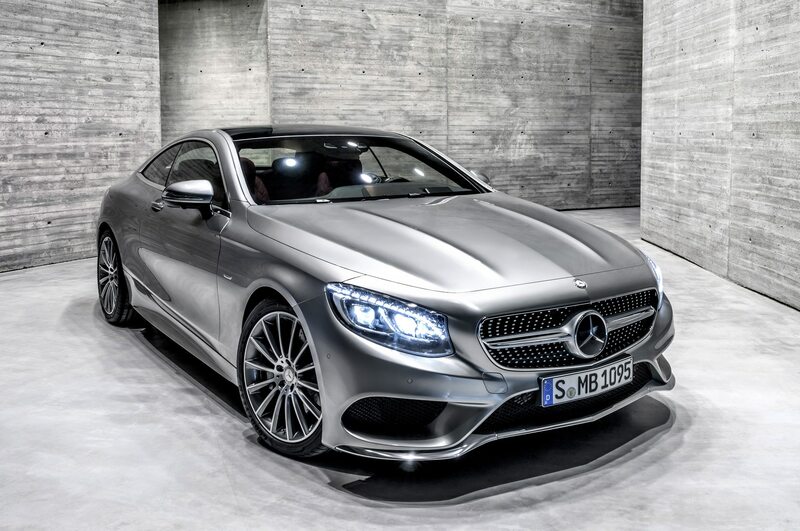 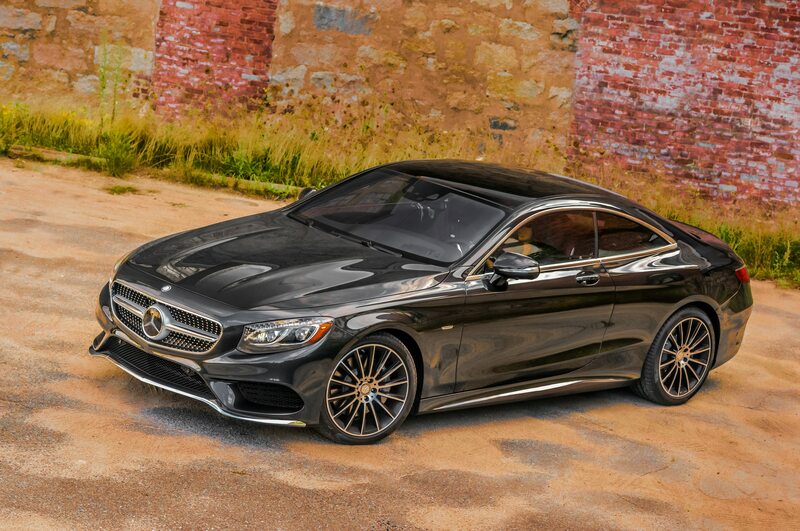 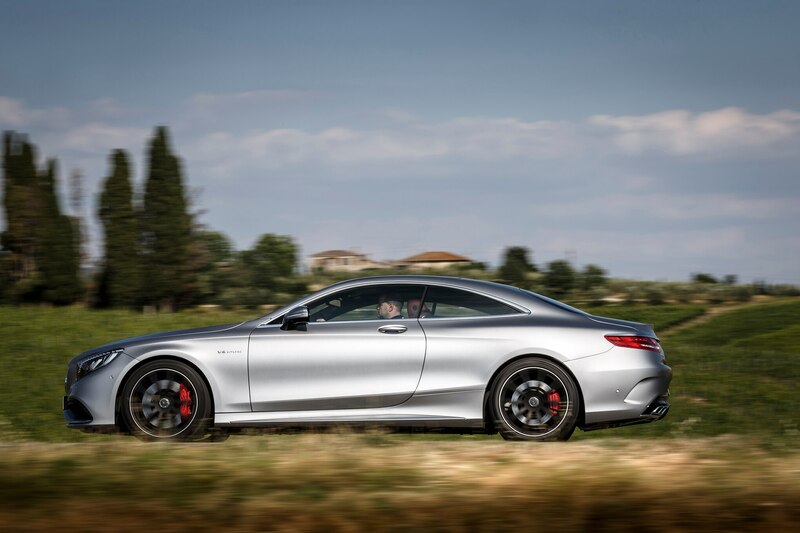 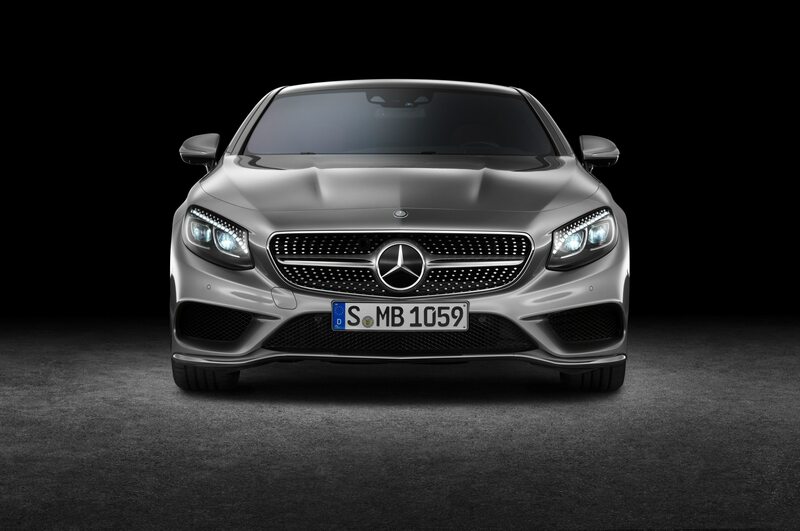 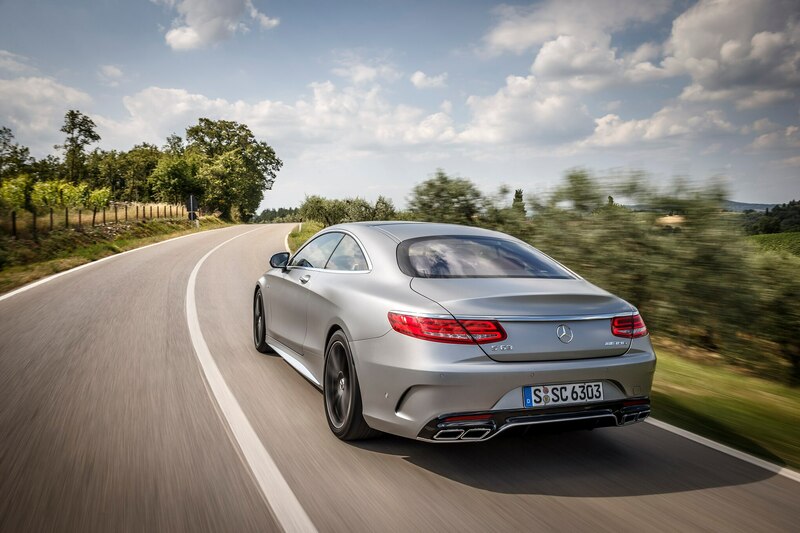 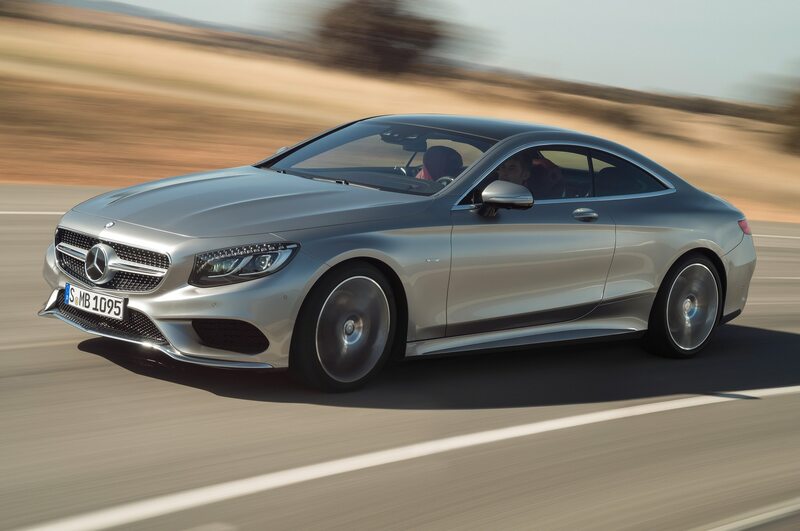 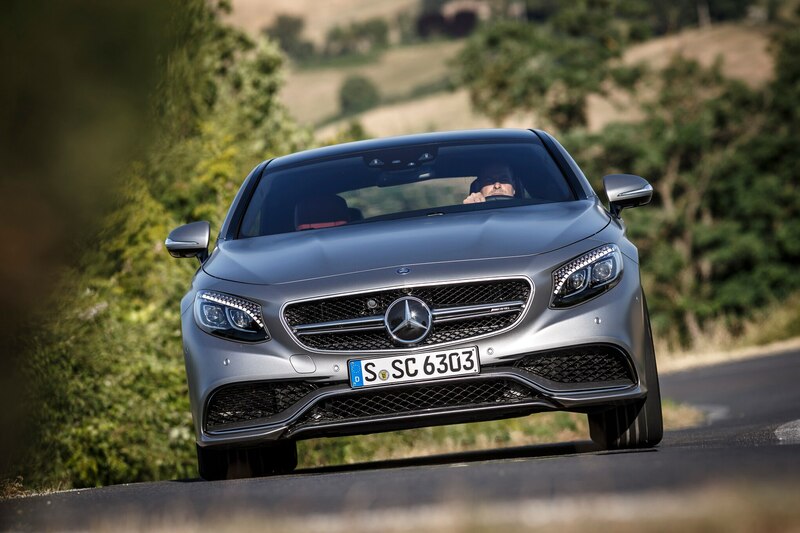 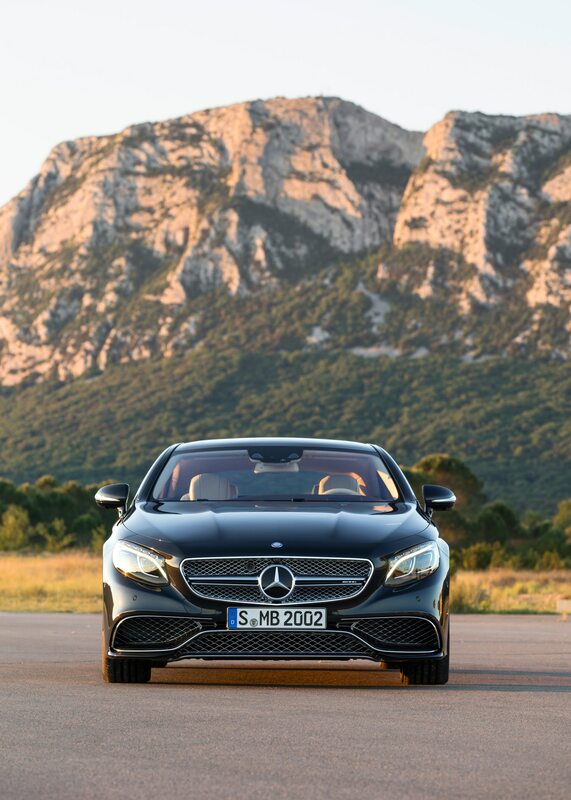 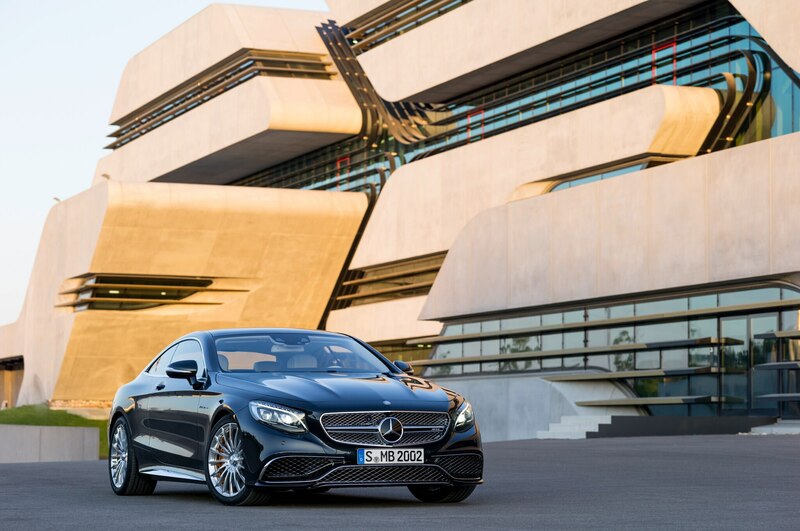 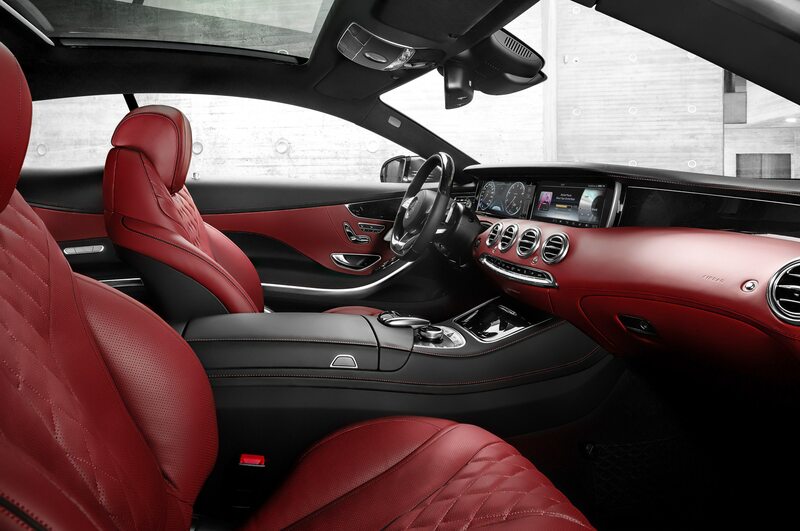 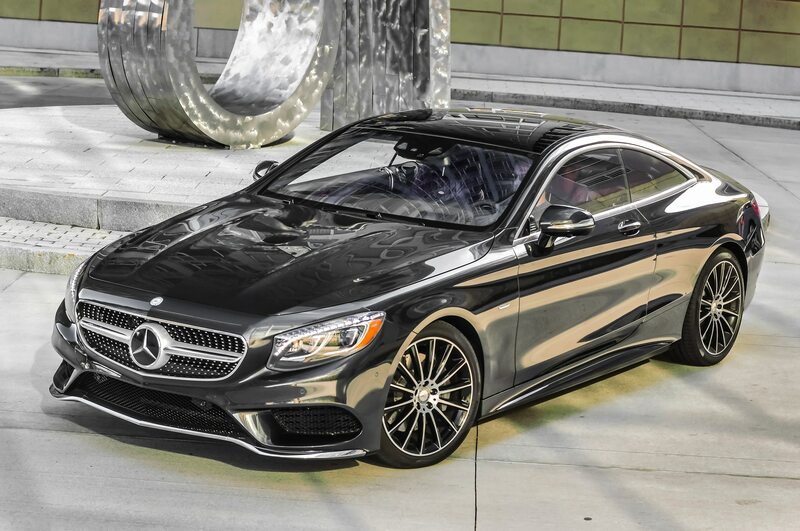 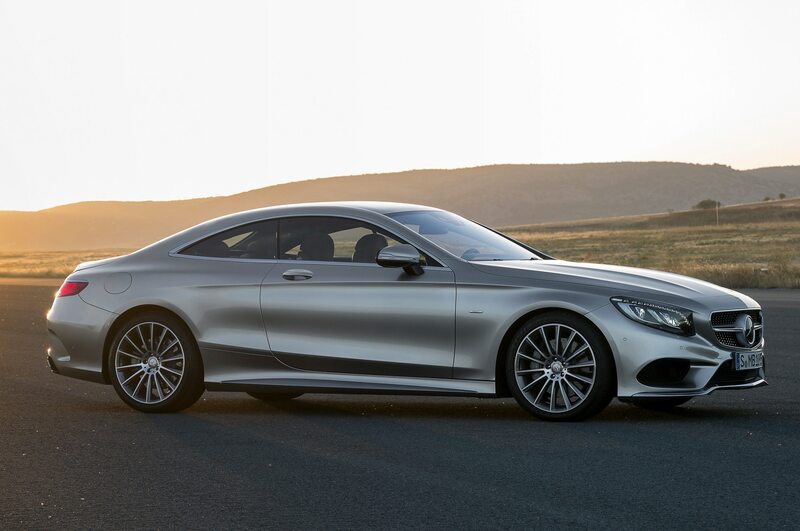 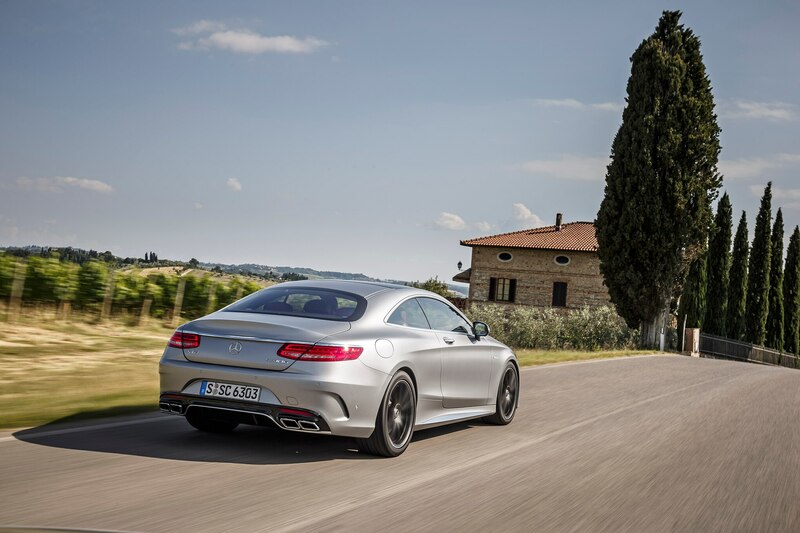 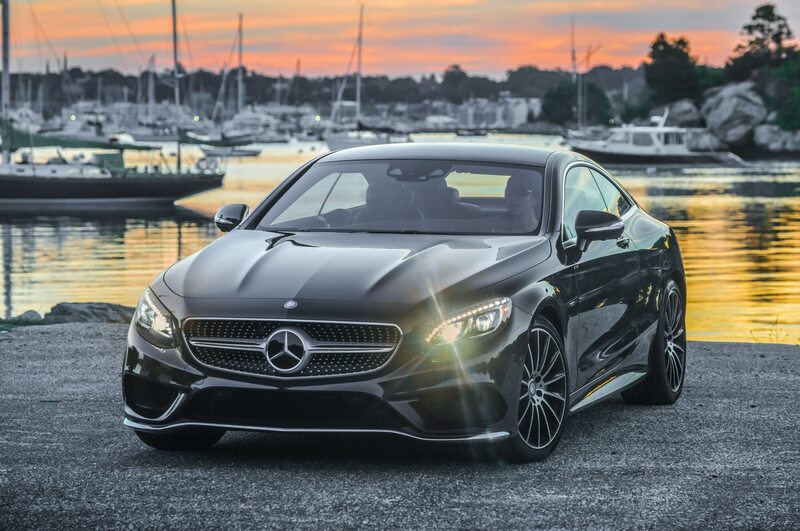 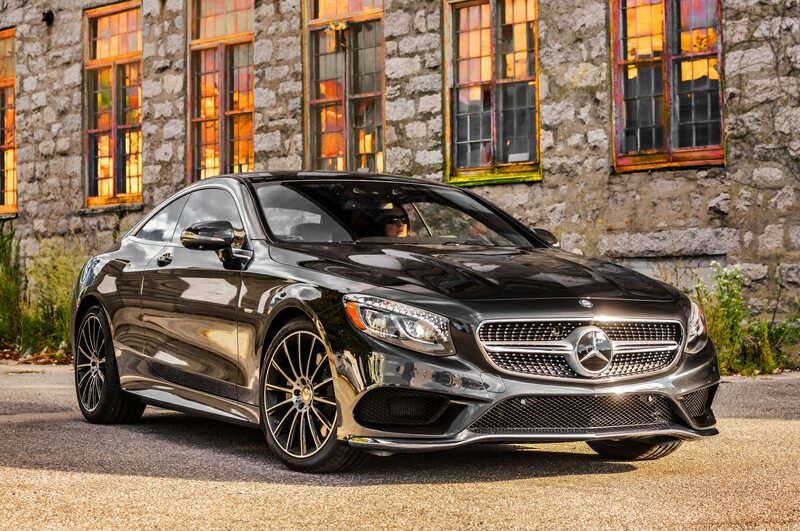 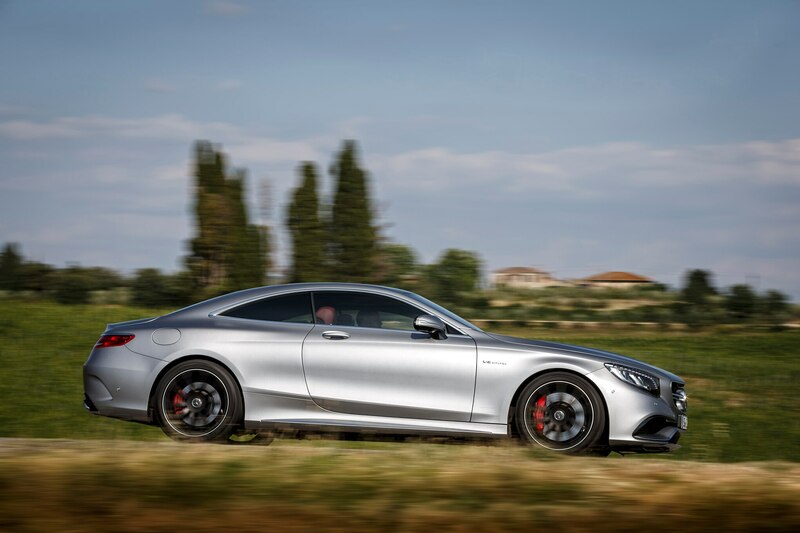 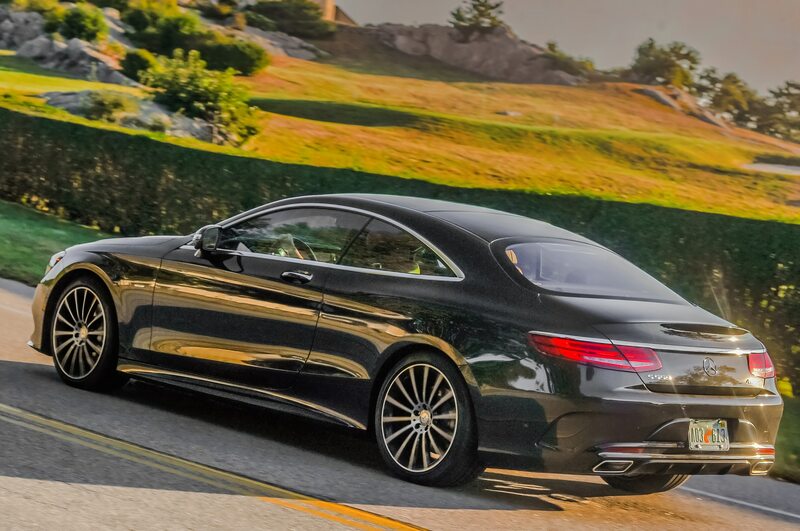 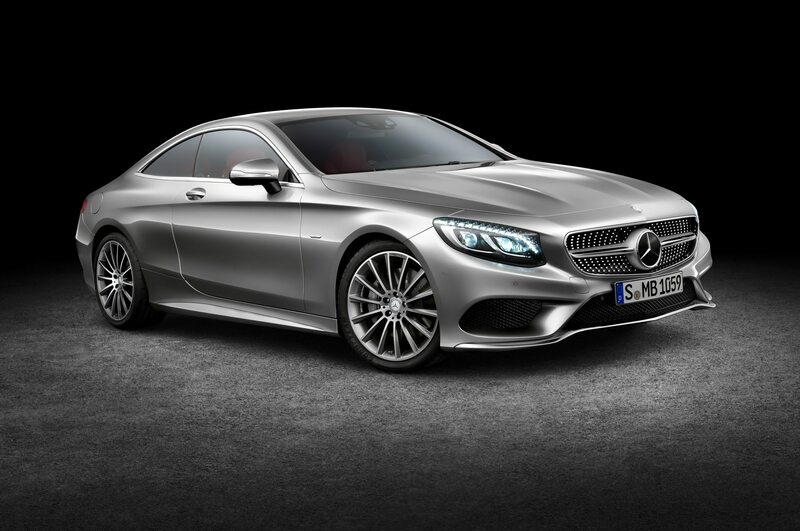 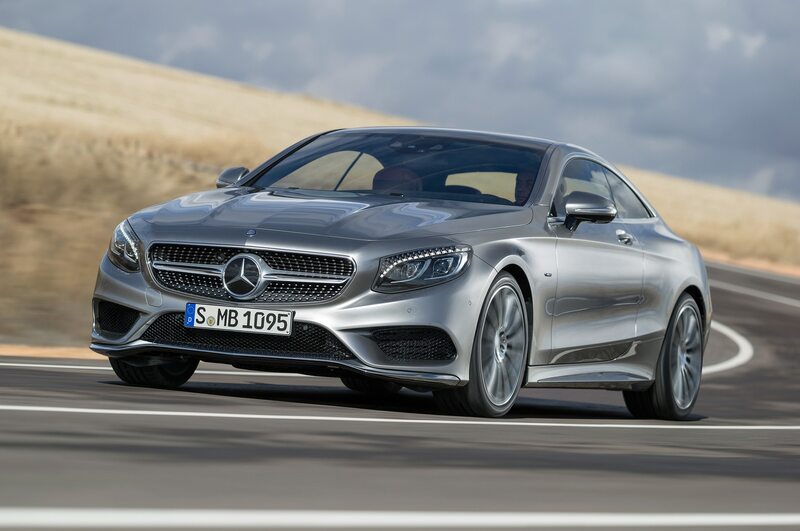 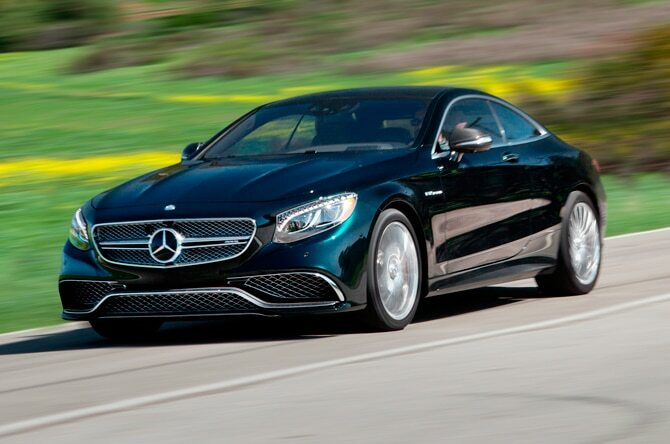 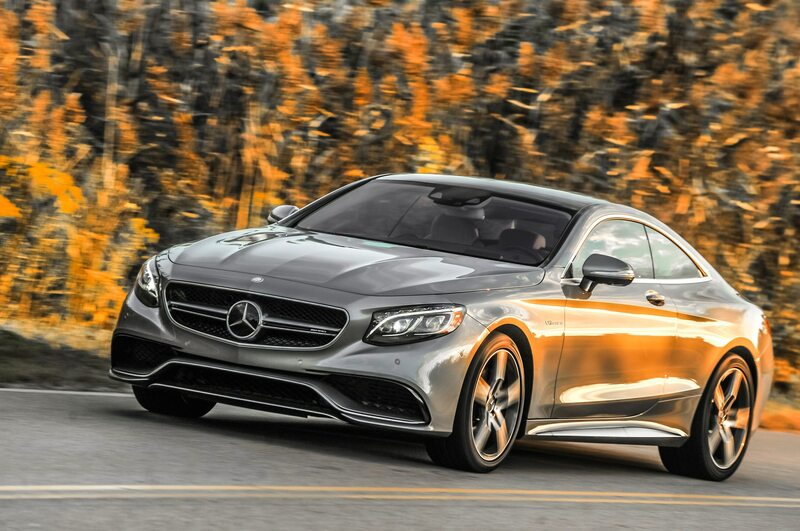 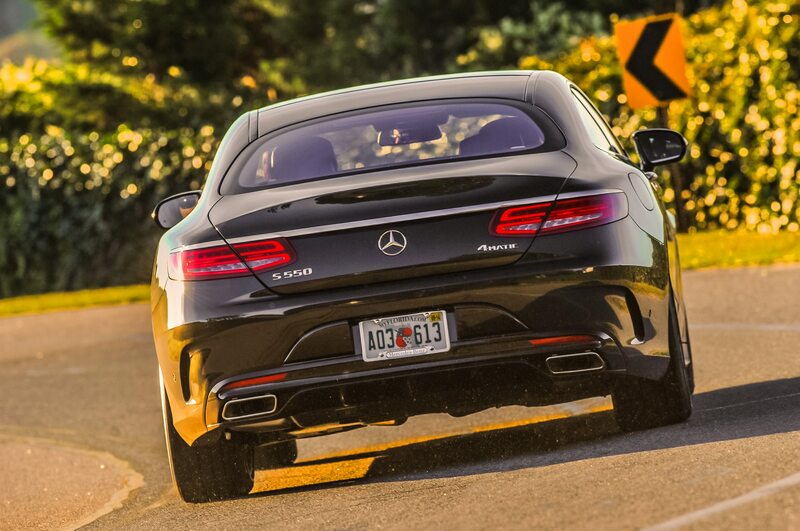 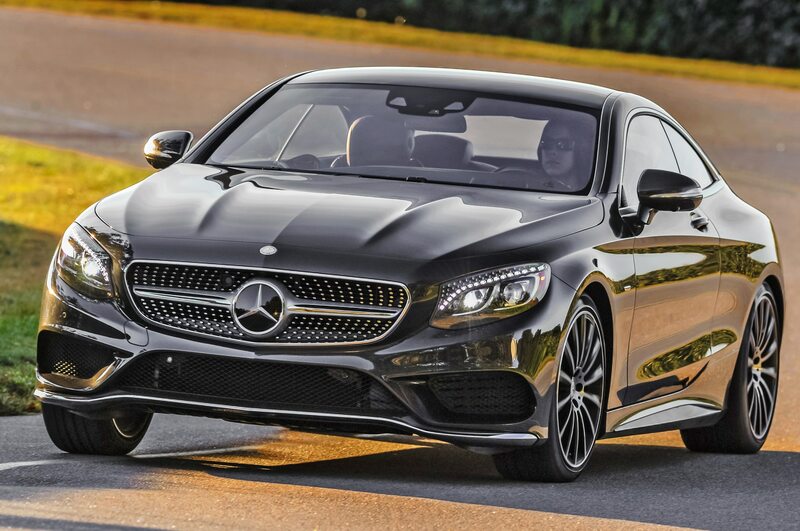 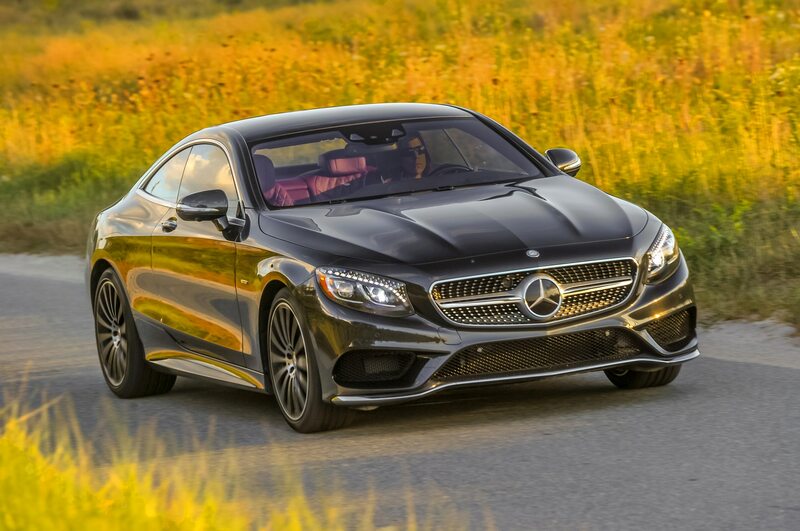 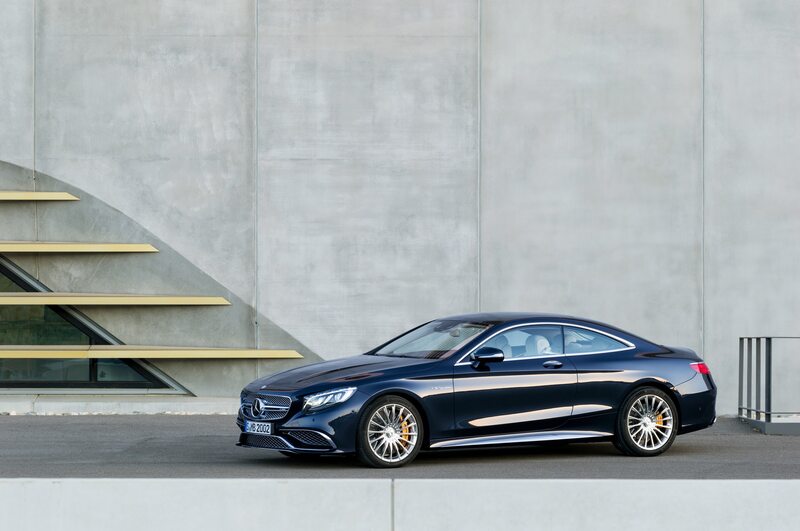 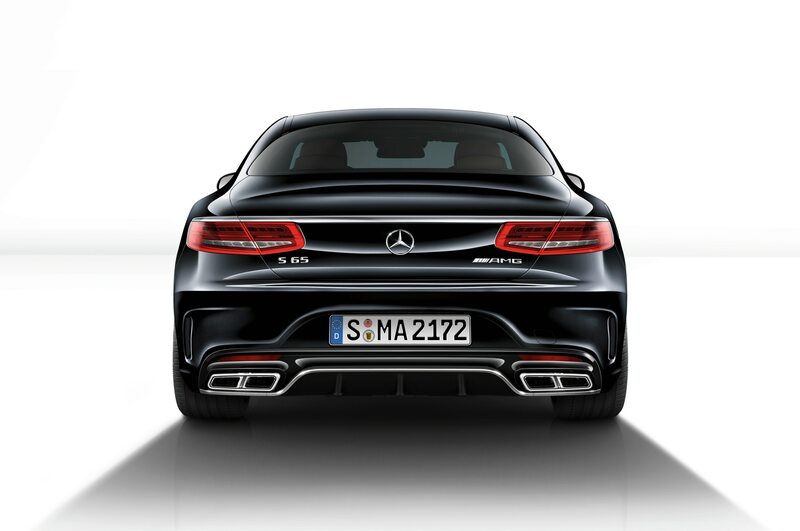 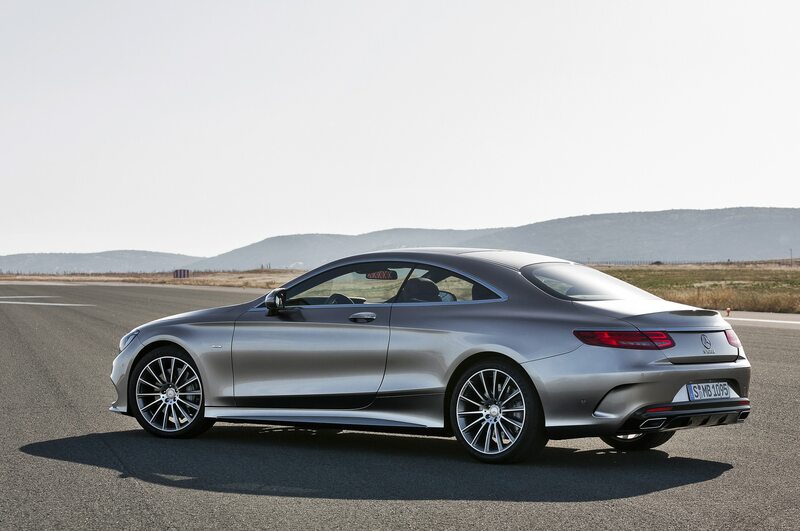 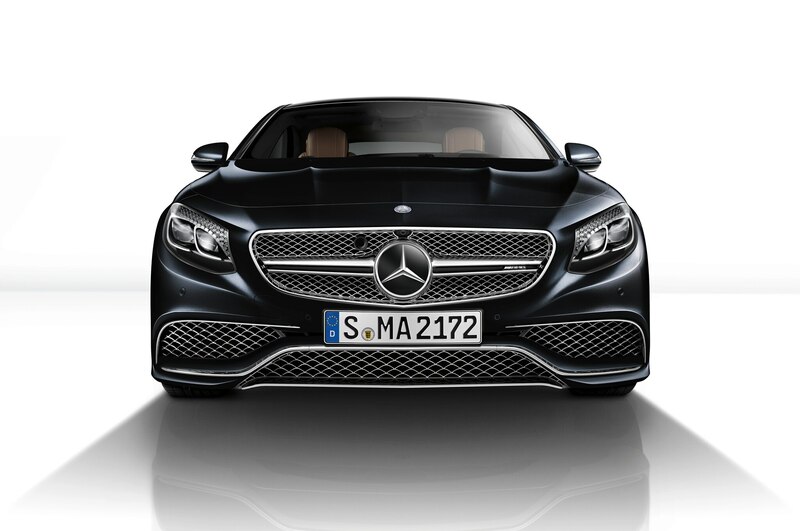 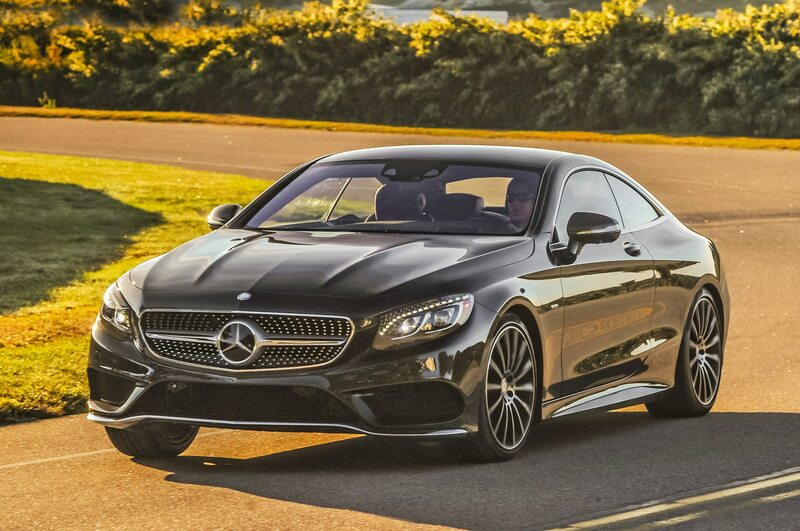 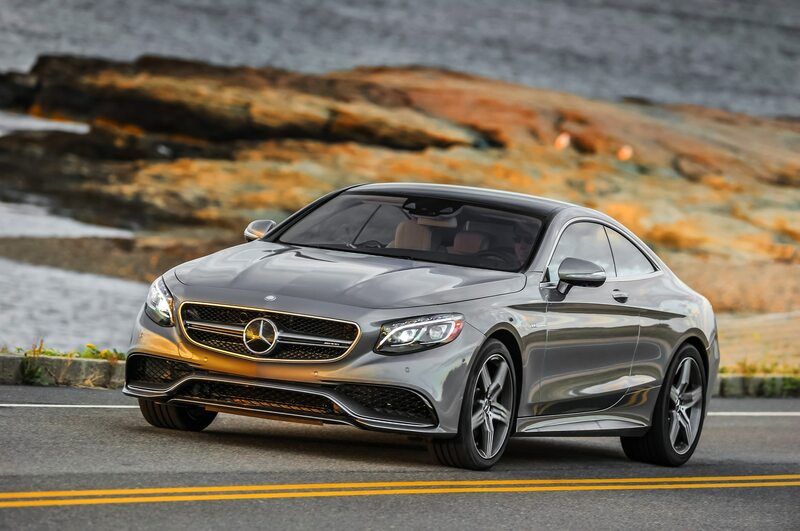 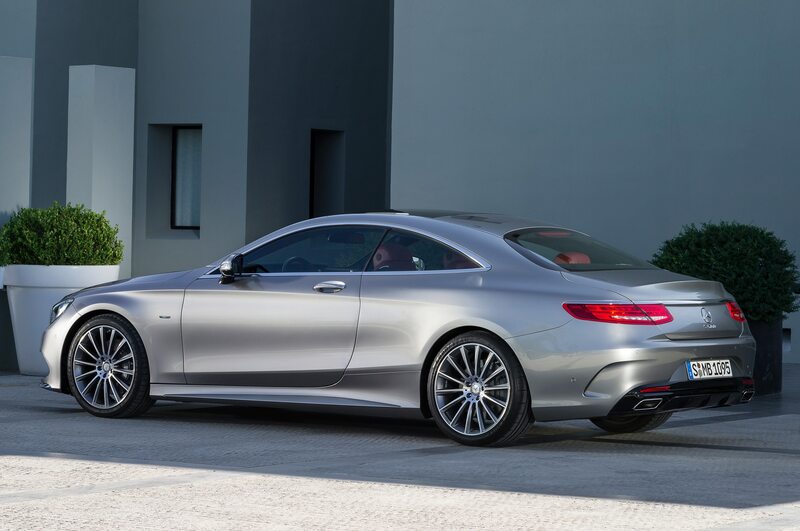 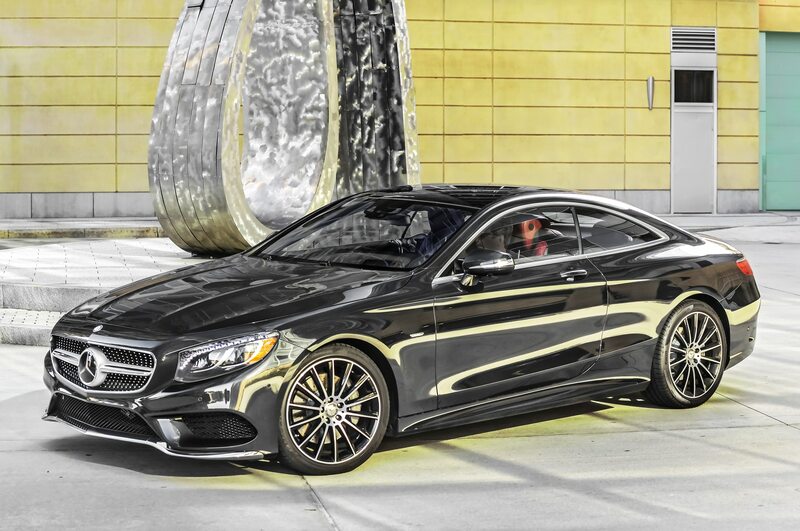 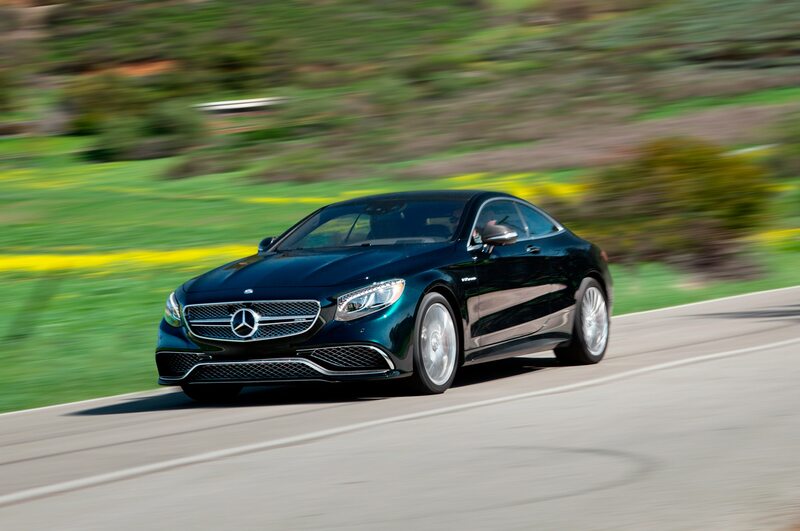 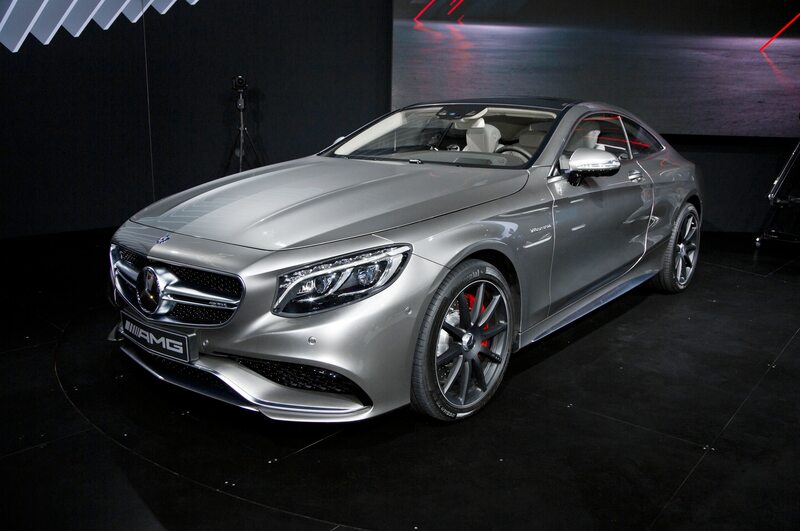 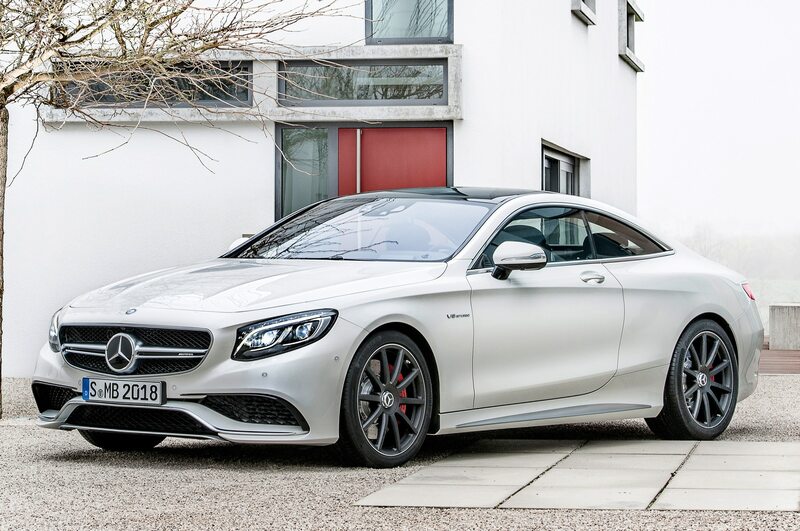 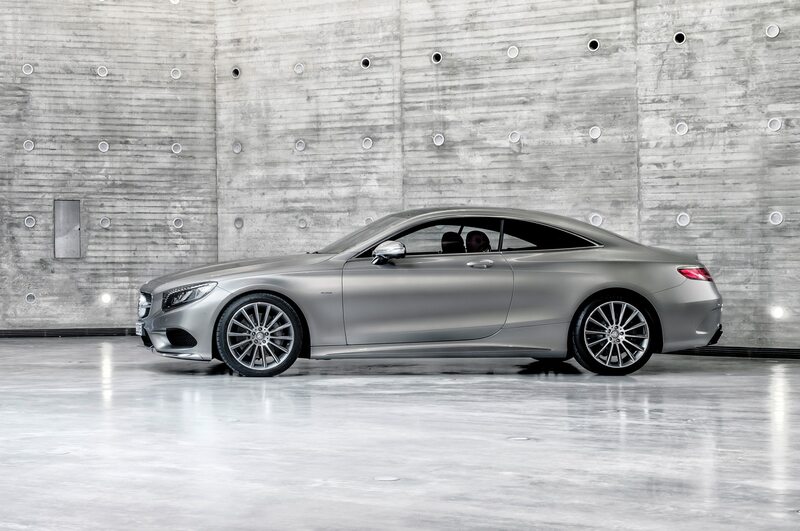 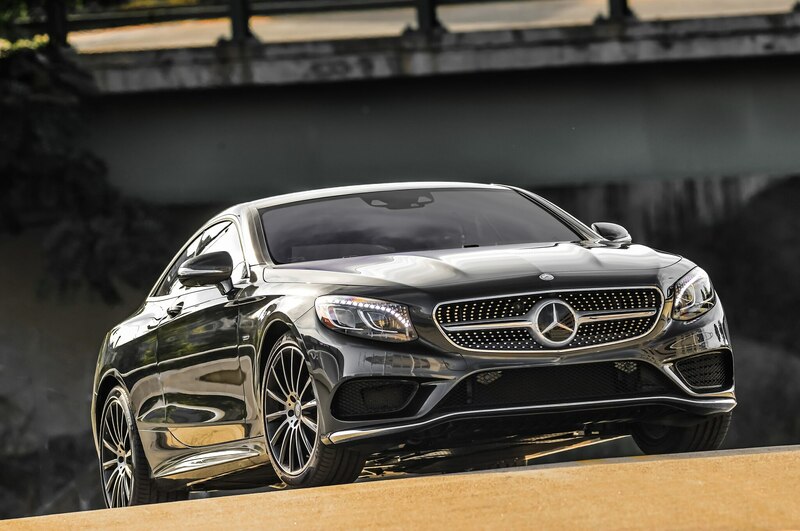 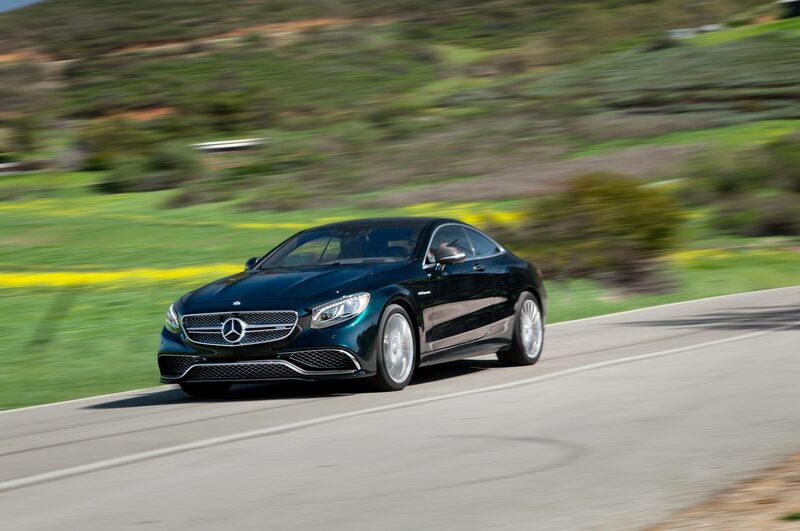 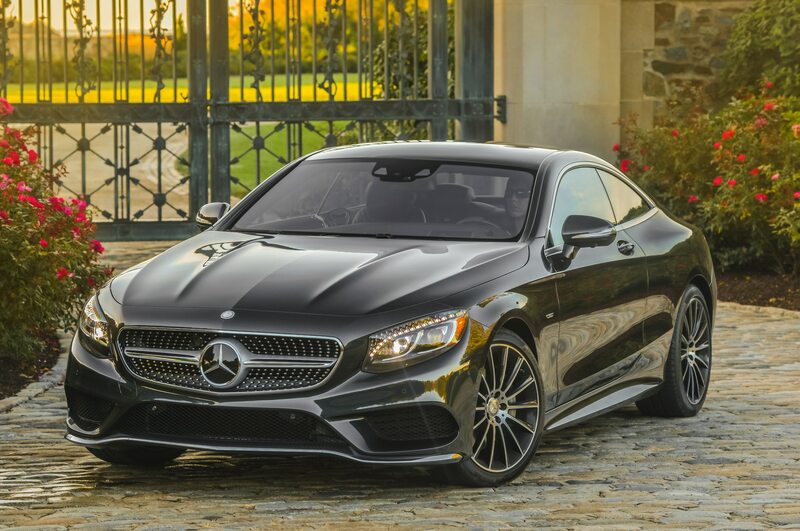 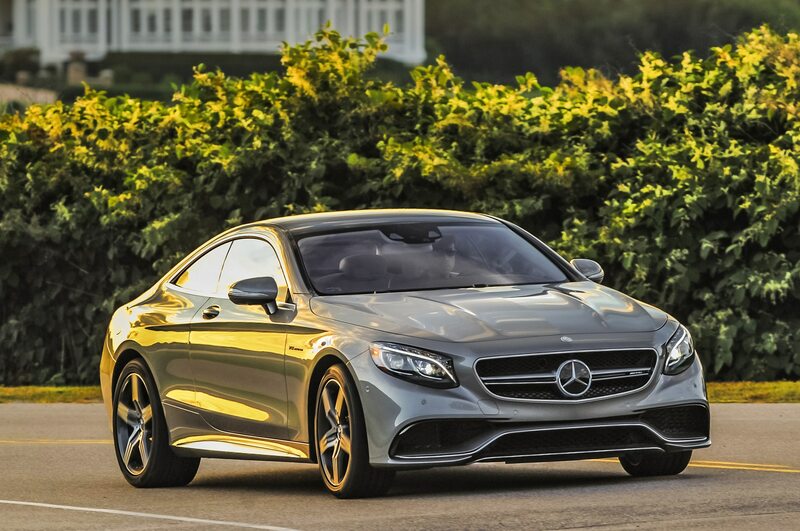 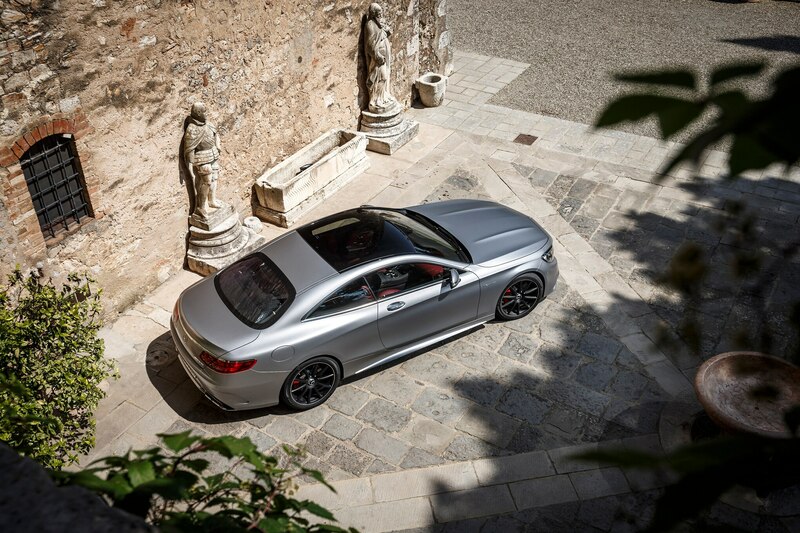 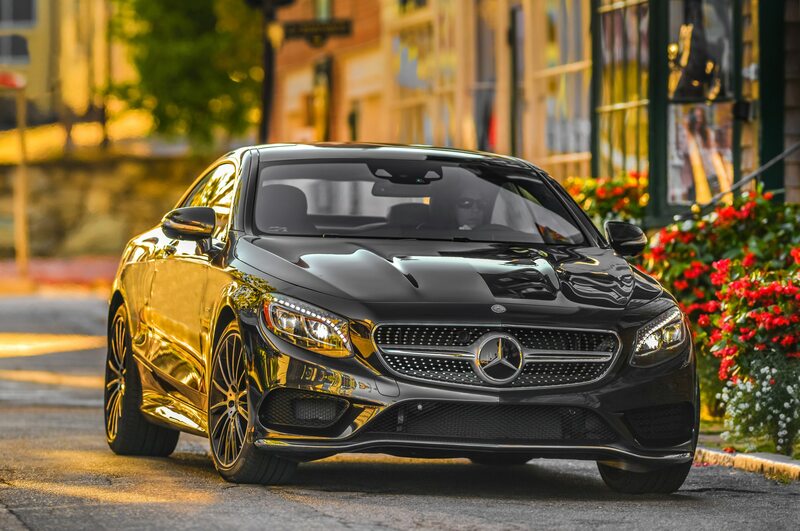 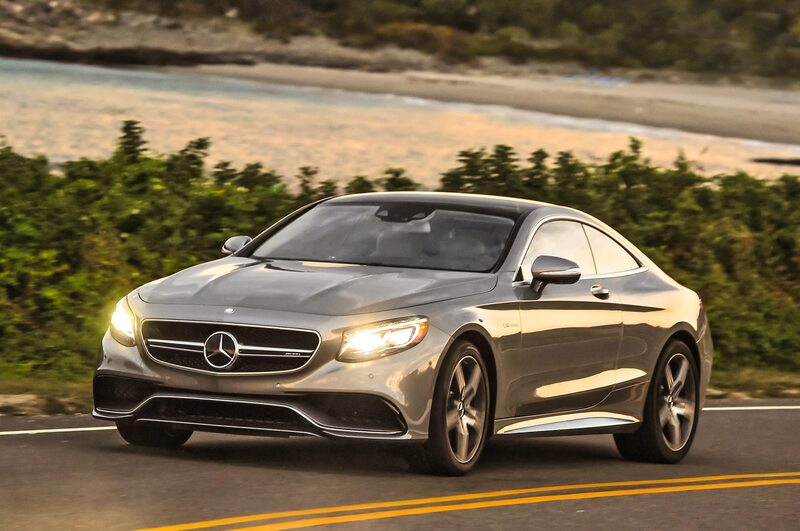 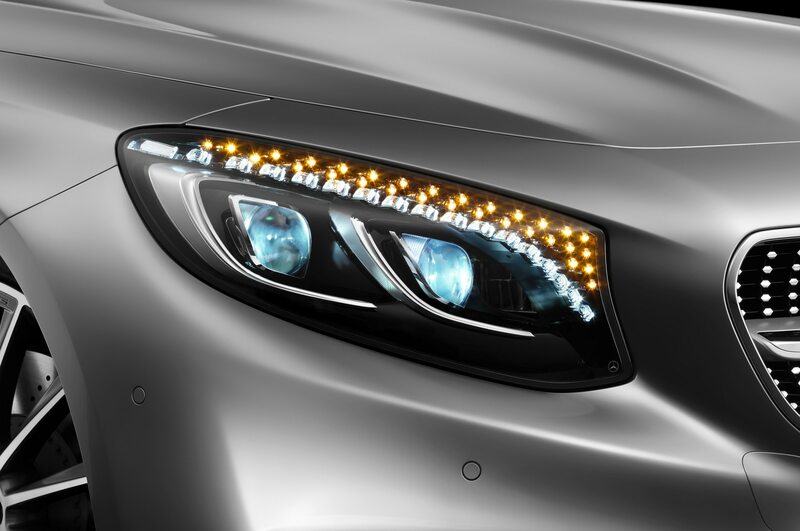 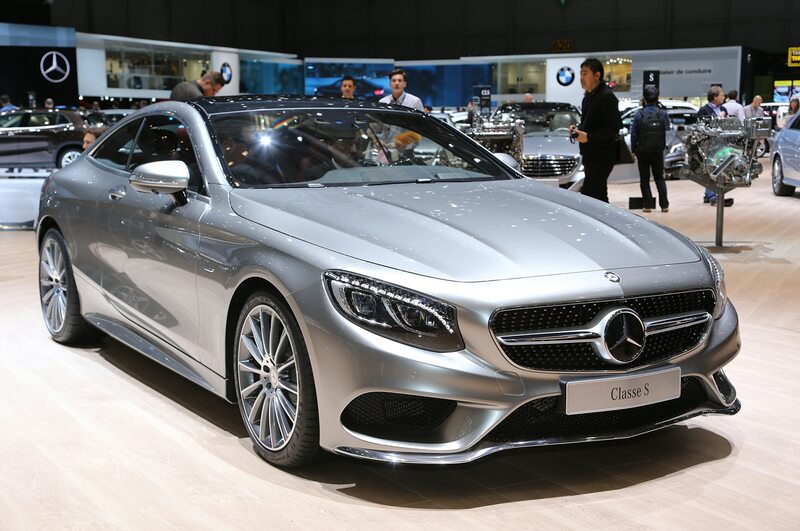 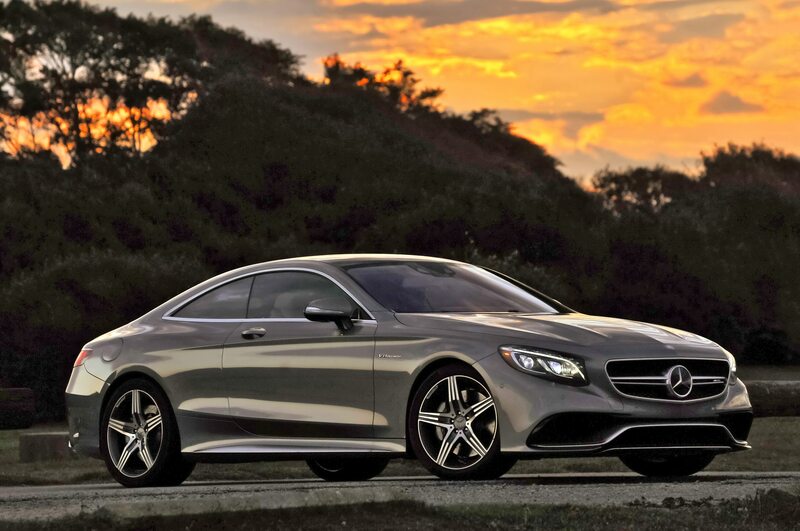 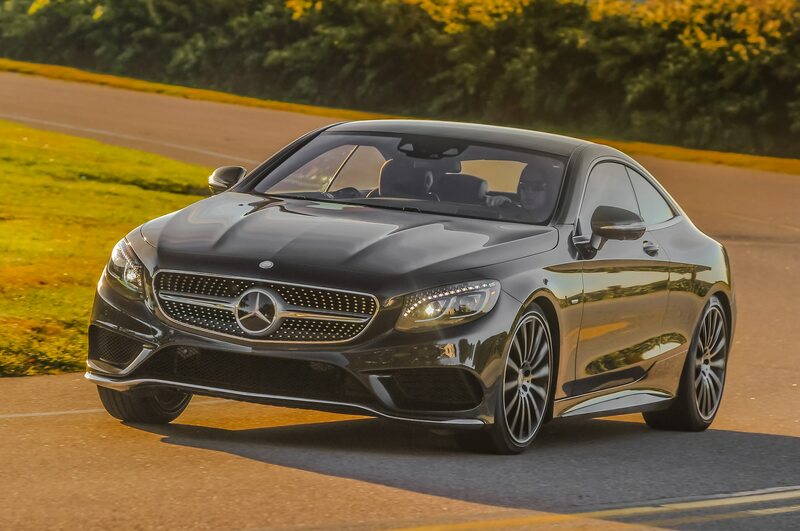 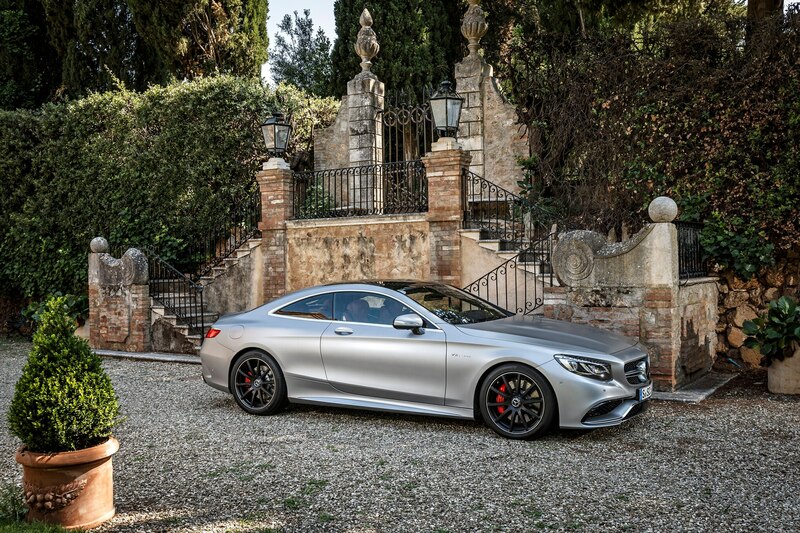 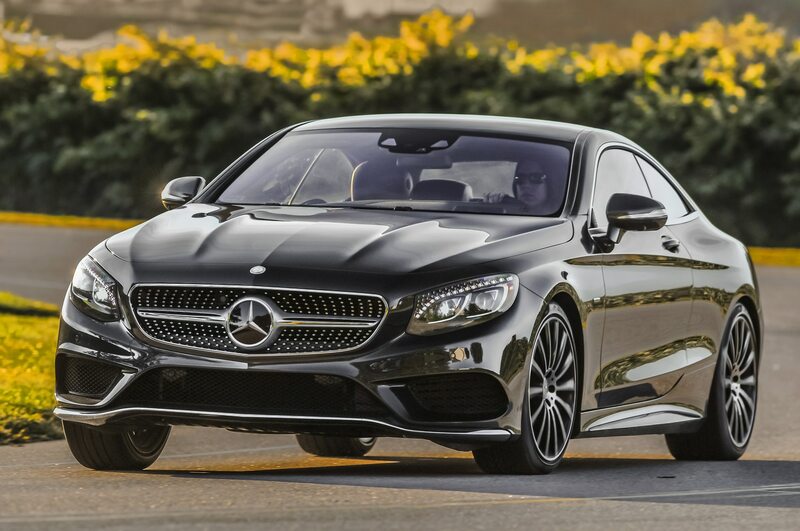 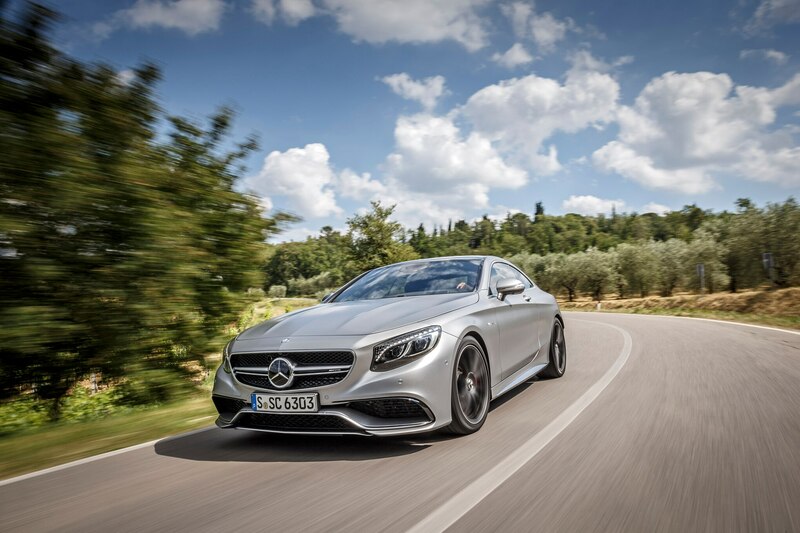 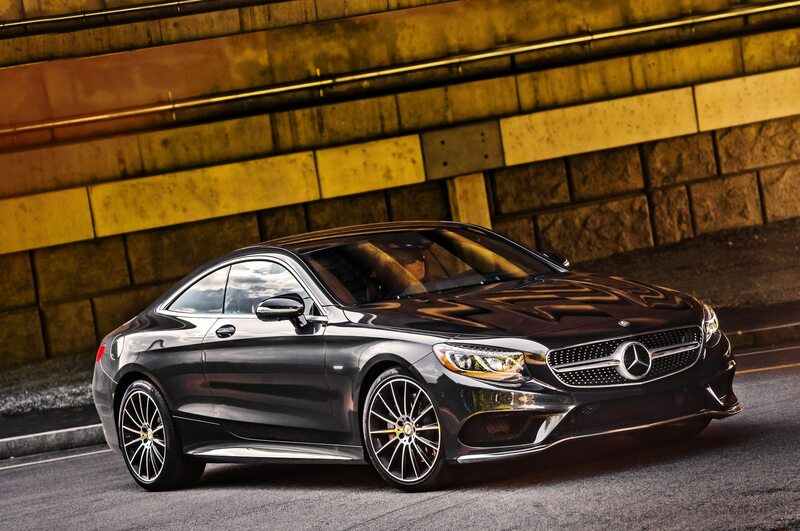 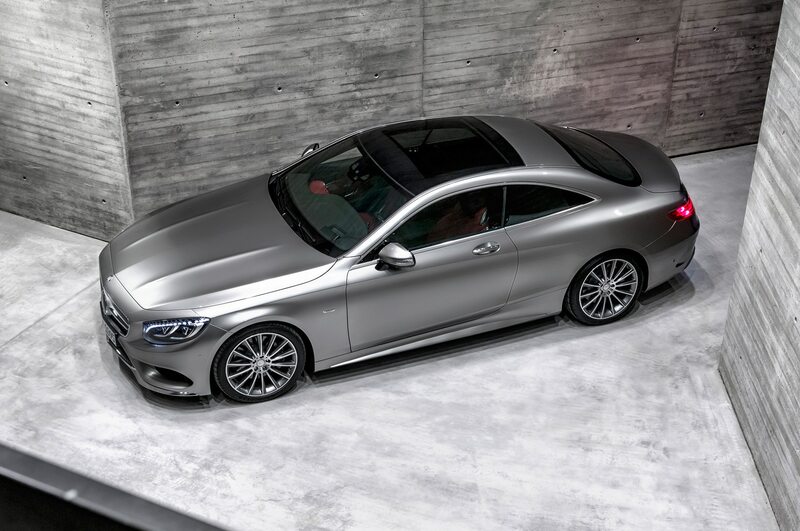 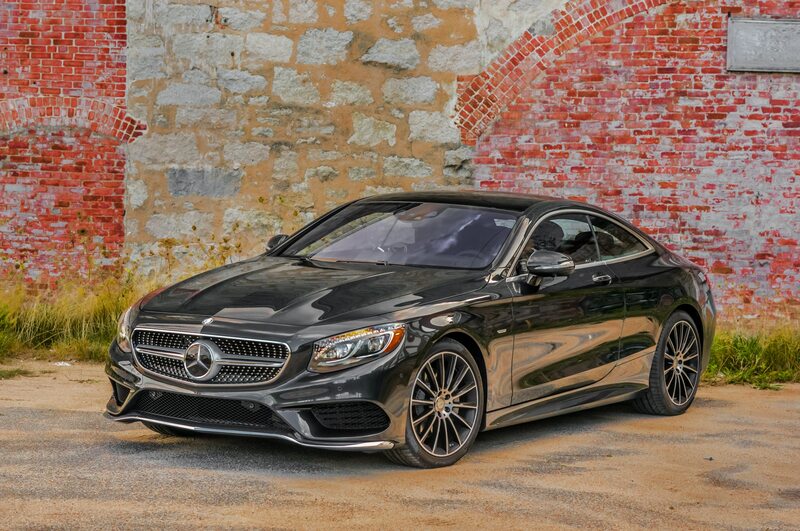 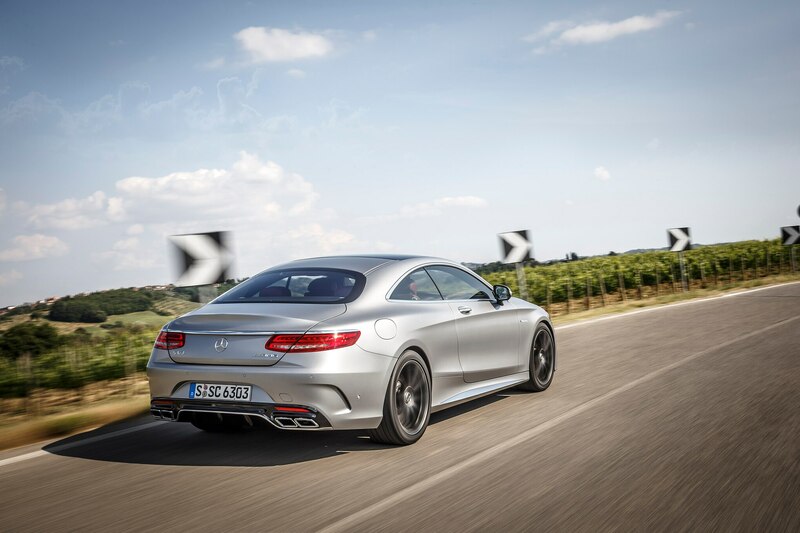 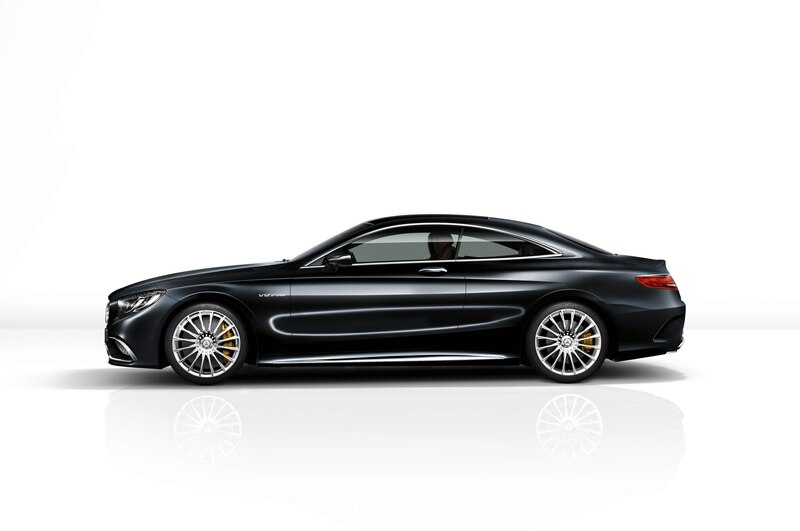 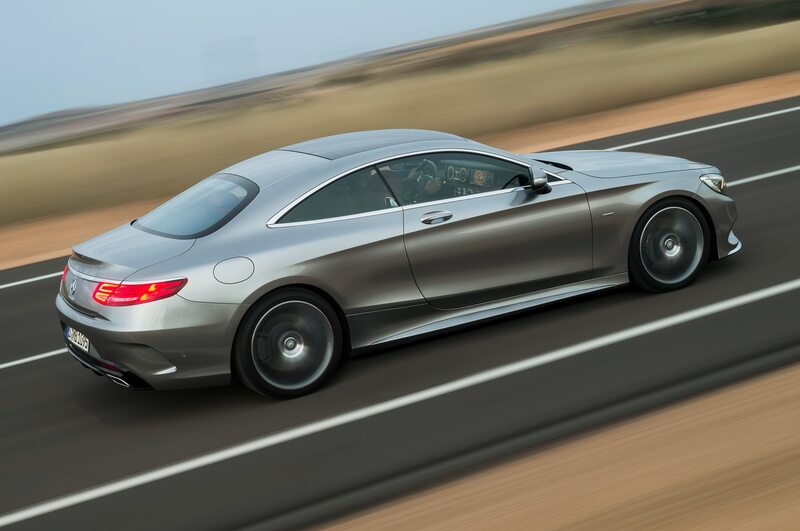 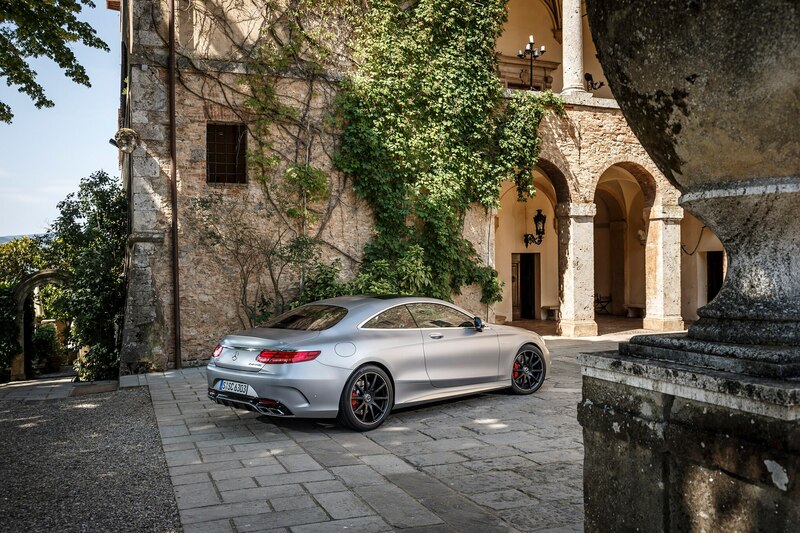 Of course, for those who believe more isn’t enough unless it’s the most, there is the 2015 S65 AMG coupe. 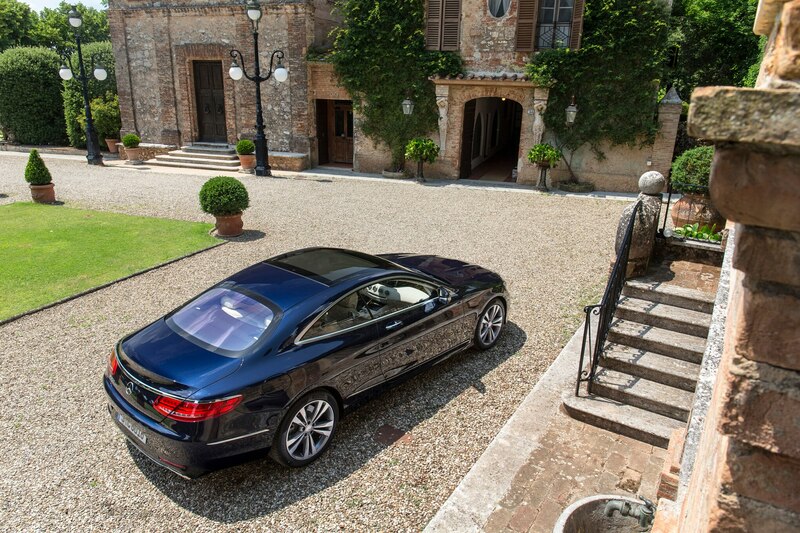 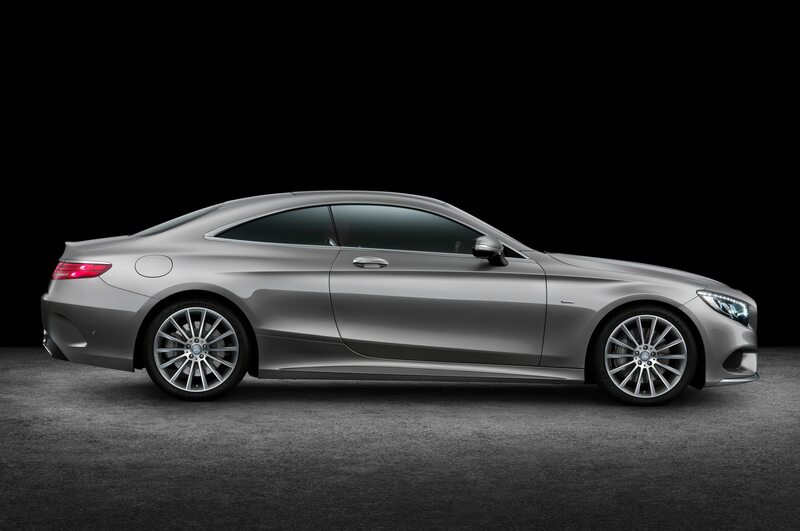 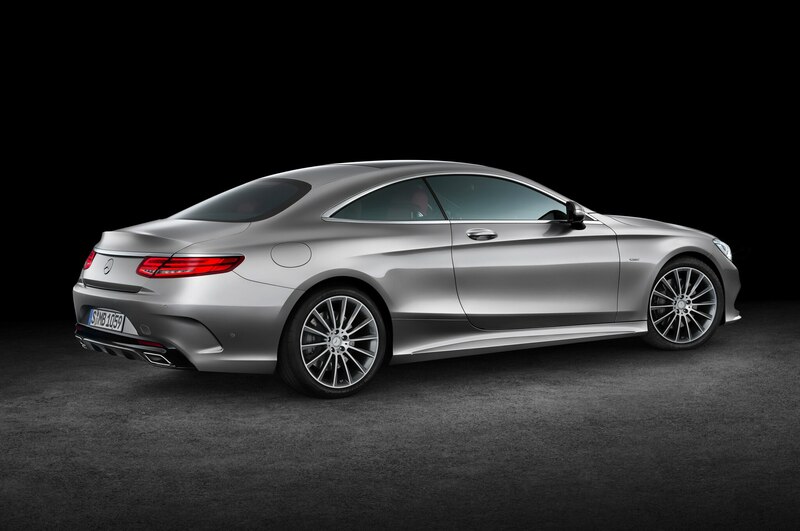 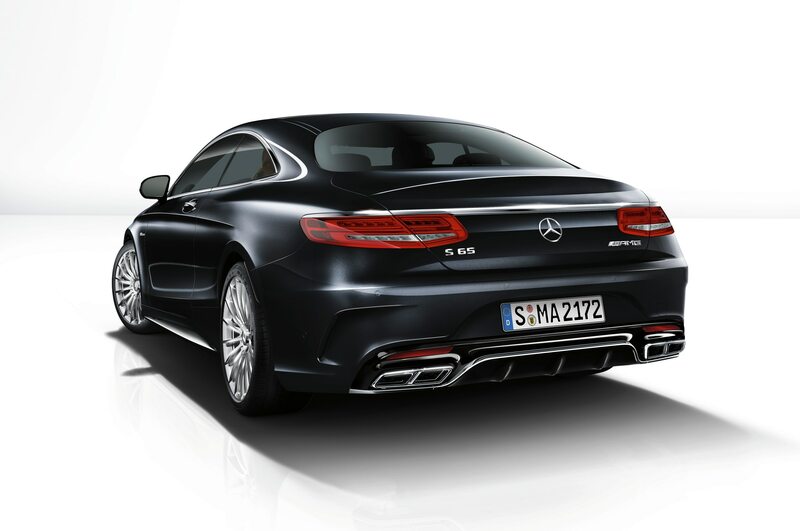 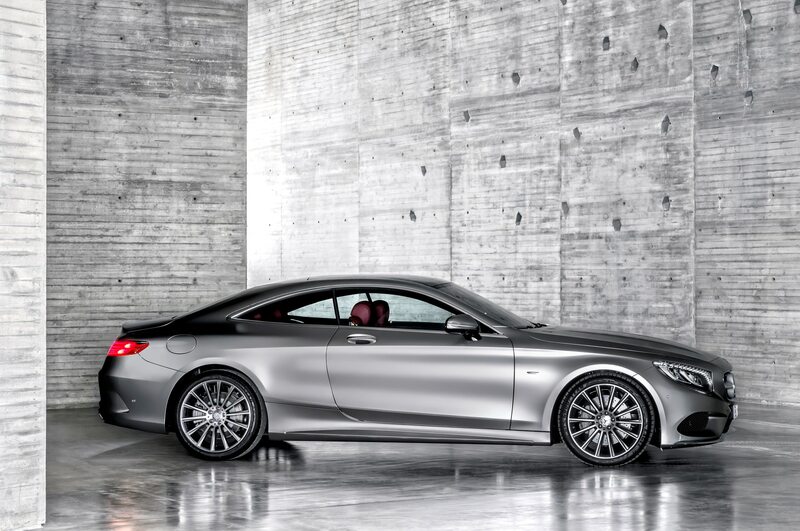 This version of the S-Class coupe (which we did not drive) goes on sale in December with a 6.0-liter V-12. 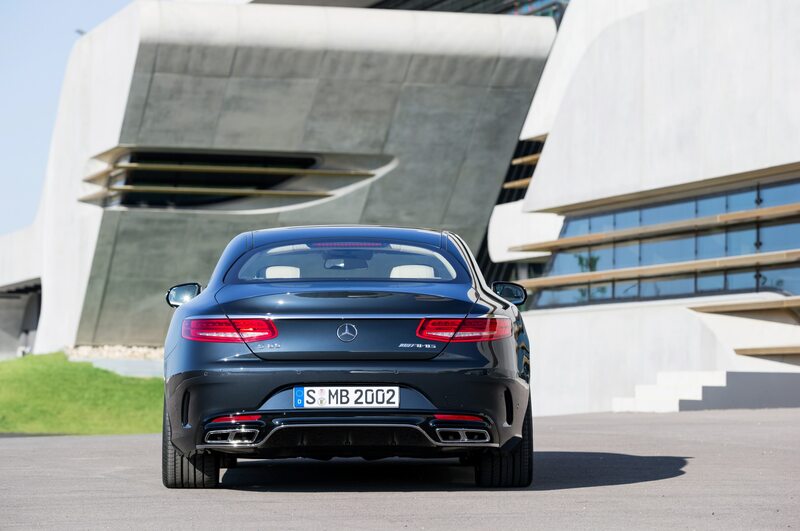 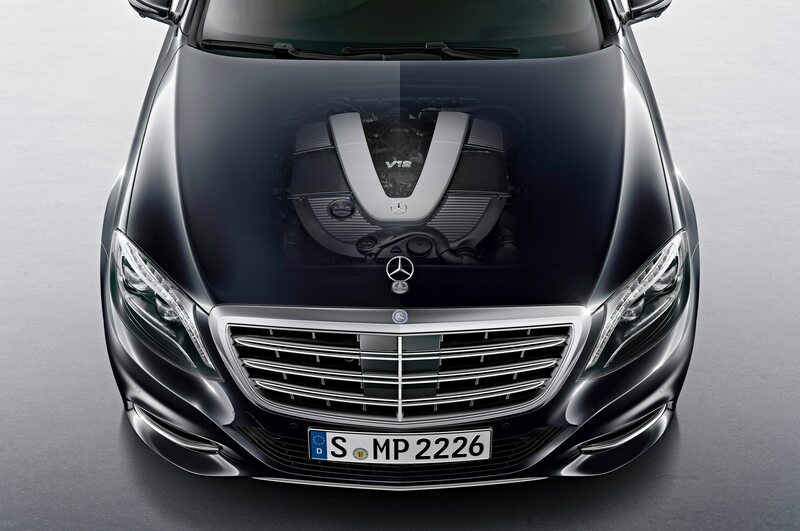 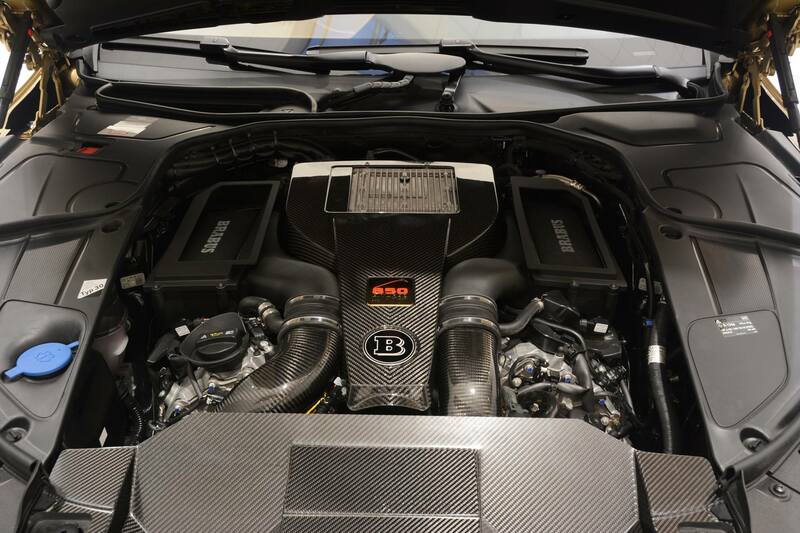 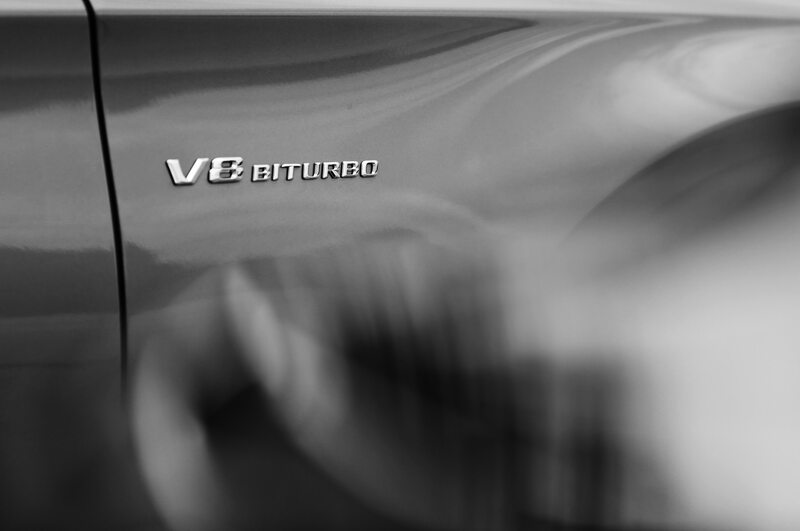 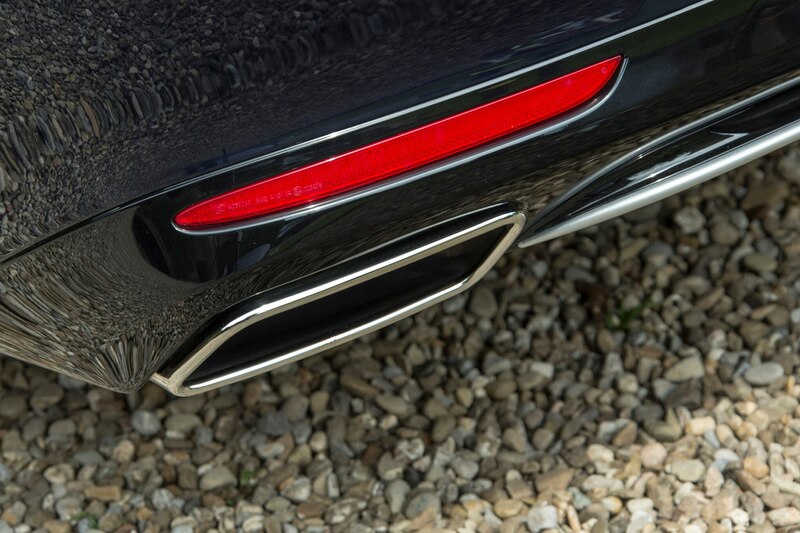 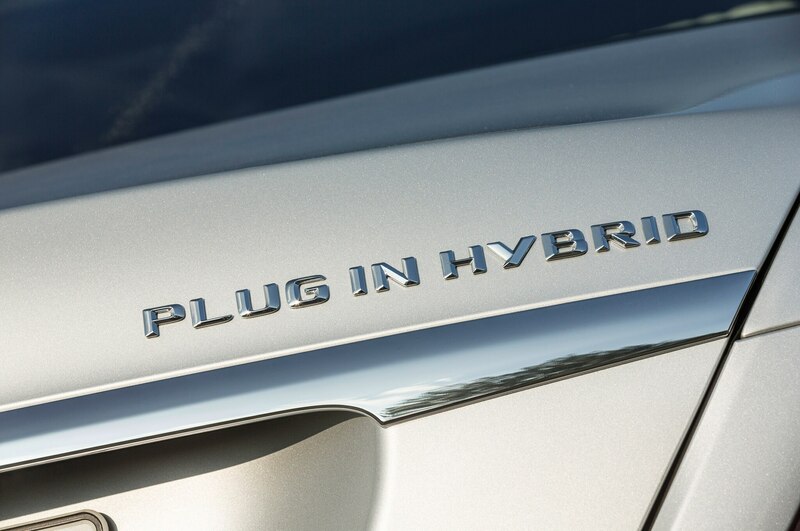 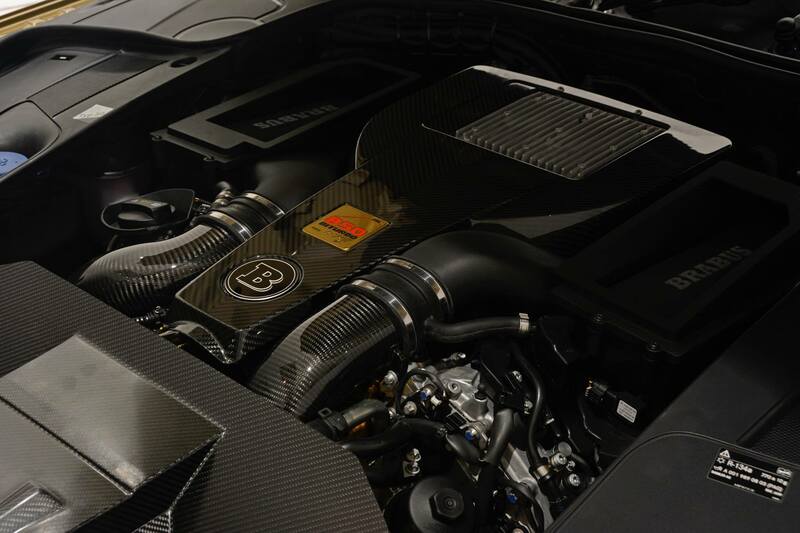 The twin-turbo engine pumps out a whopping 621 hp and 738 lb-ft of torque. 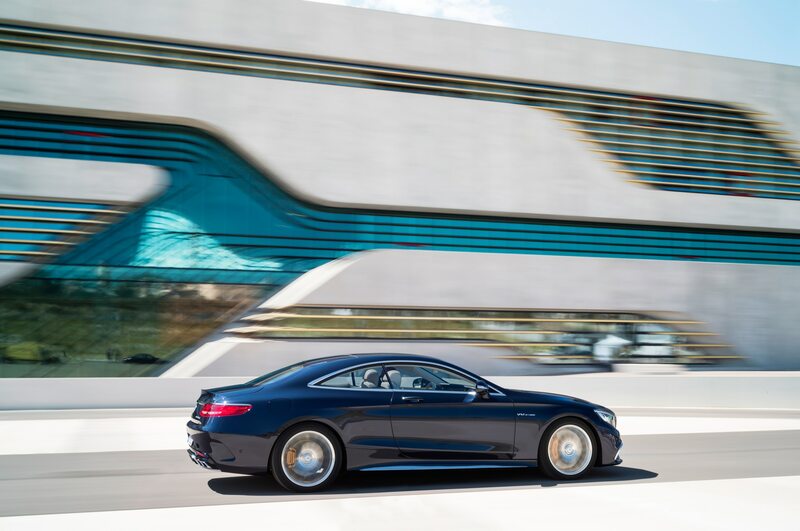 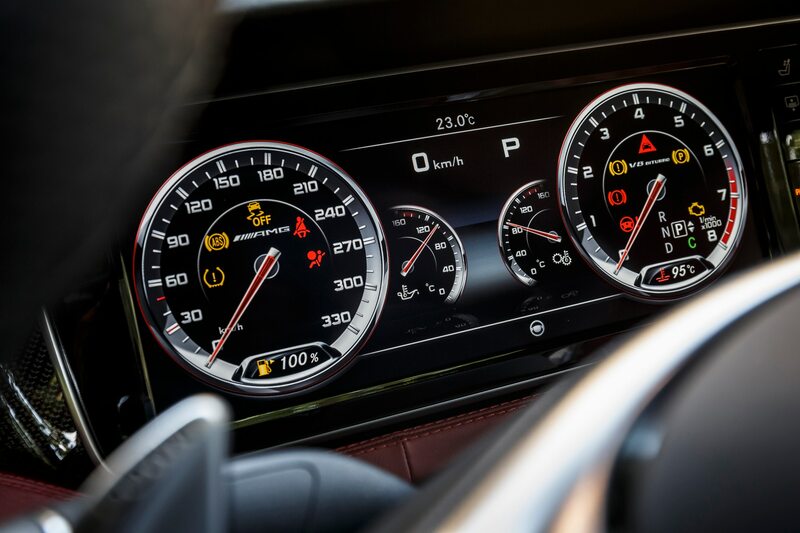 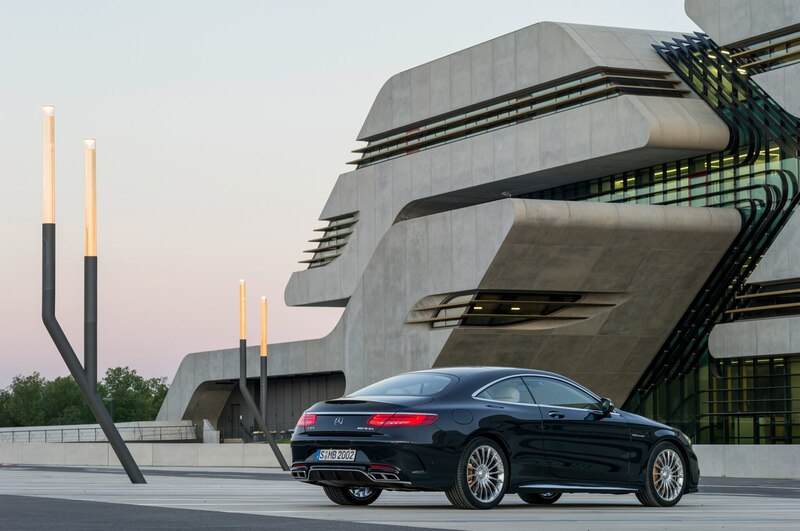 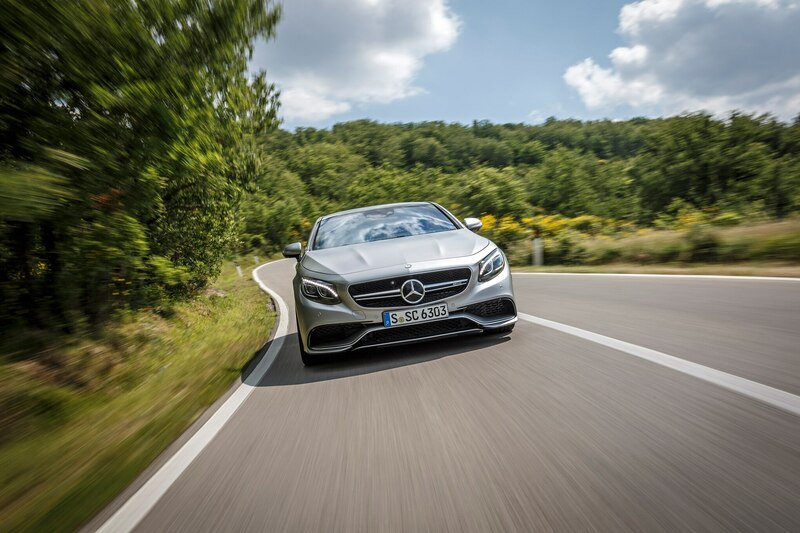 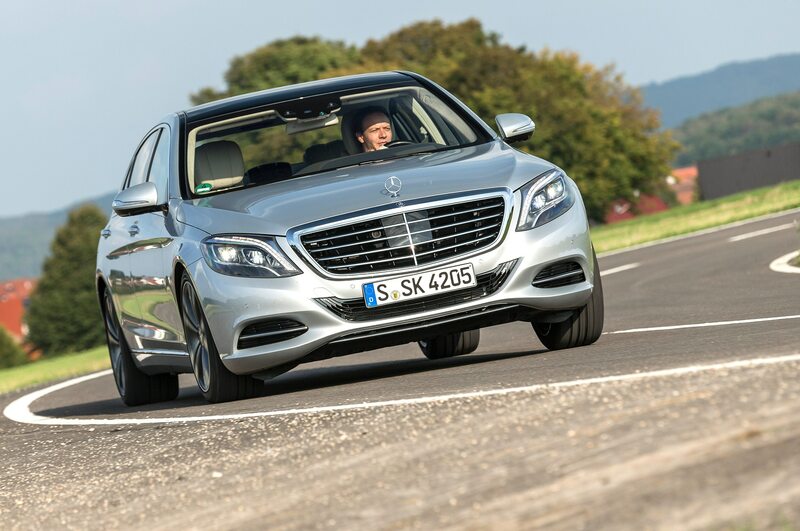 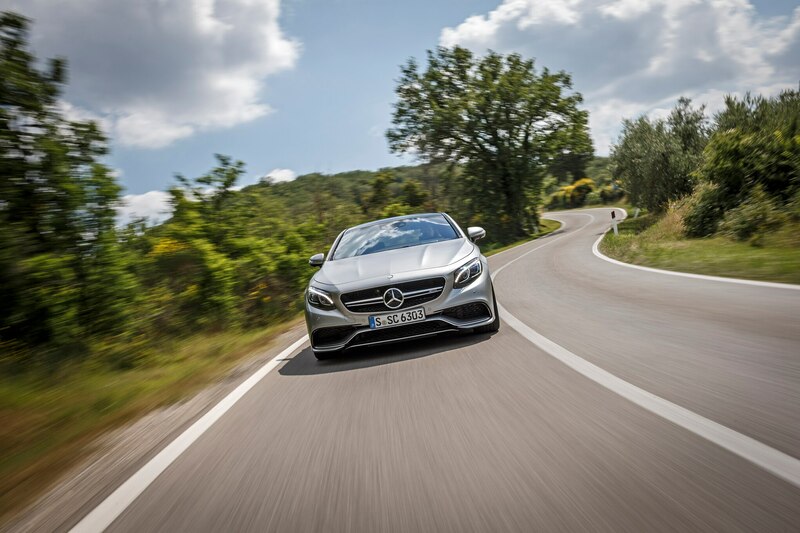 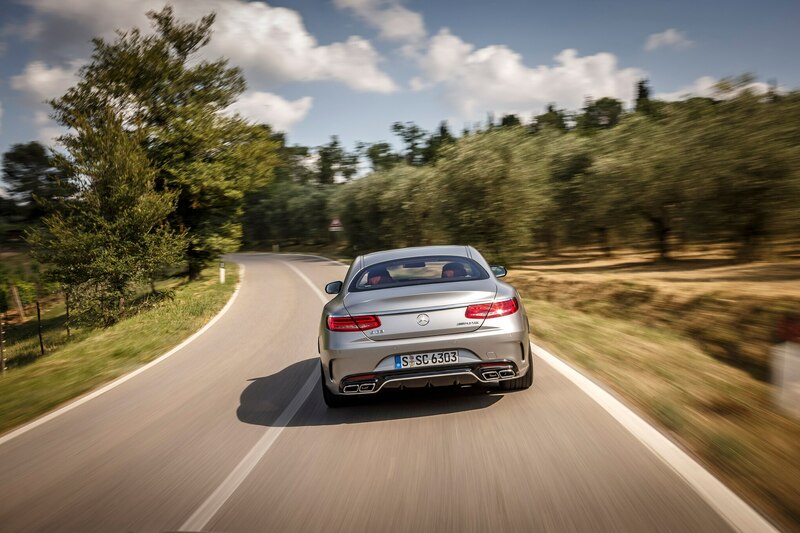 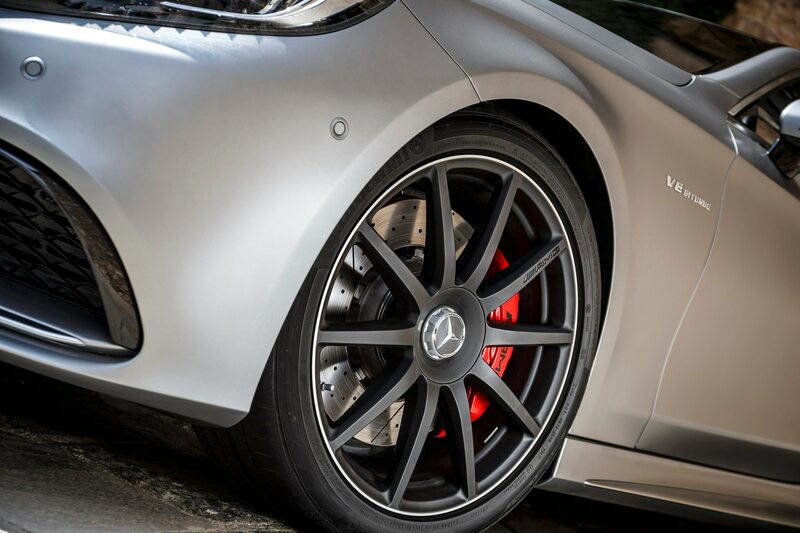 The car is fractionally slower to 60 mph than the S63 AMG, however, and it registers a time of 4.0 seconds to 60 mph on the way to its top speed of 186 mph. 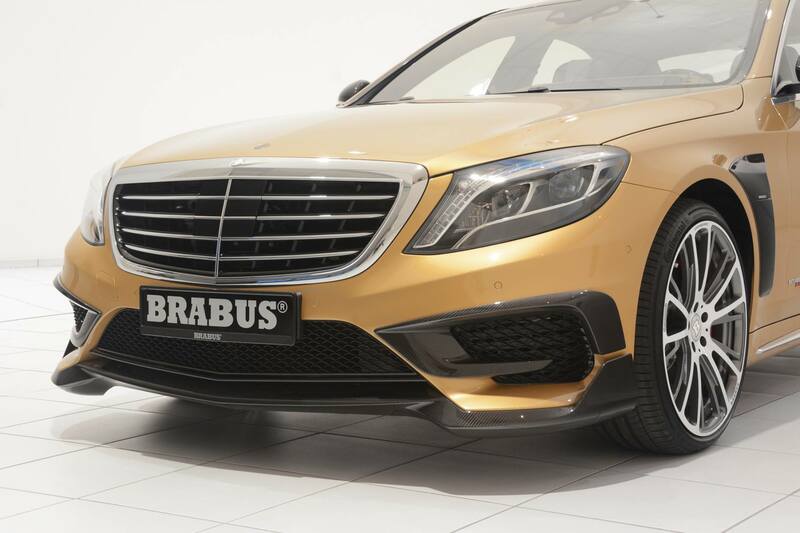 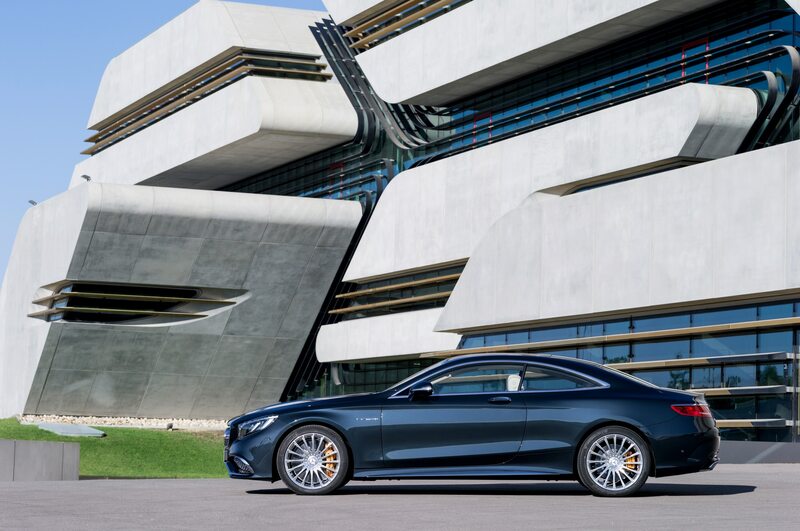 The fractionally slower acceleration of the S65 AMG is due to traction issues, as it does without 4Matic all-wheel drive, which can’t be packaged with the huge V-12 engine. 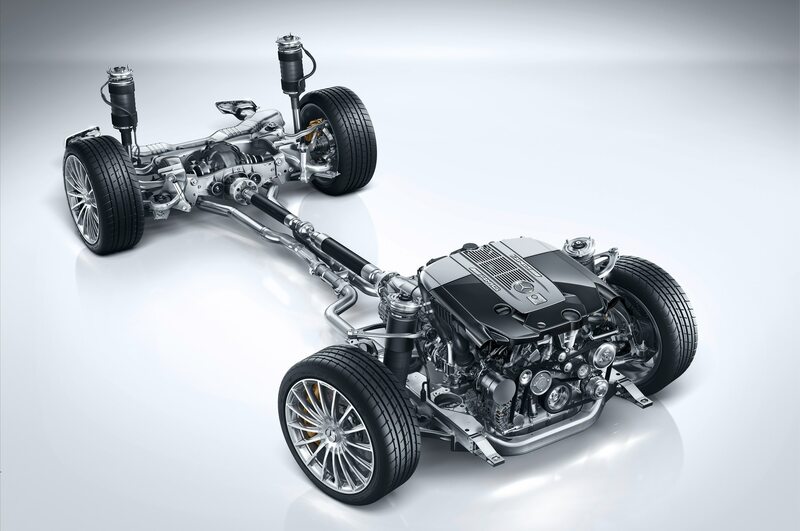 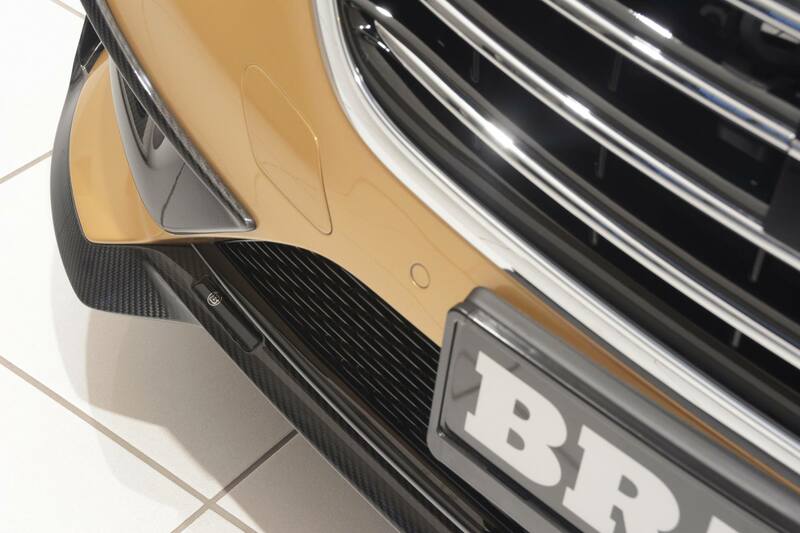 It does, however, offer one additional and unique bit of technical wizardry: an active suspension that helps the car lean into turns even while controlling body roll so closely you don’t notice. 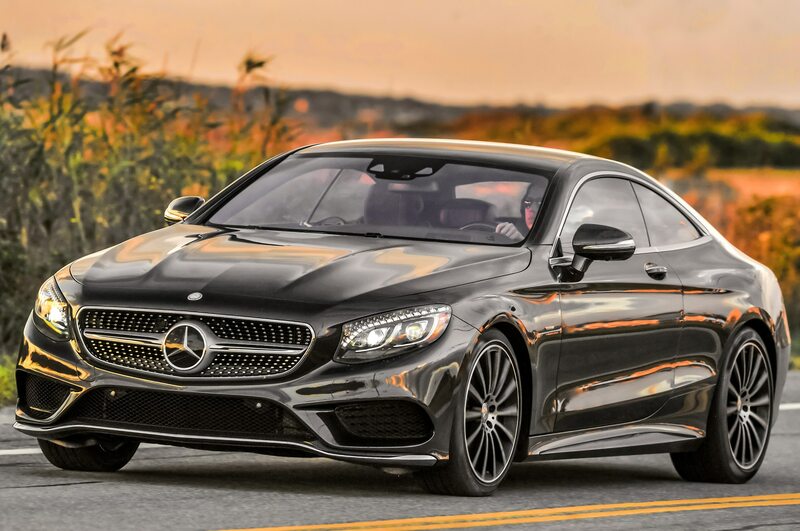 Most important, though, the 2015 Mercedes-Benz S65 AMG coupe comes with the exclusivity guaranteed by its nosebleed price: $231,825. 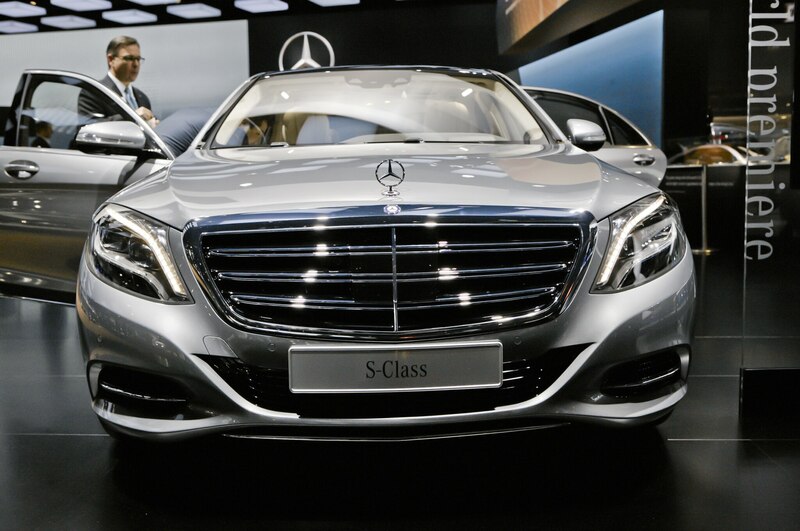 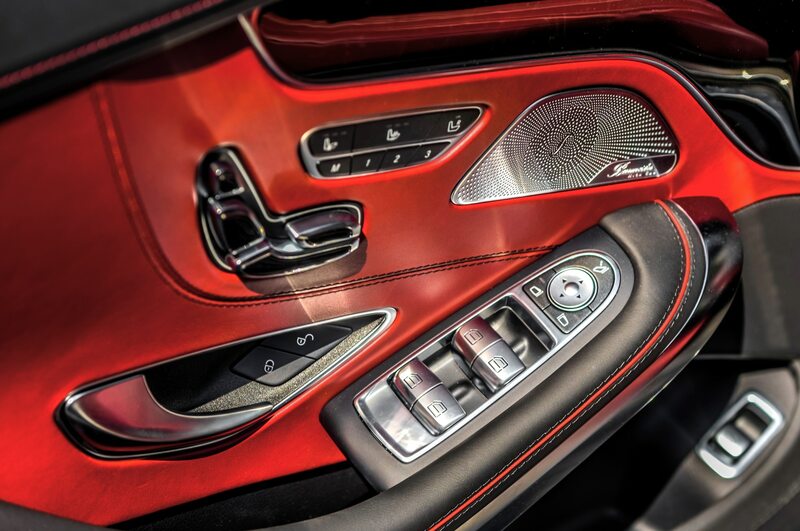 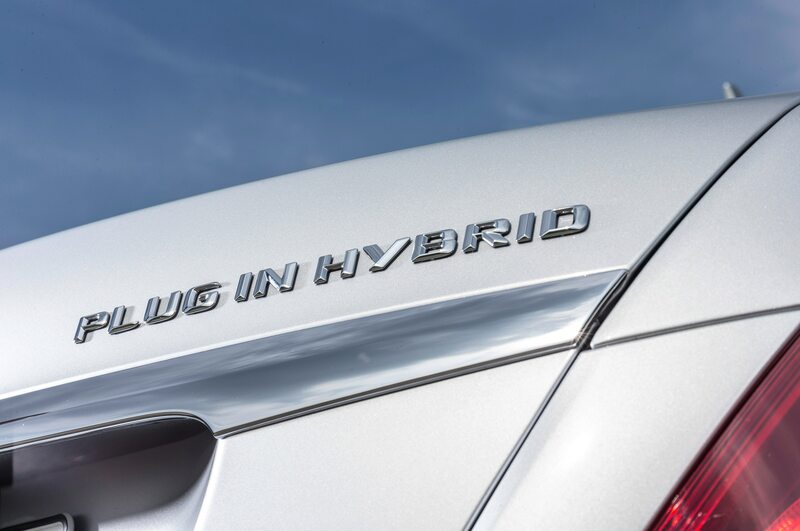 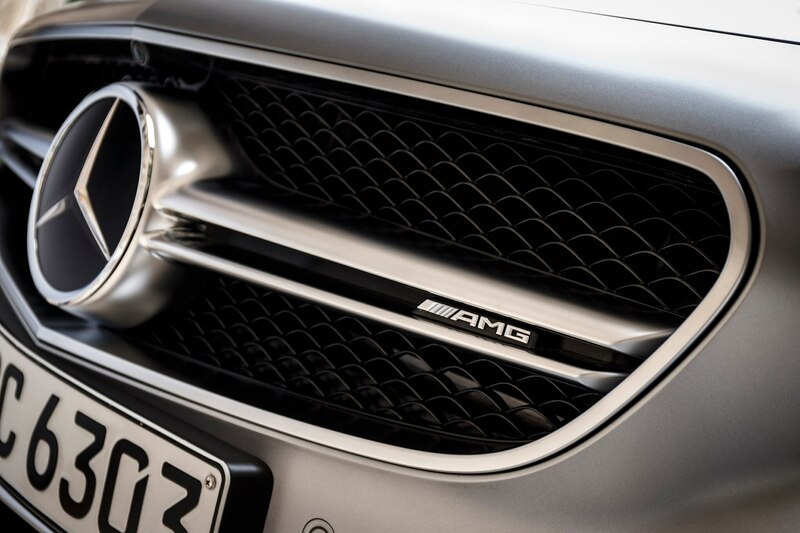 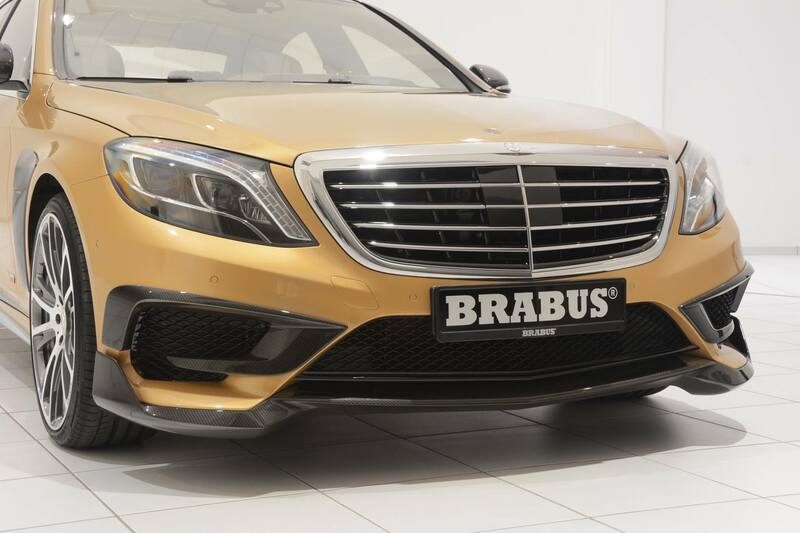 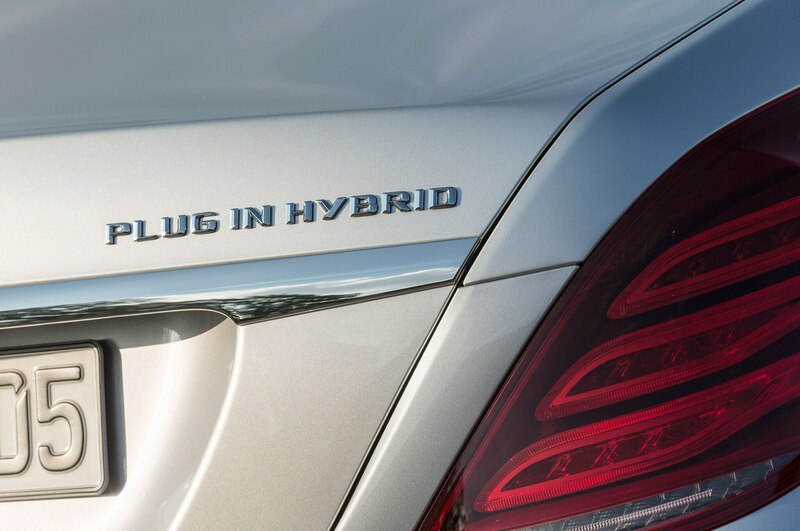 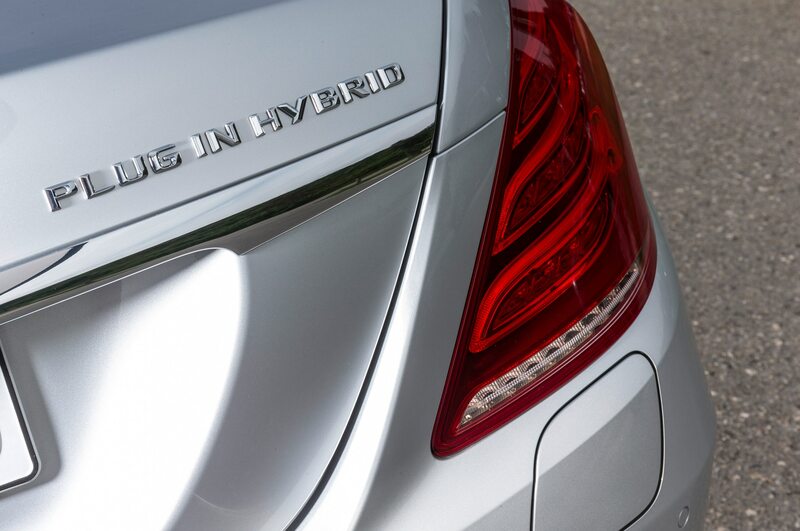 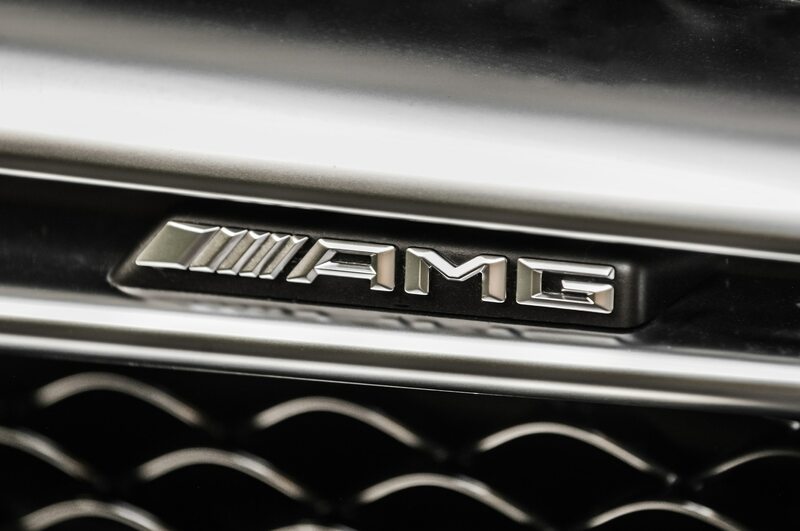 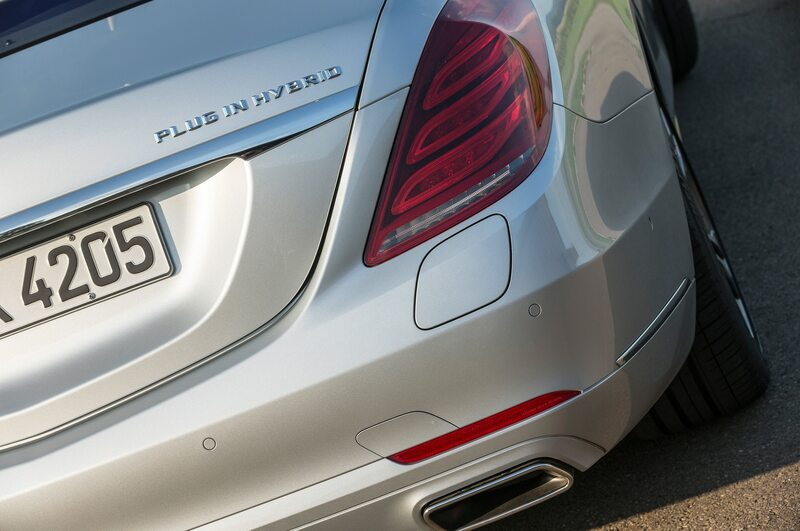 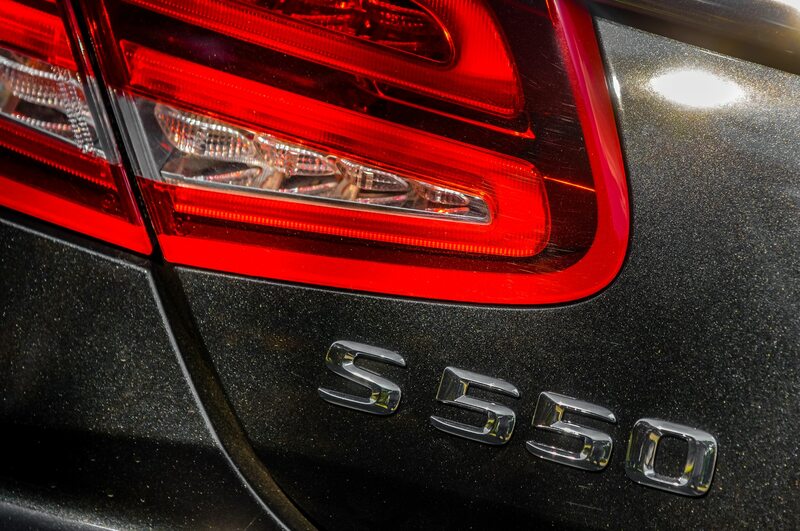 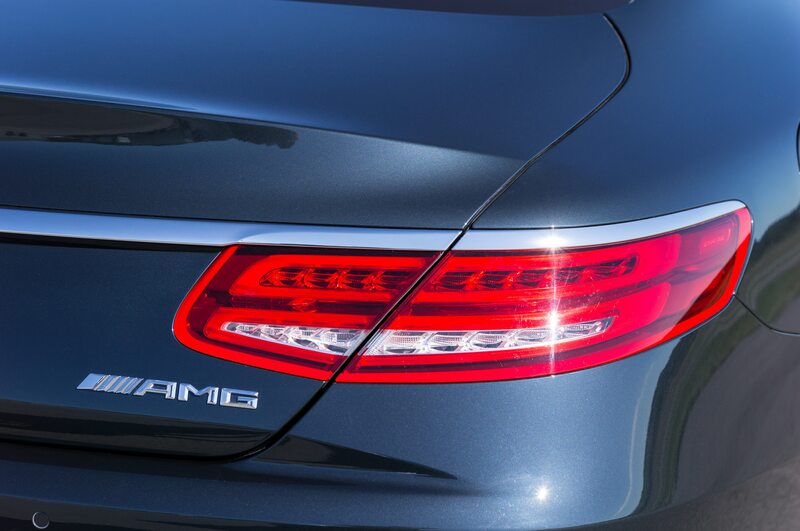 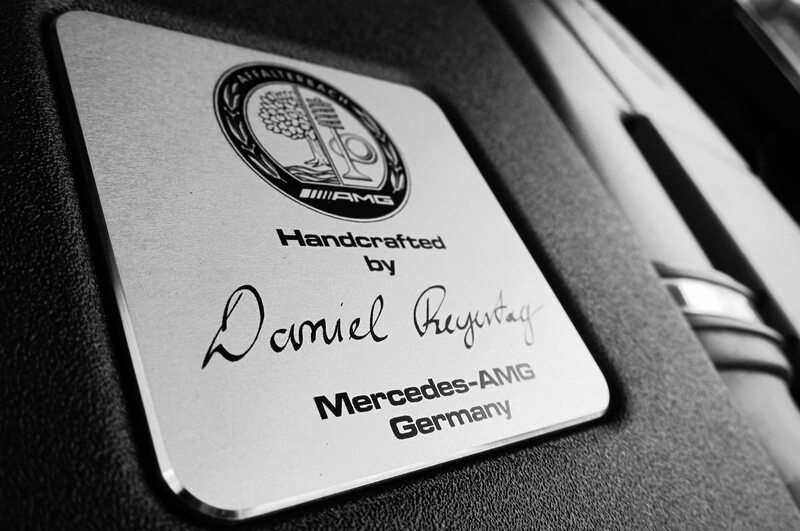 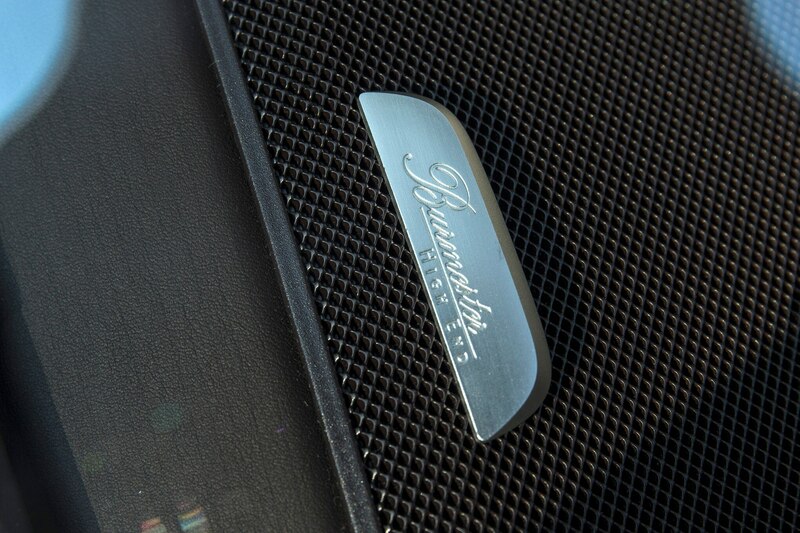 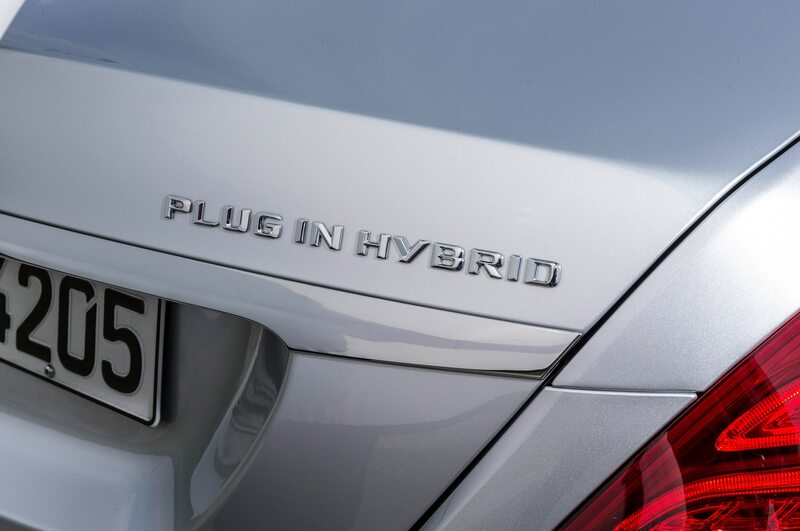 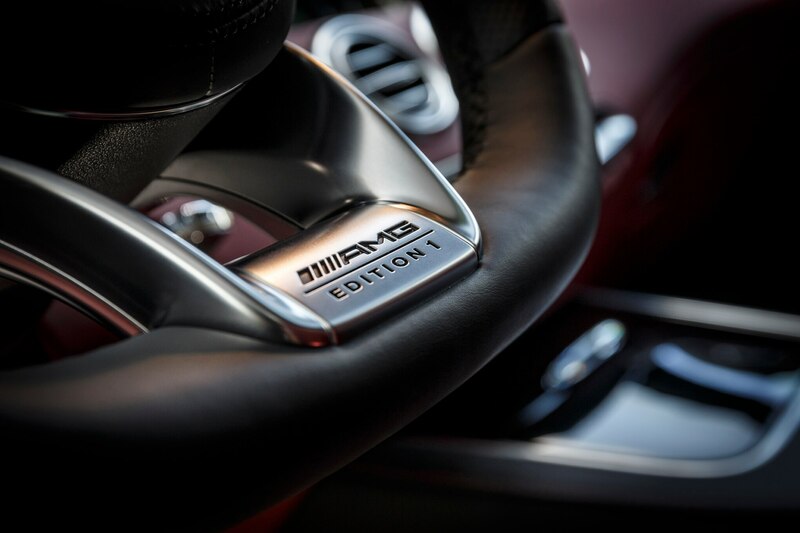 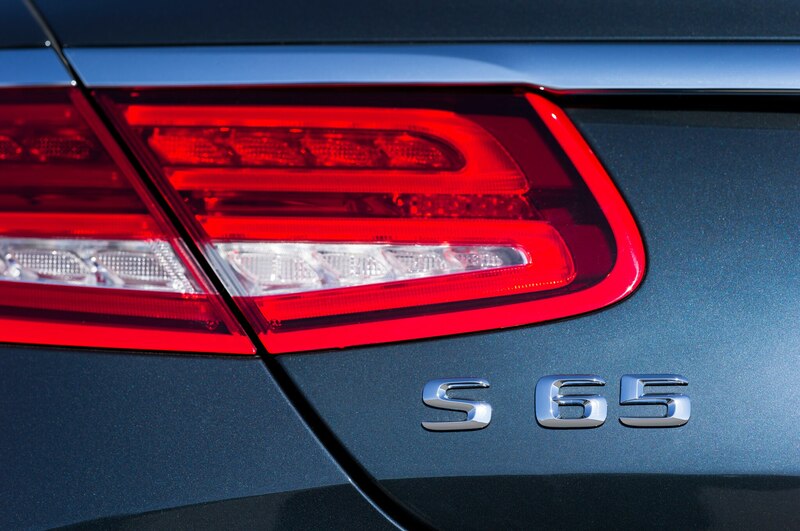 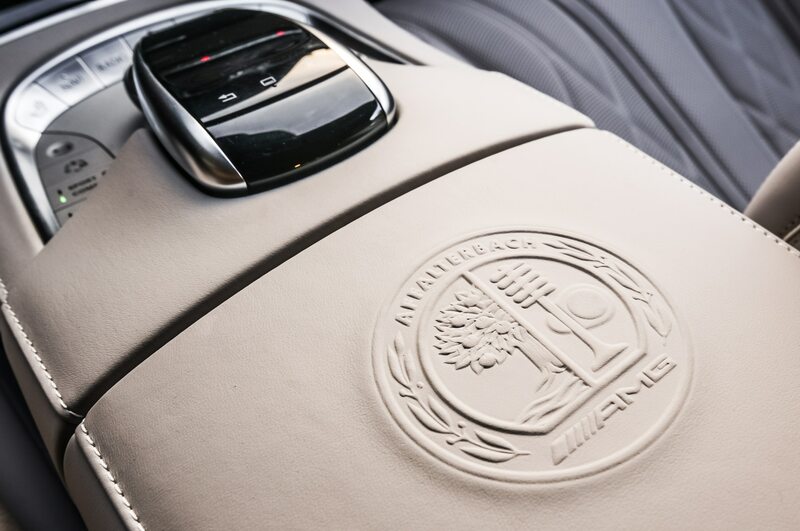 We don’t know whether the S65 AMG badge would impress Ms. 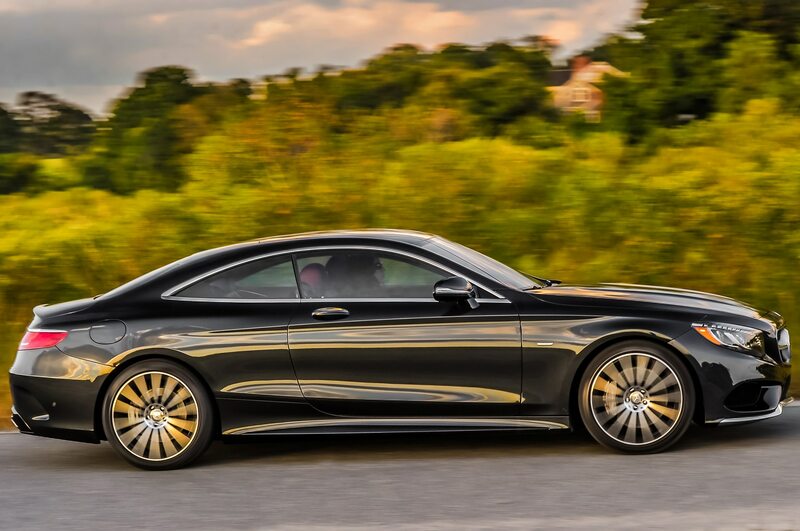 Swift, but one suspects that the leaders of the old Cincinnati syndicate in Watch Hill would approve. 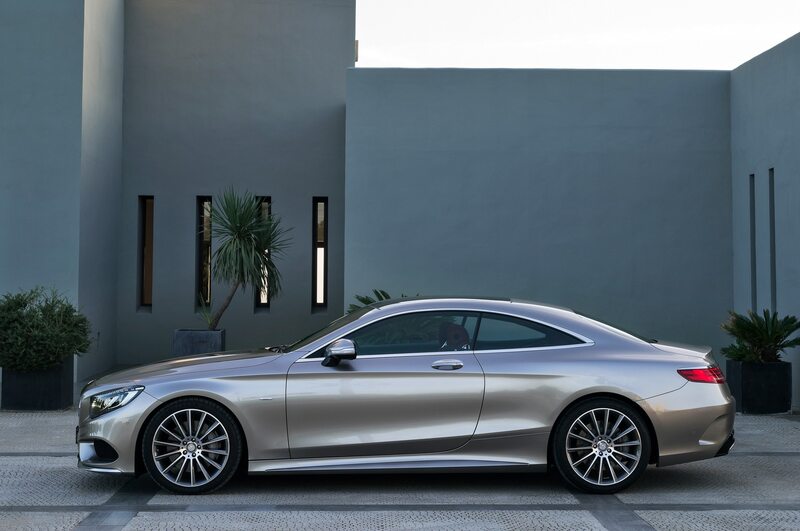 Clash of the super luxe titans.